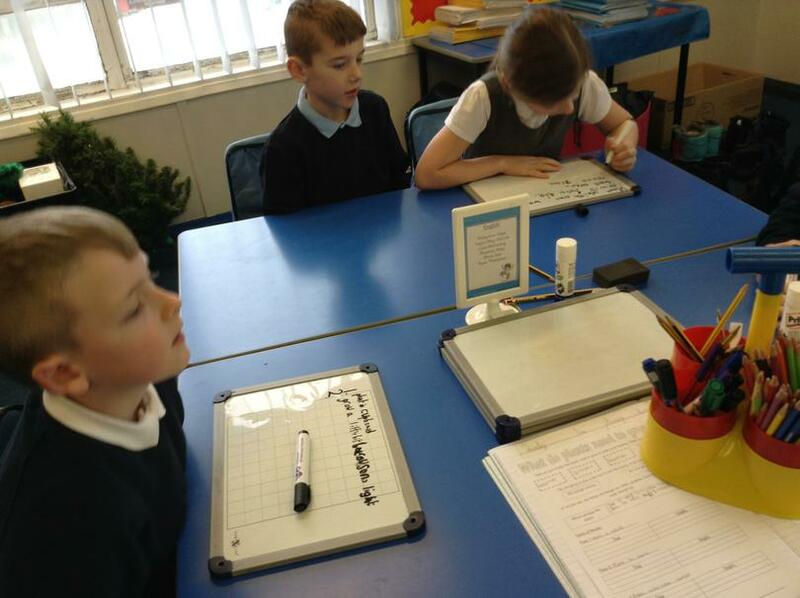 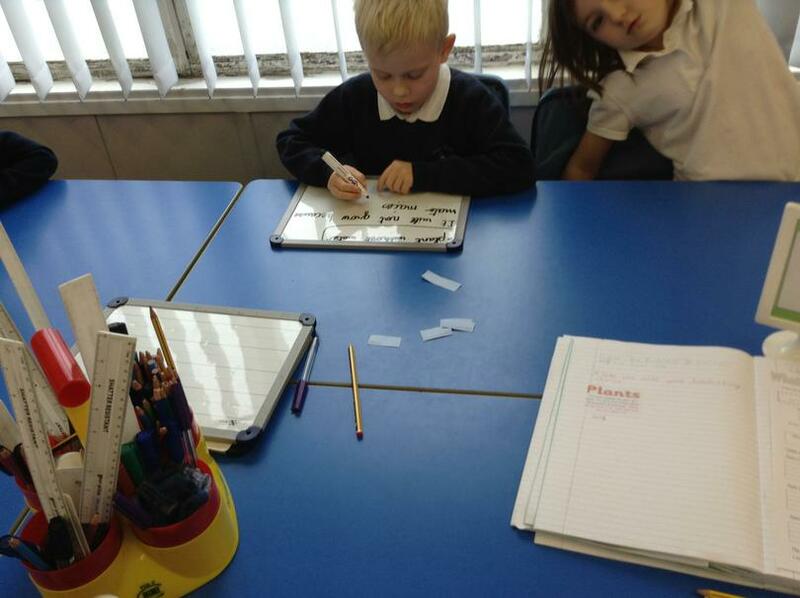 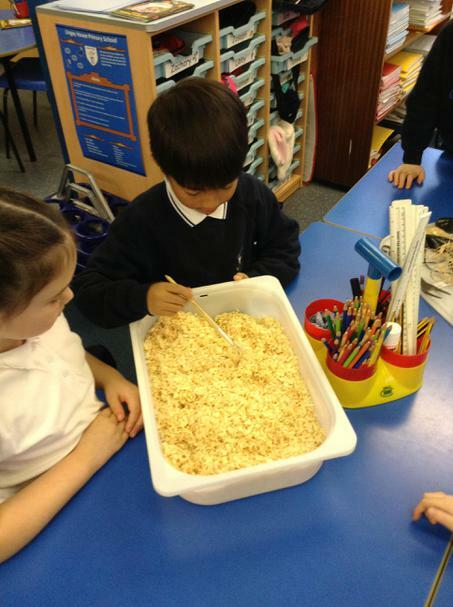 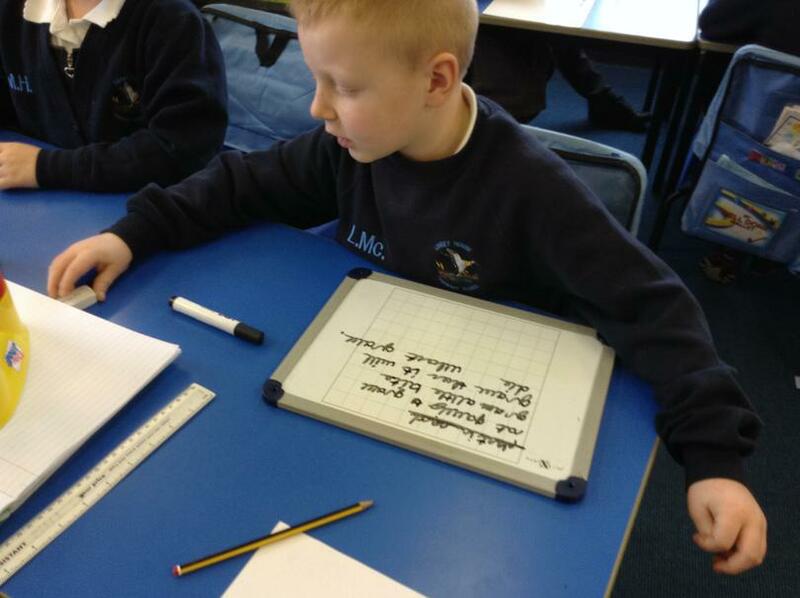 This week in our Maths we have been looking at capacity. 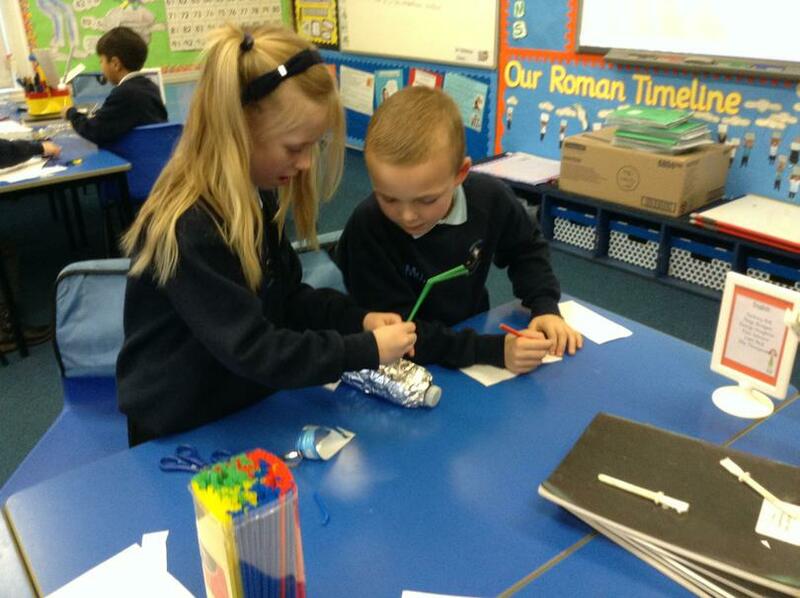 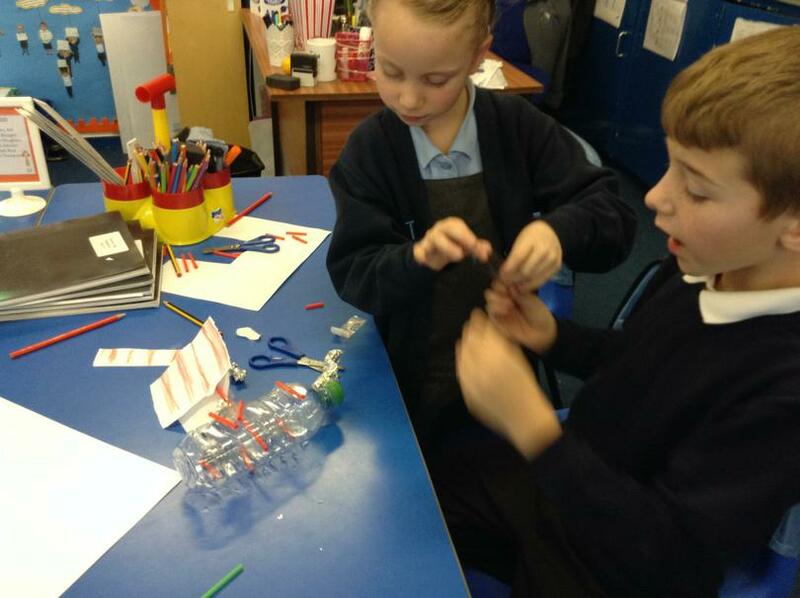 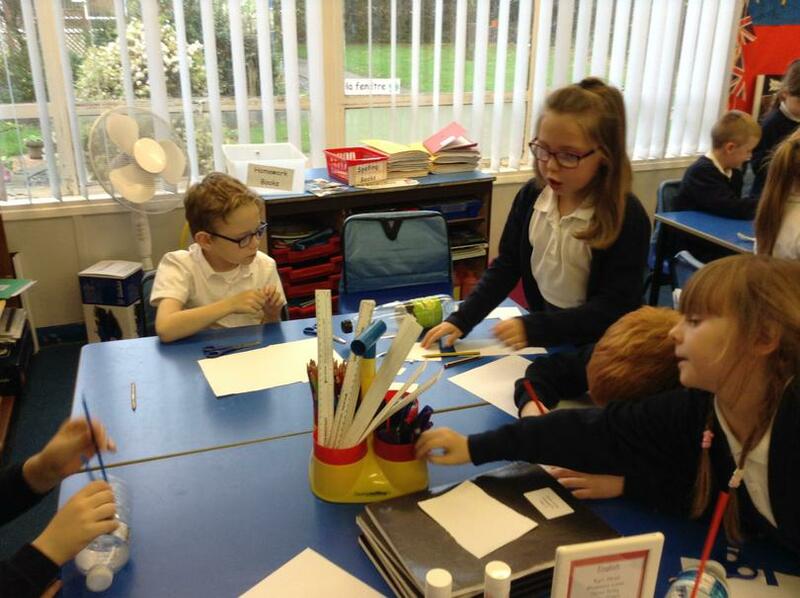 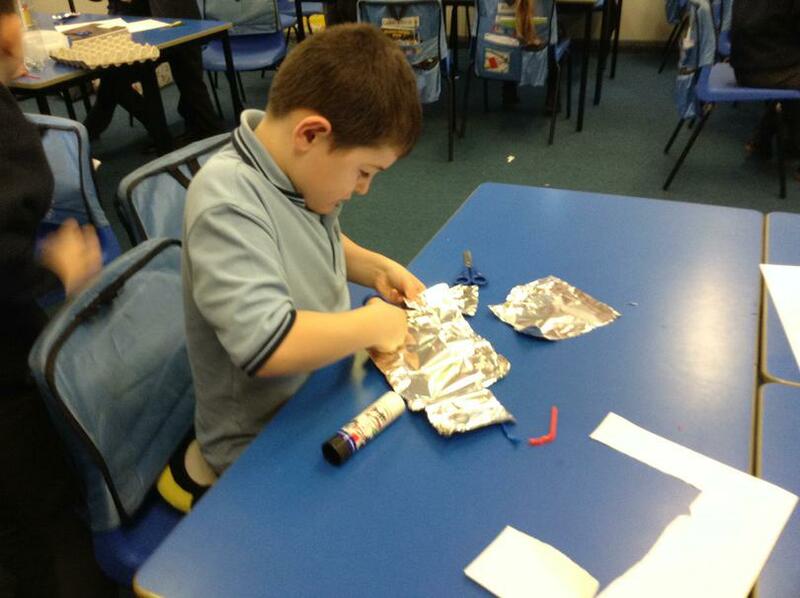 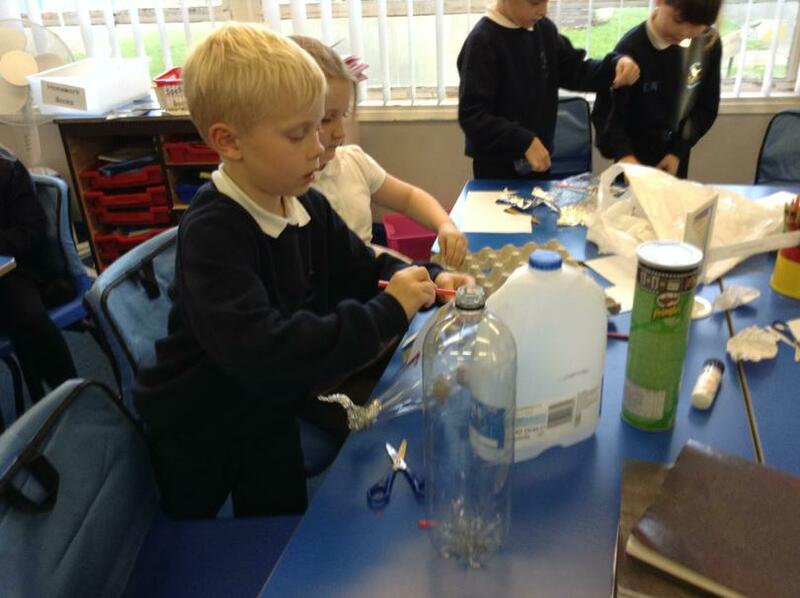 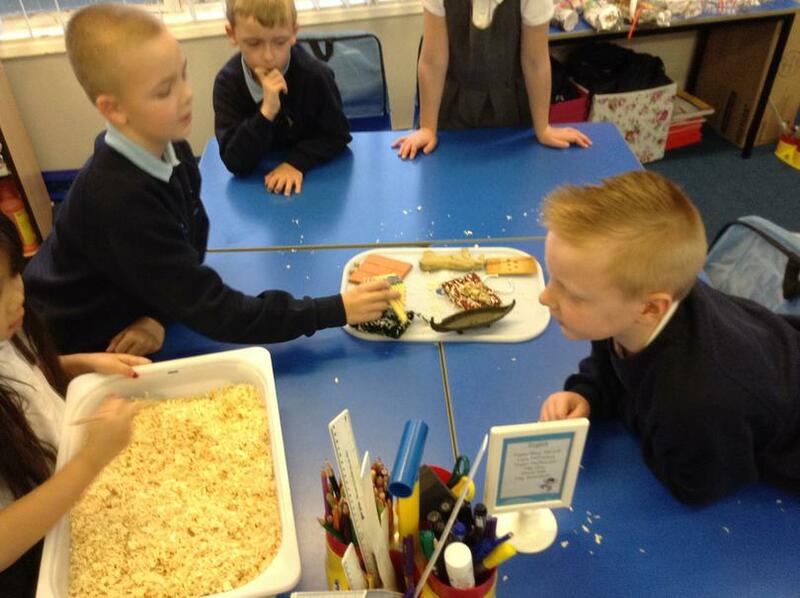 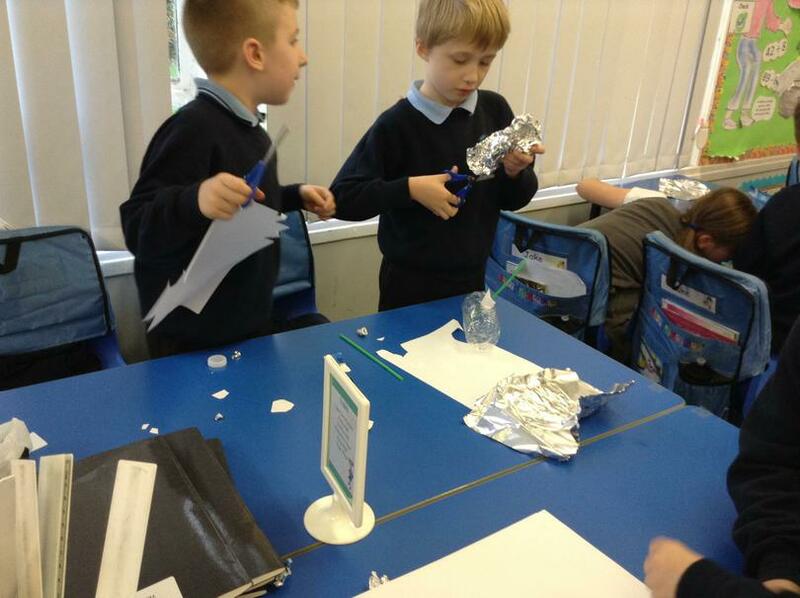 Today, we had a special class with Miss Hewitt where we have used our skills to create potions. 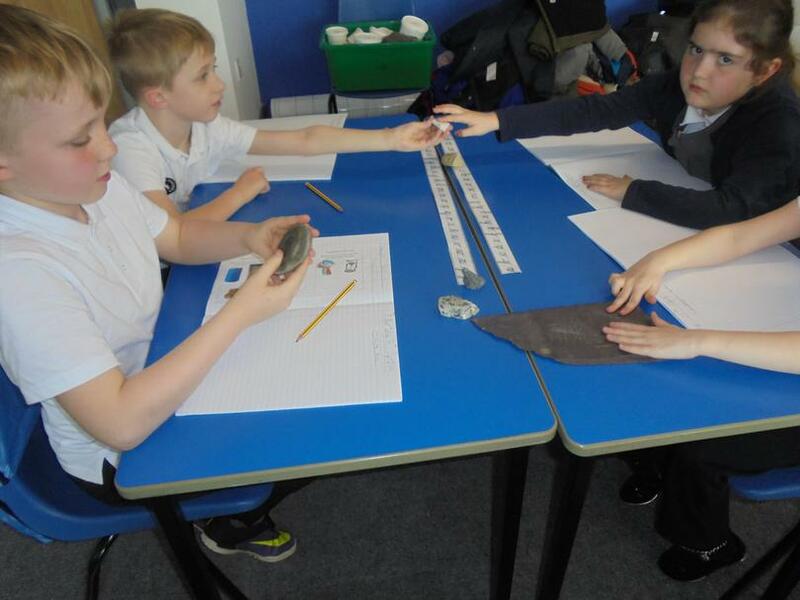 It was important that we were able to measure the capacity of different liquids but also important that we were able to read a scale. 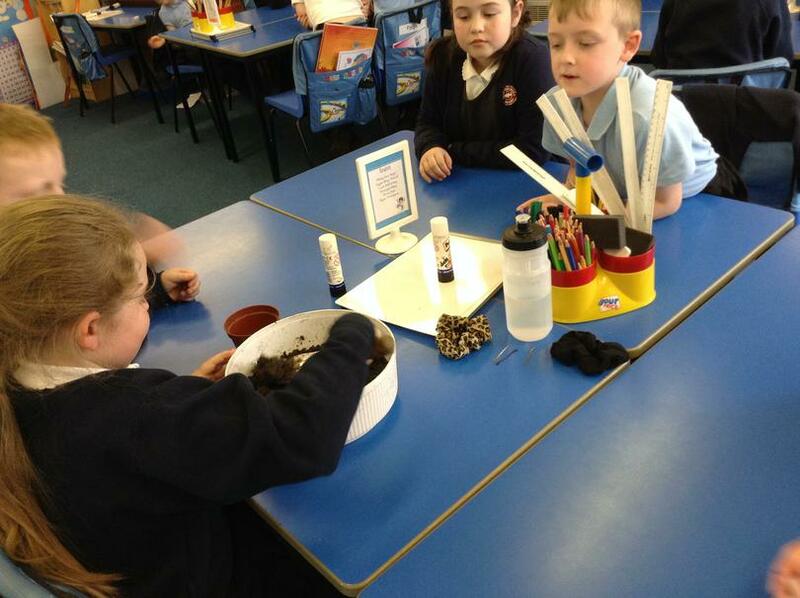 We had a great time mixing different ingredients, such as liquid Lobalug venom, blended rose thorns and liquidised Scarab beetle. 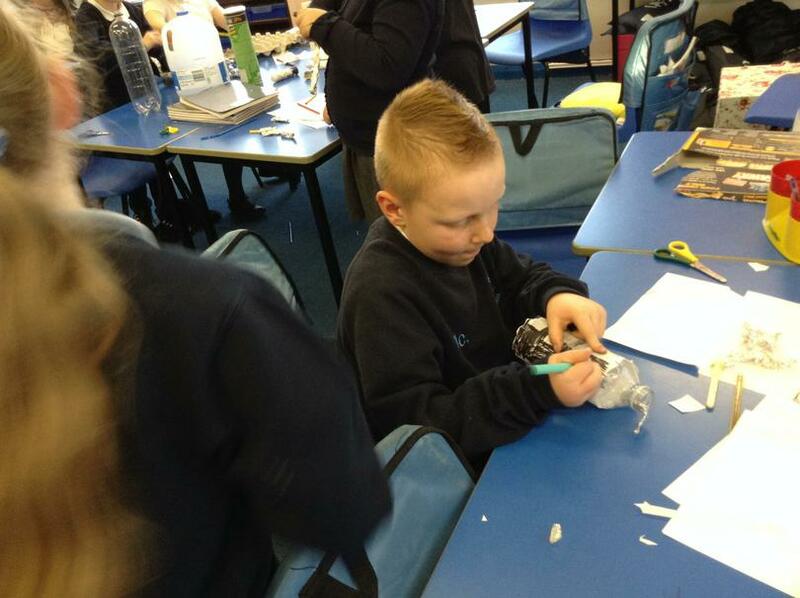 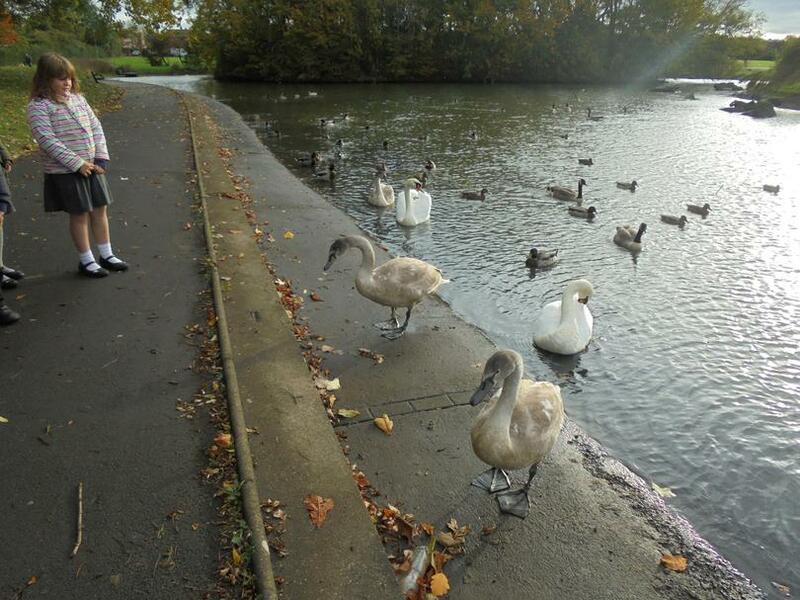 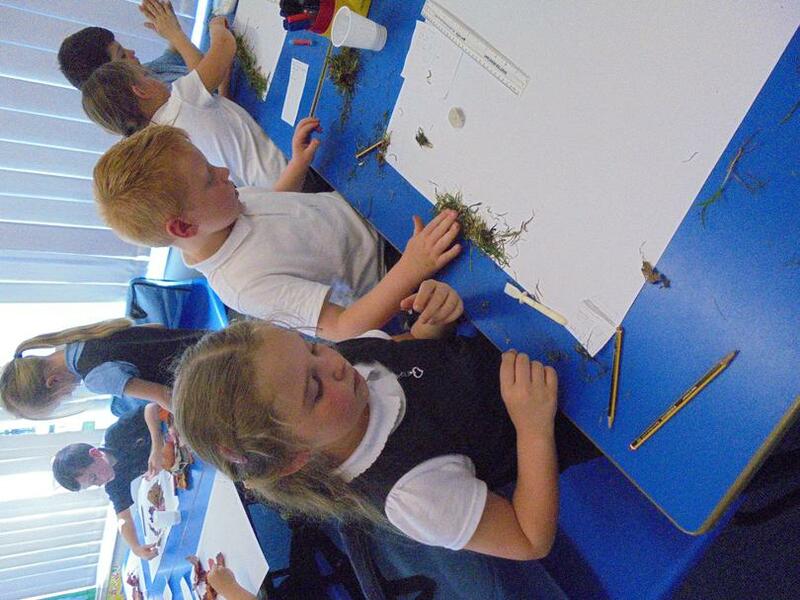 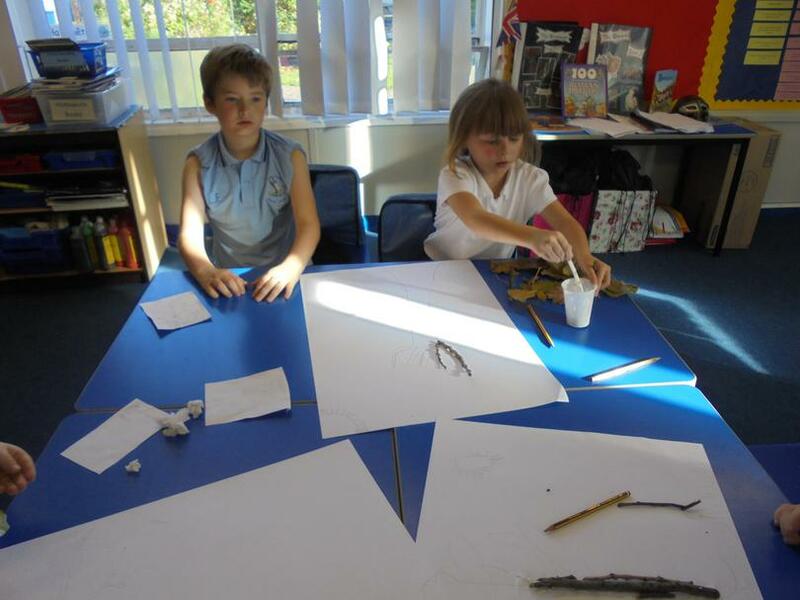 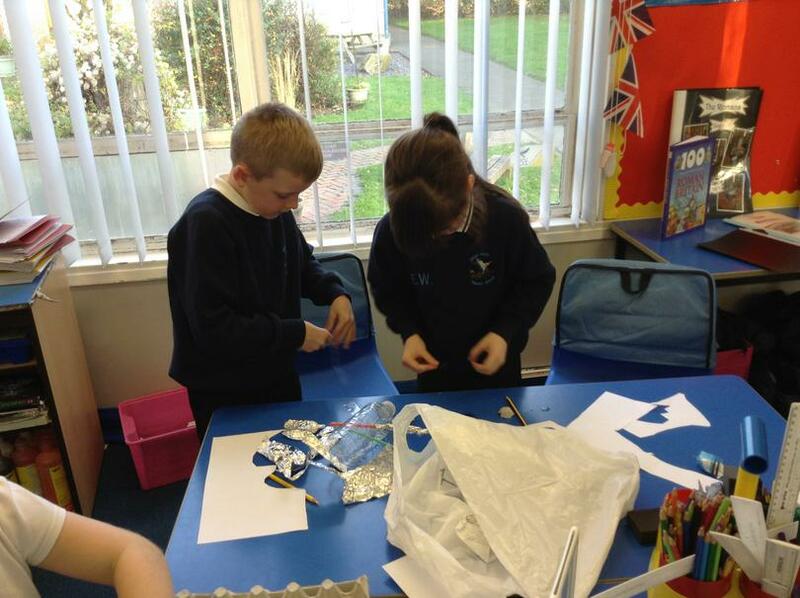 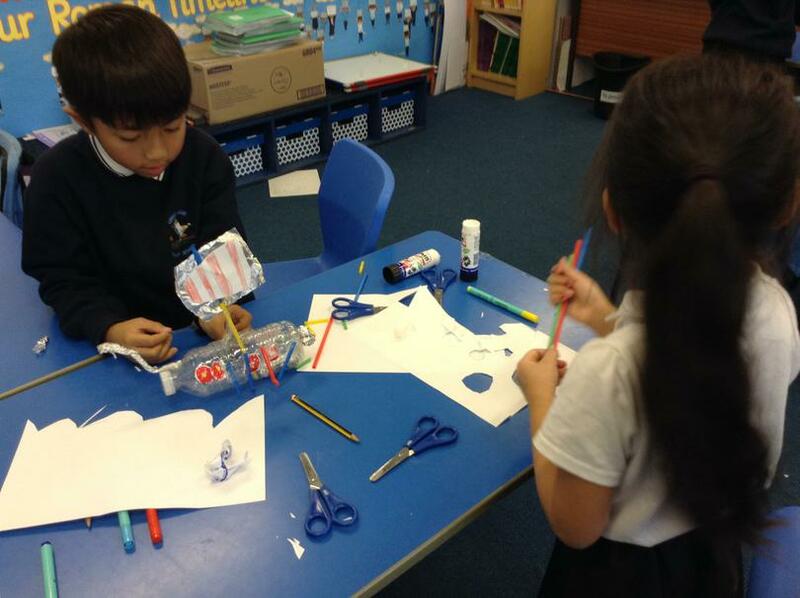 This half term our Creative Curriculum topic is the British Isles and we have been focussing on rivers and bridges. 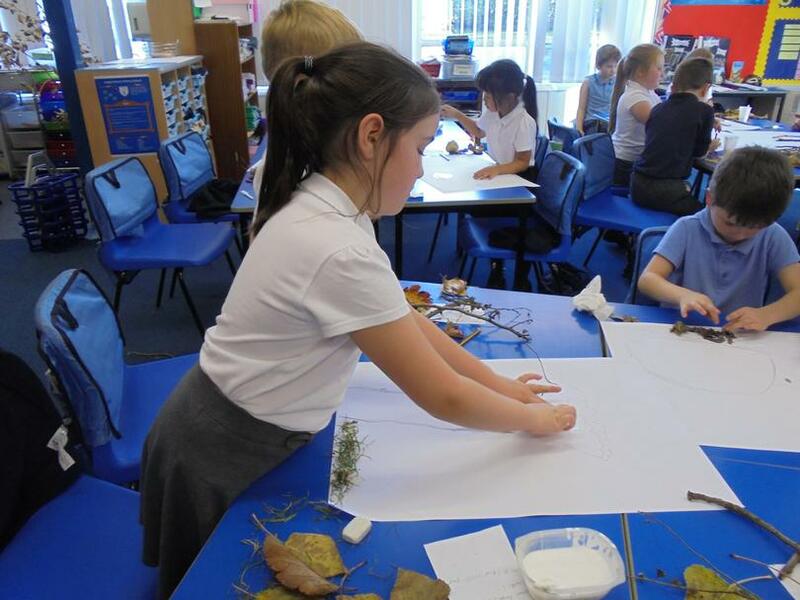 We were lucky enough to receive a visit from Pippa Bell and who shared lots of beautiful paintings with us of bridges and rivers from all over the British Isles. 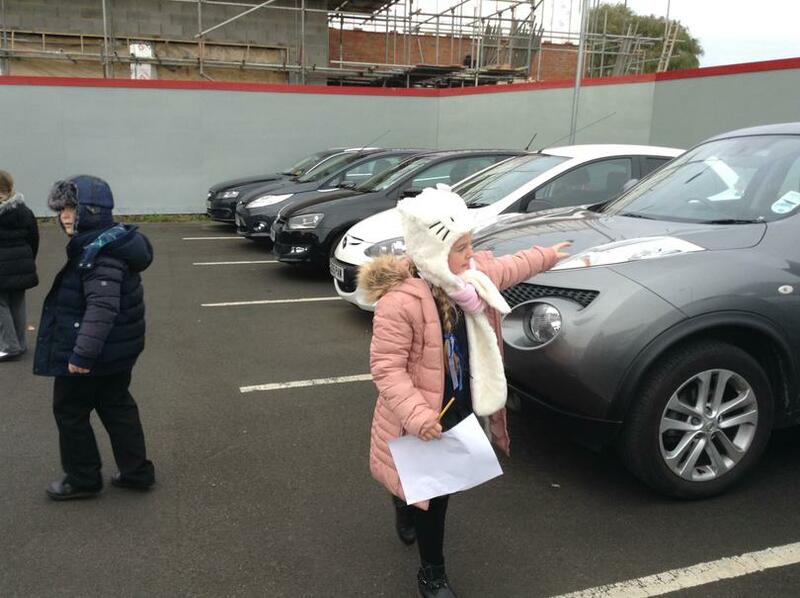 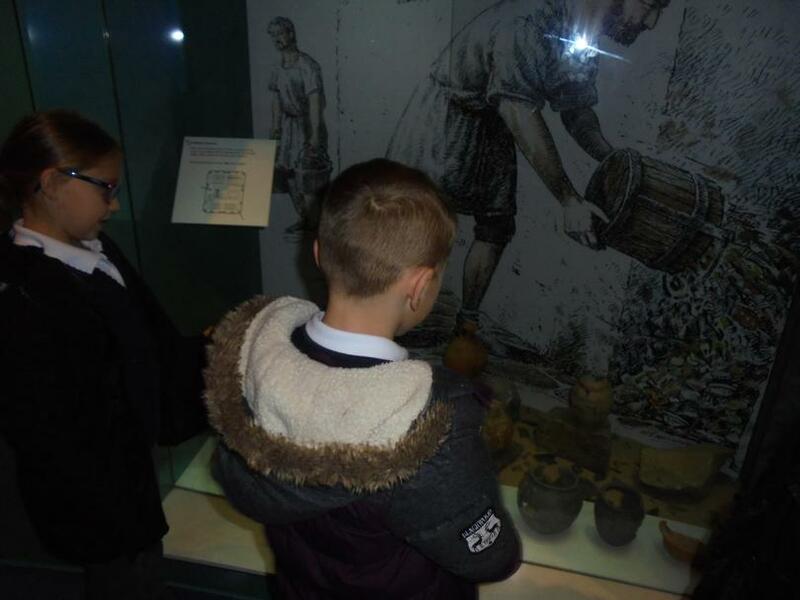 We also looked at the different jobs people would have and how the jobs were influenced by the industries in our local area. 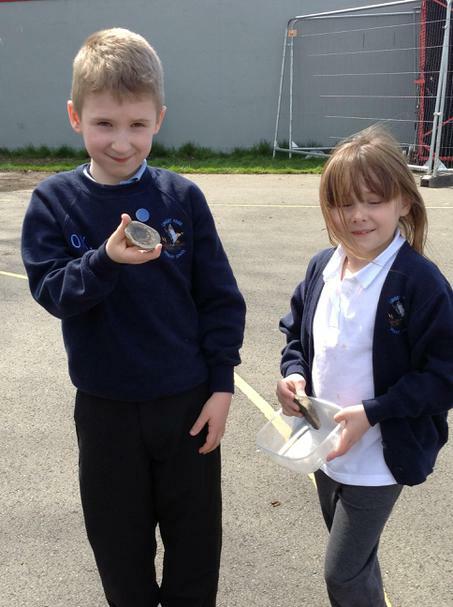 This half term our topic in Science is rocks. 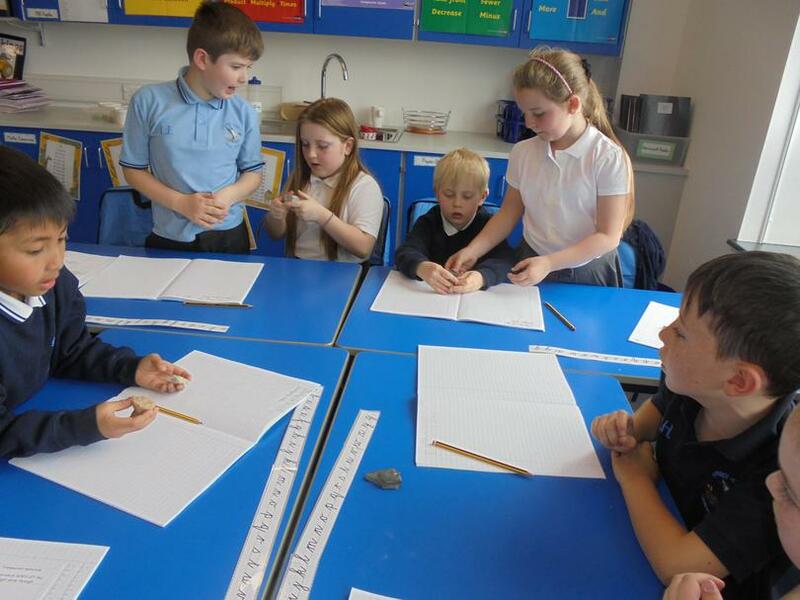 So far, we have looked at different kinds of rocks and how we could classify them. 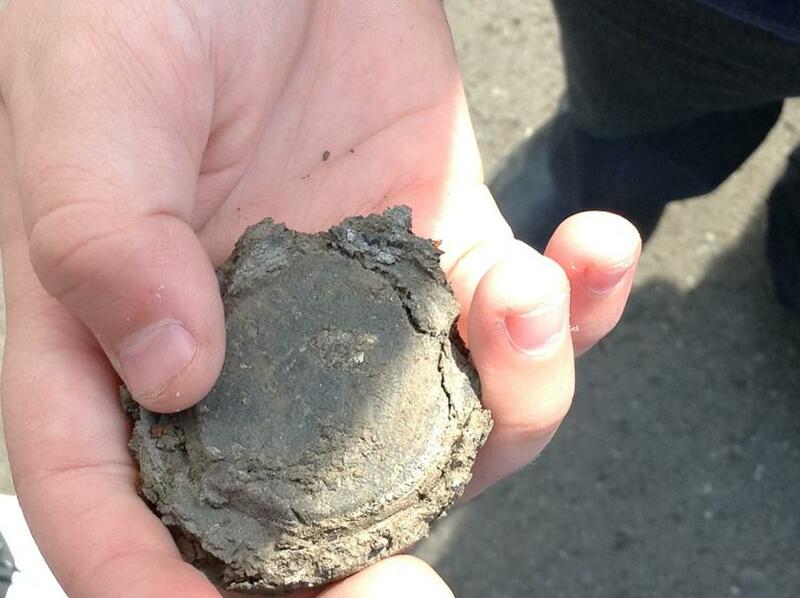 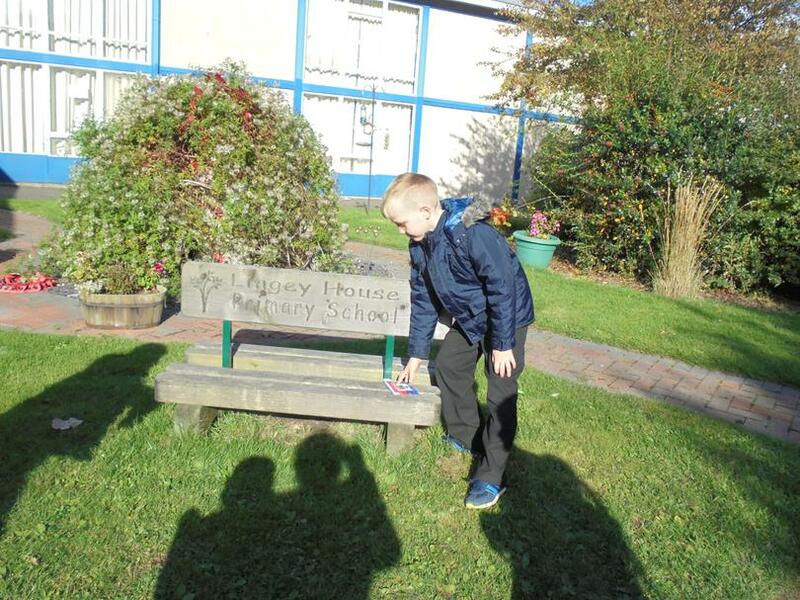 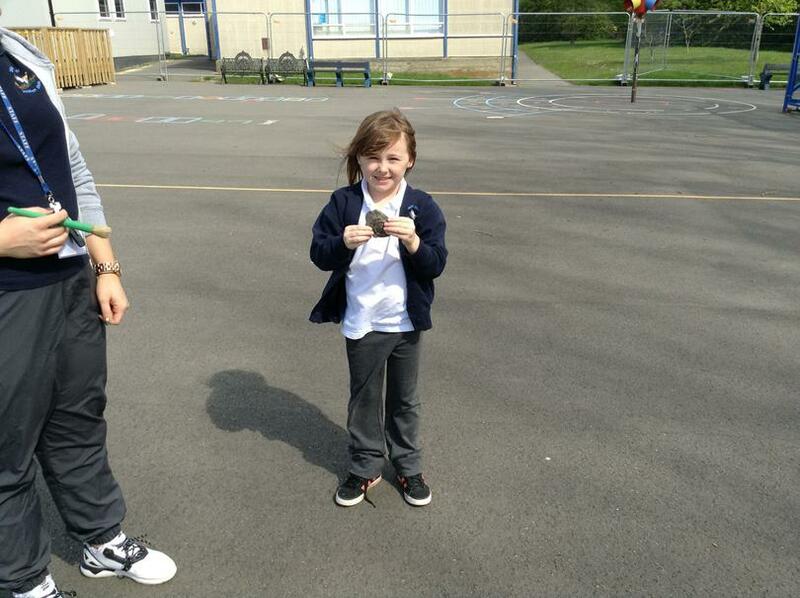 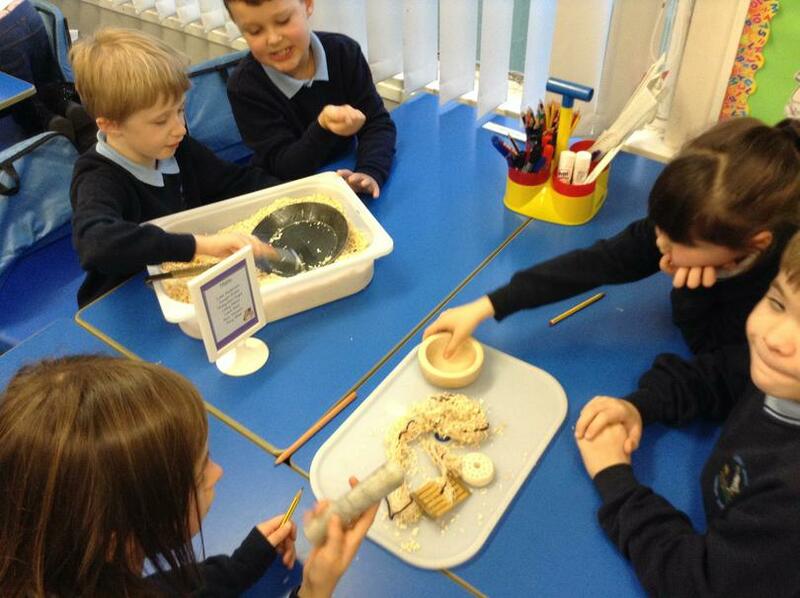 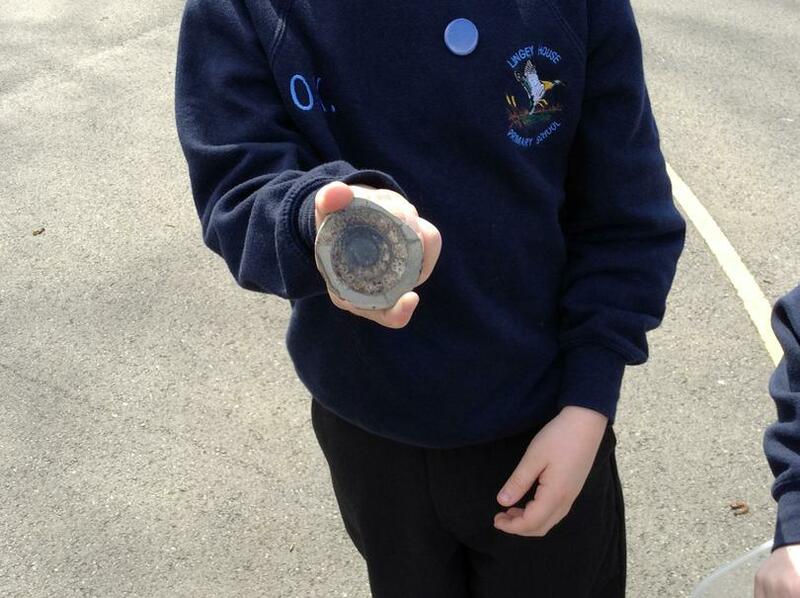 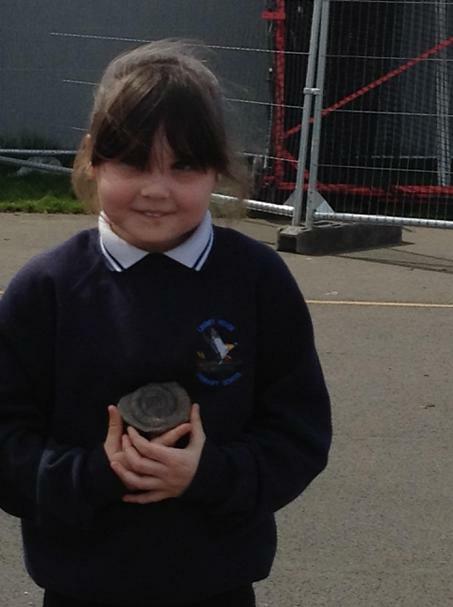 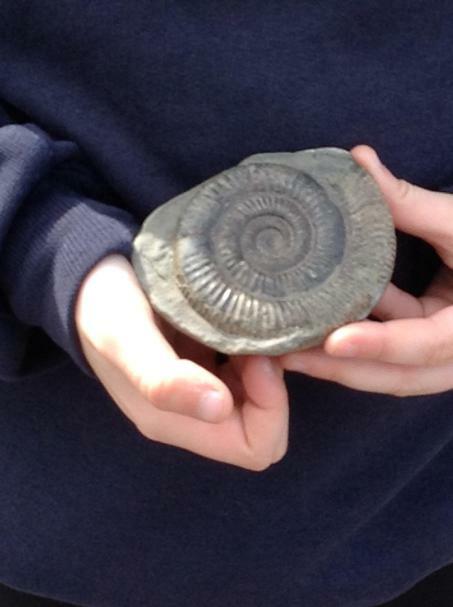 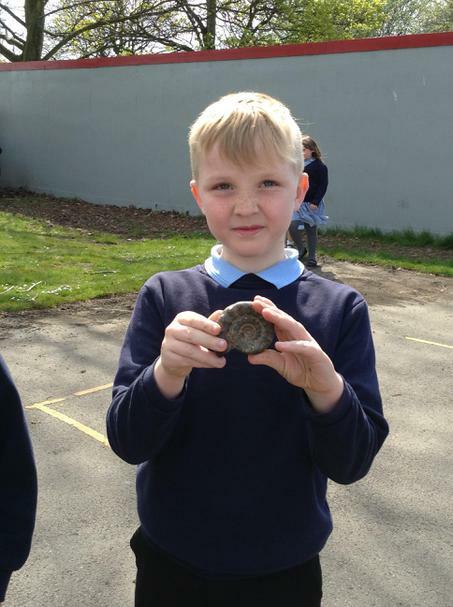 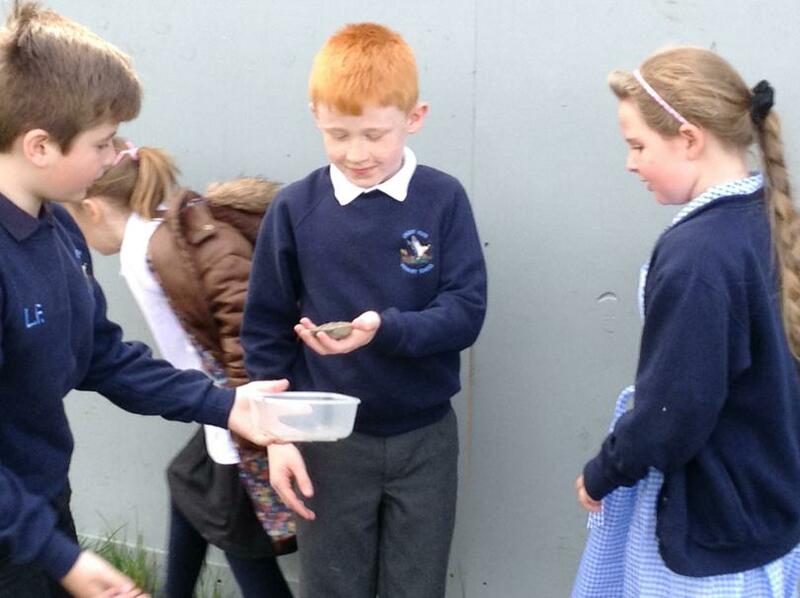 We have also completed a fossil hunt and looked at how fossils are created. 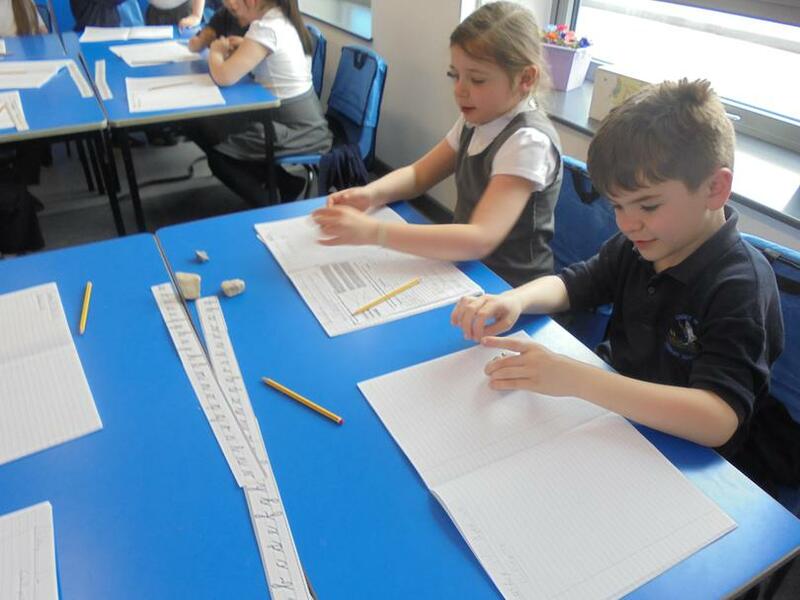 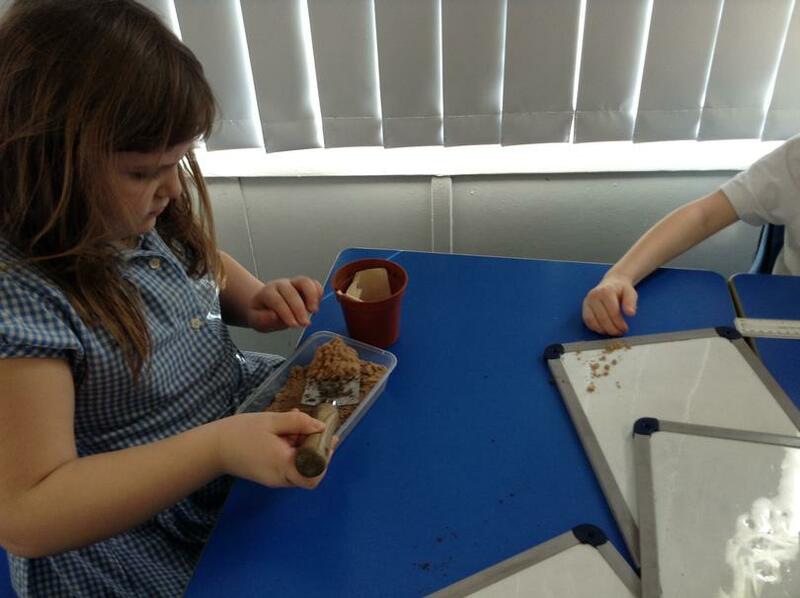 We are enjoying looking at the different uses of rocks and comparing different types of rocks. 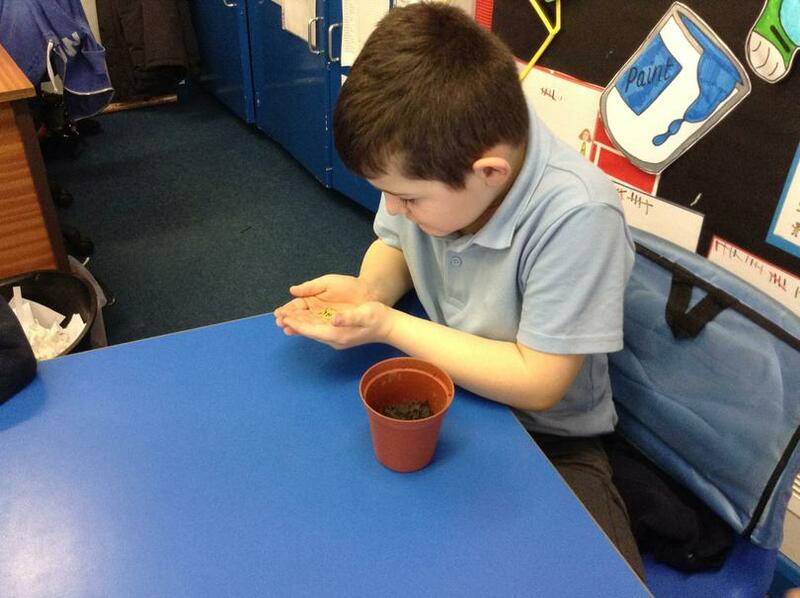 This half term in Science we have been looking at plants. 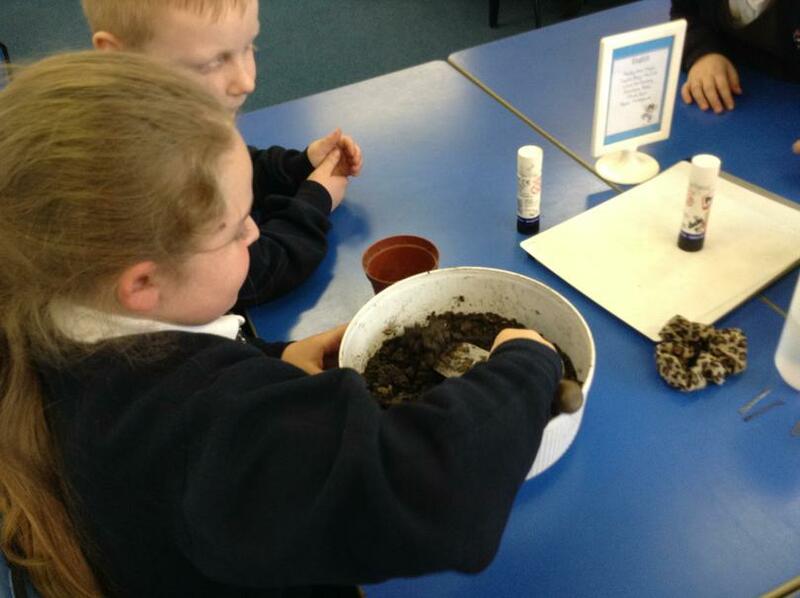 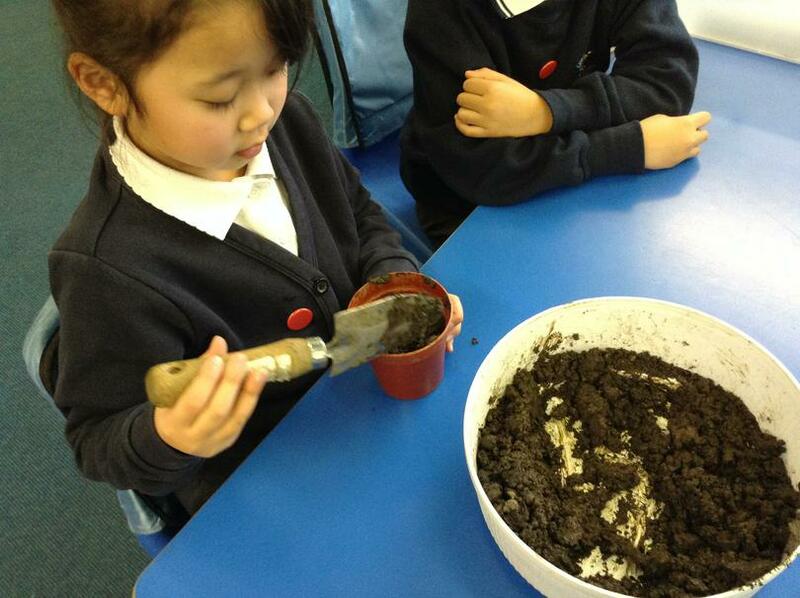 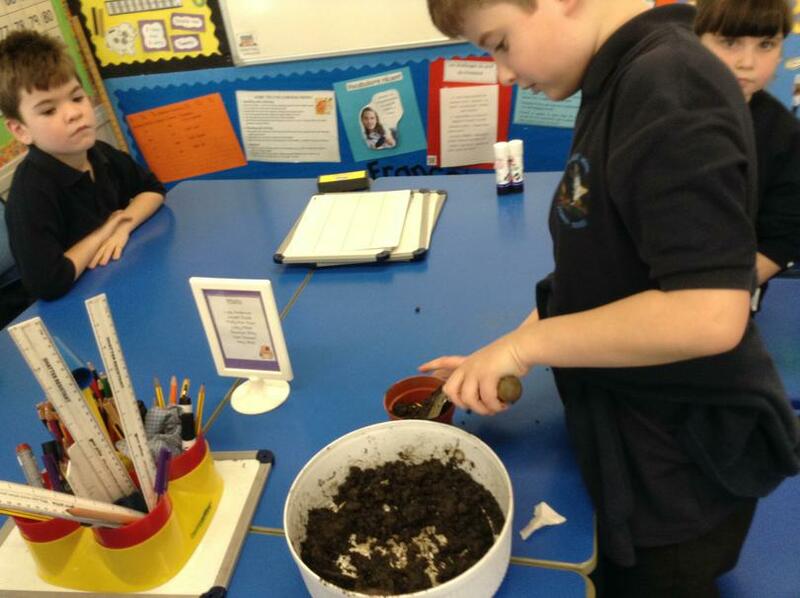 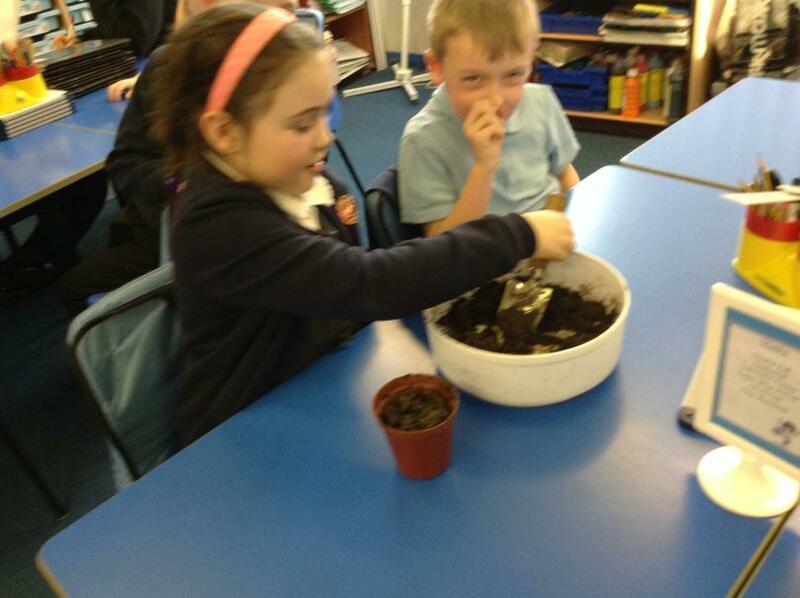 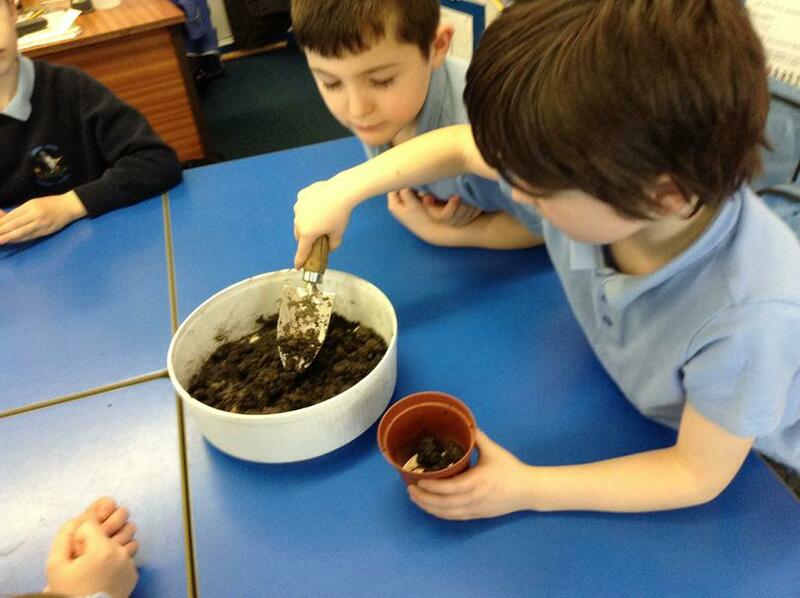 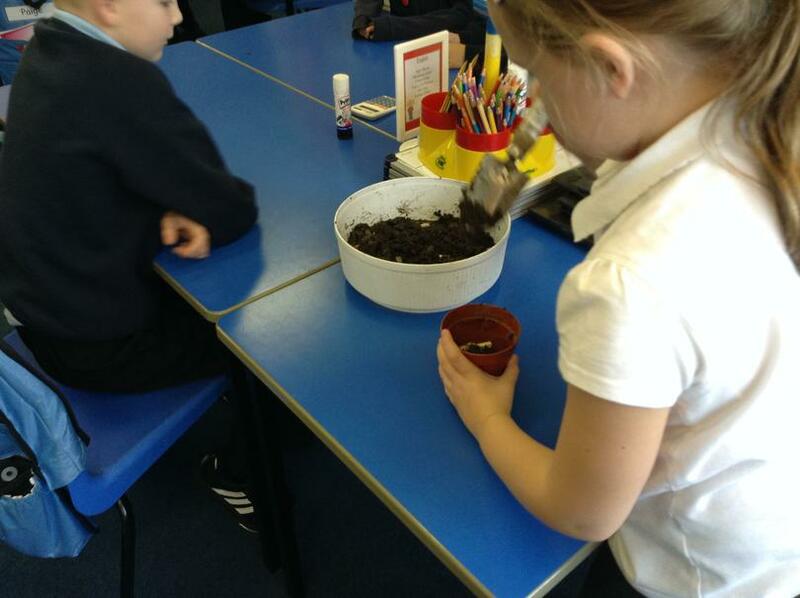 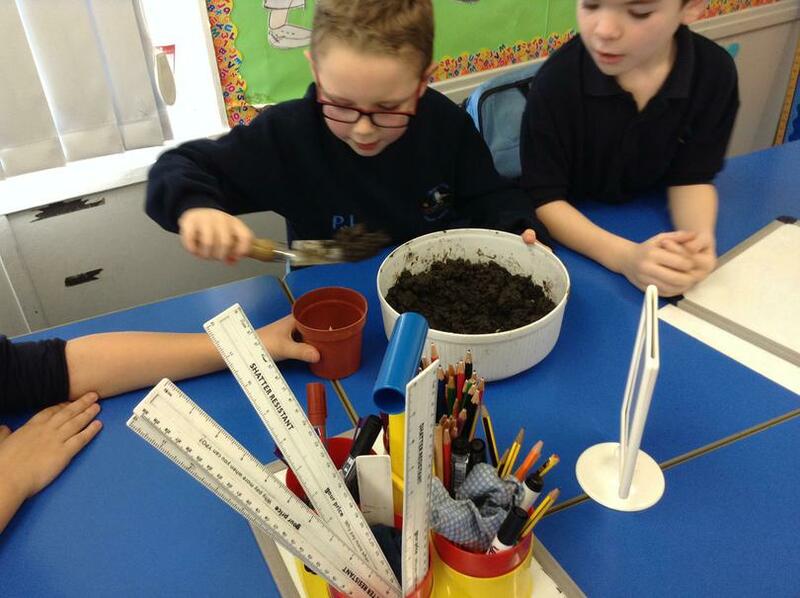 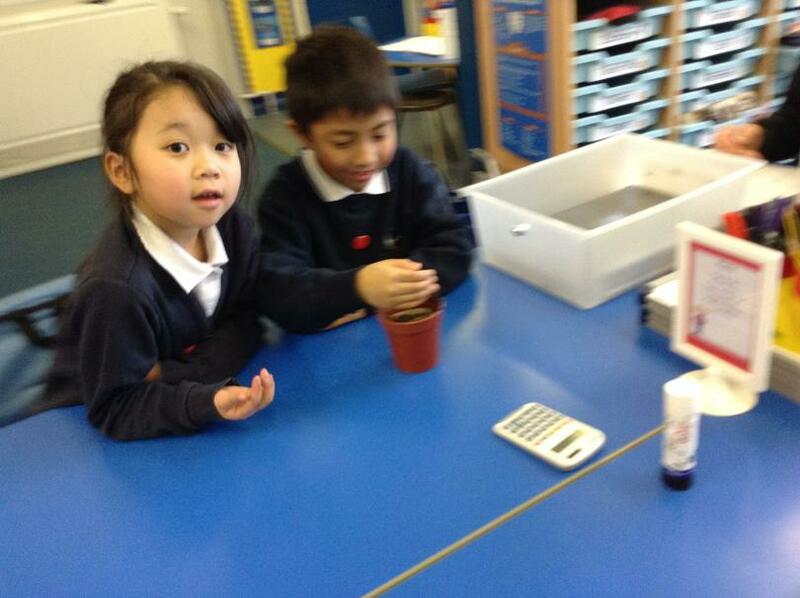 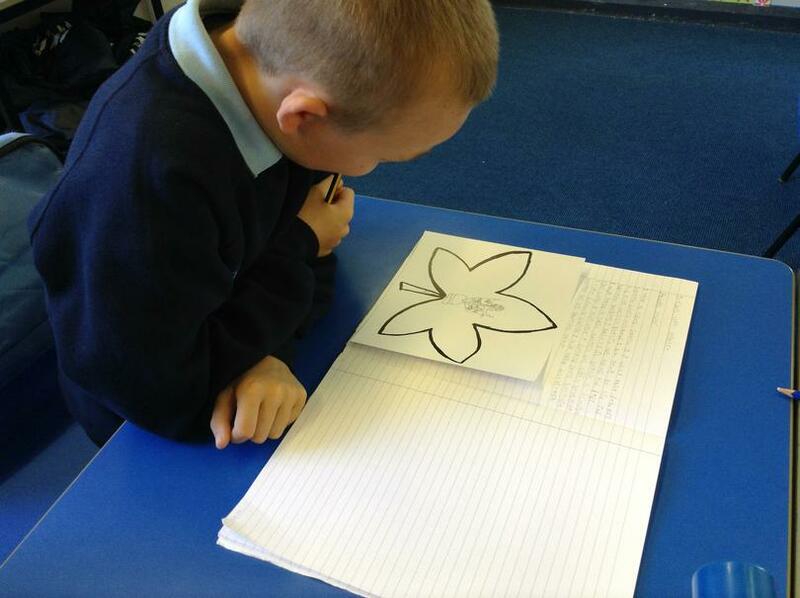 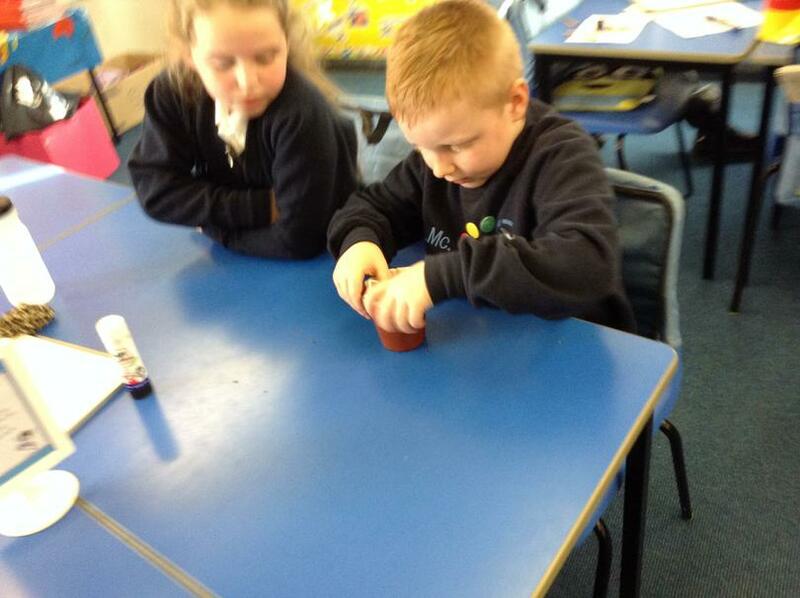 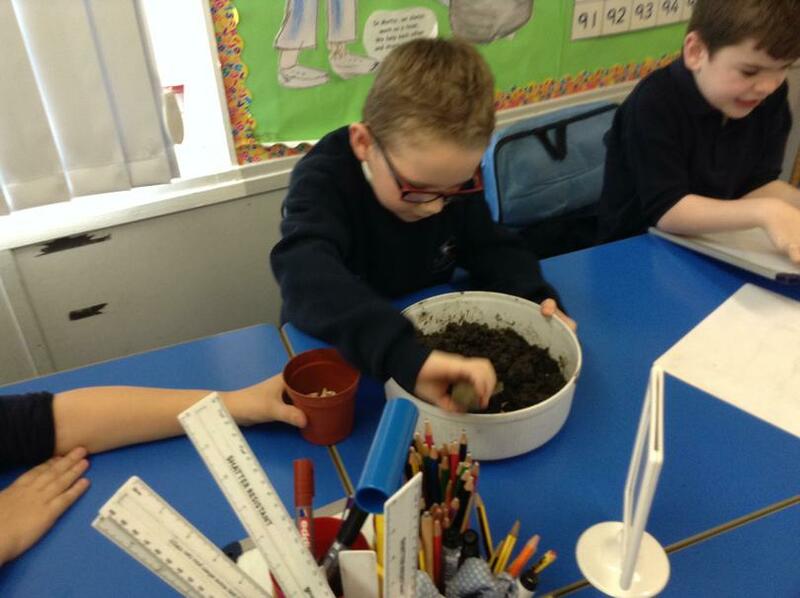 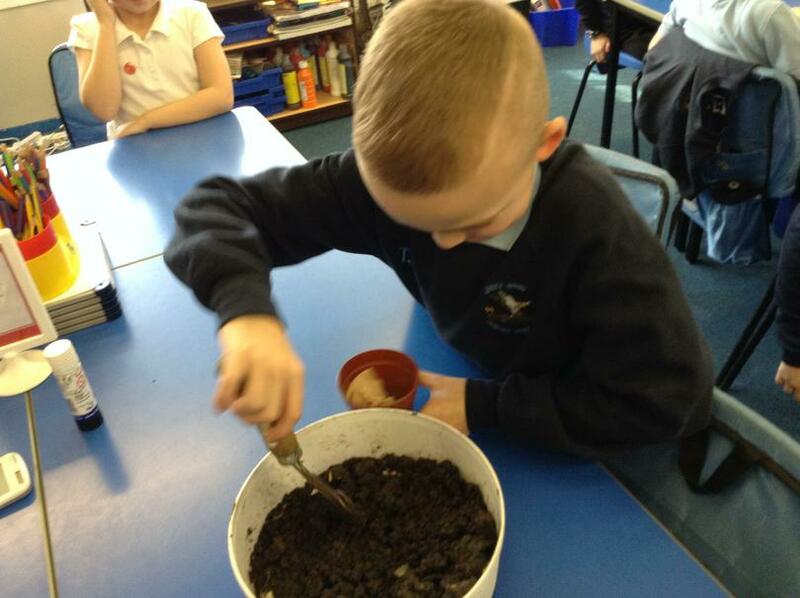 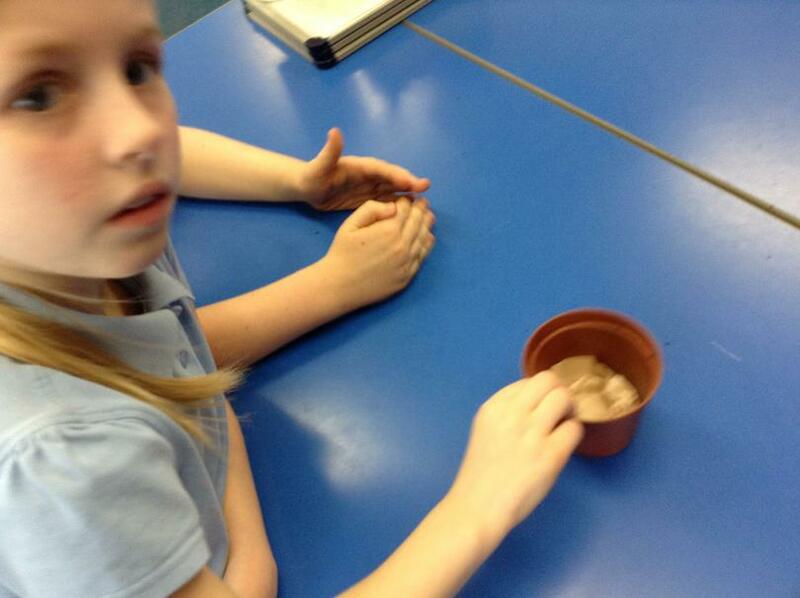 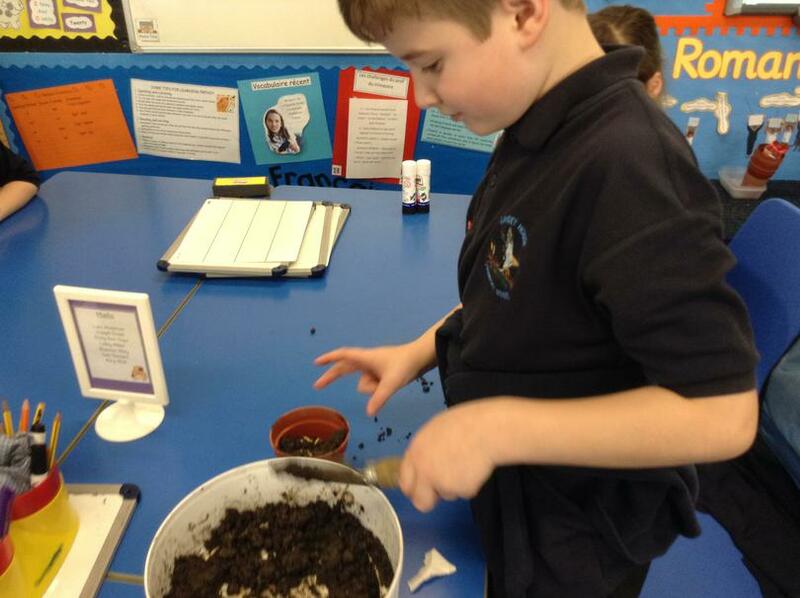 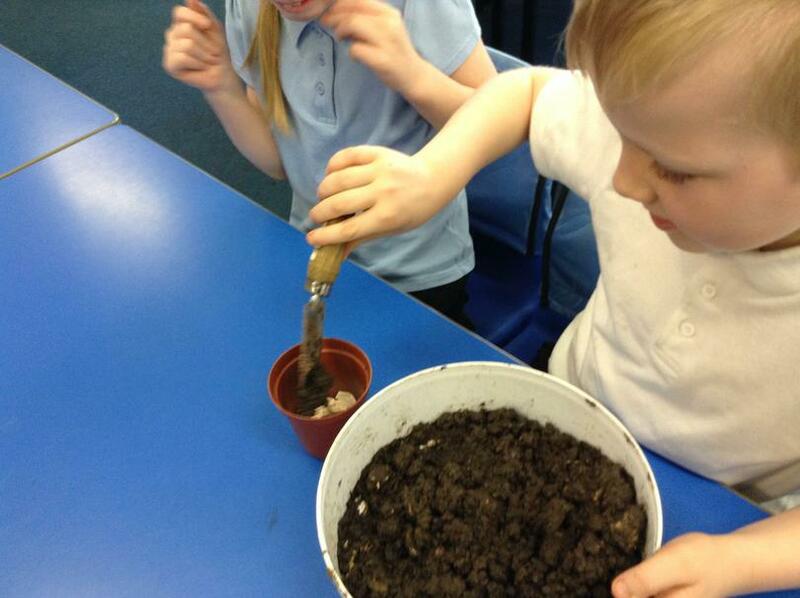 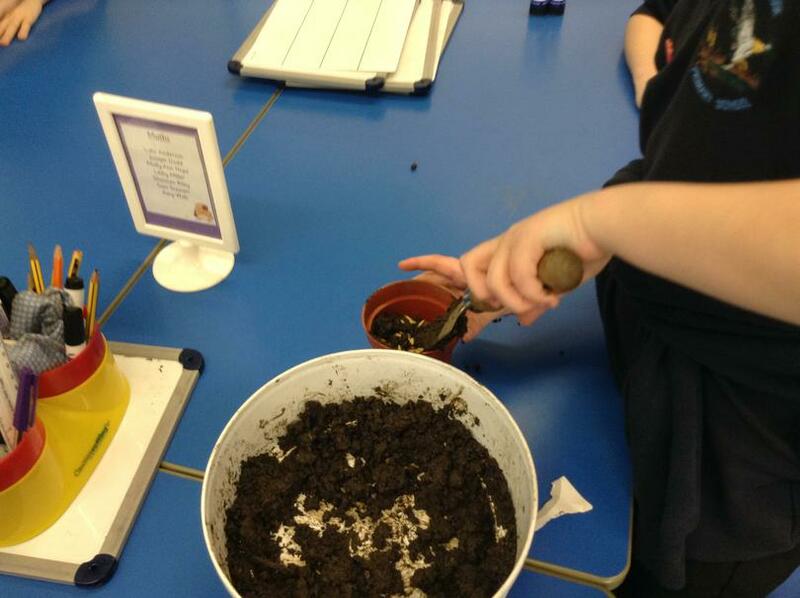 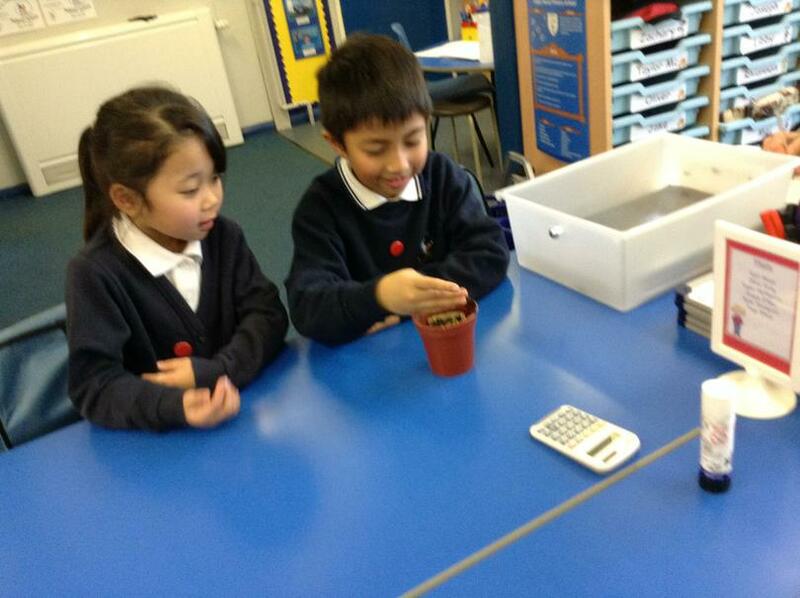 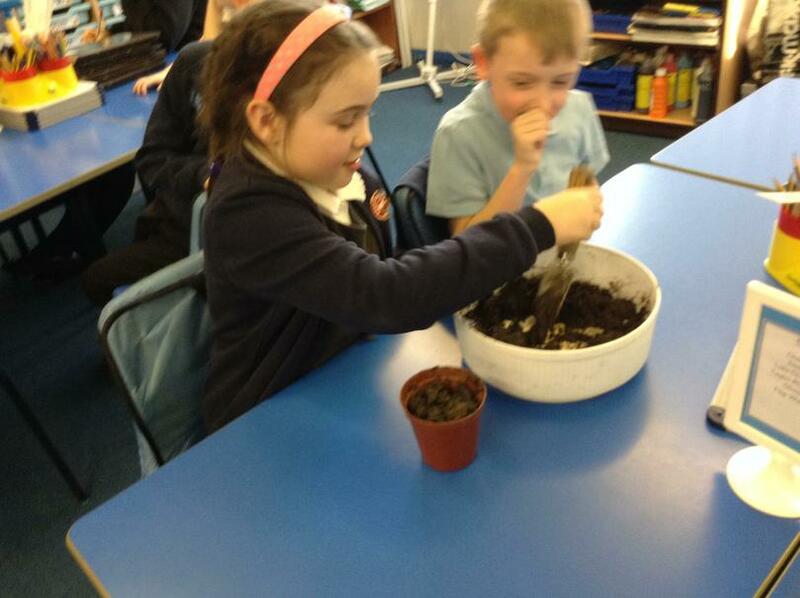 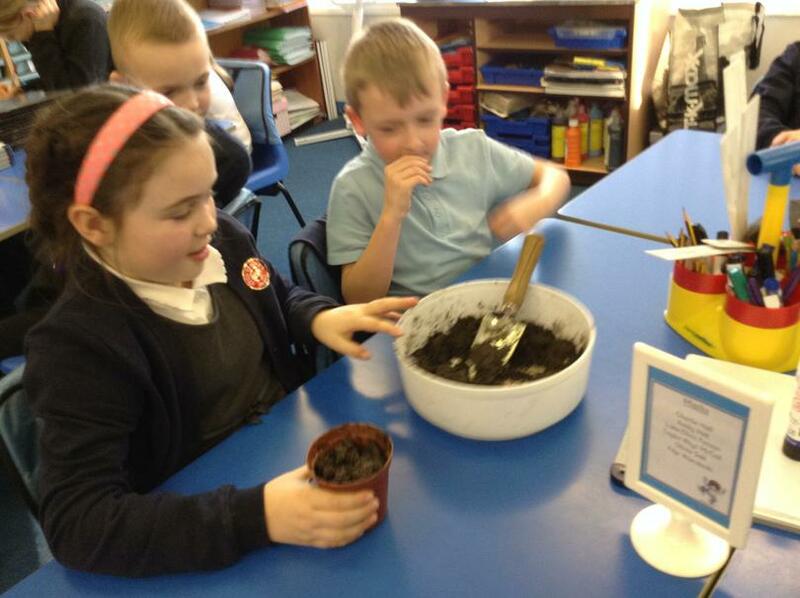 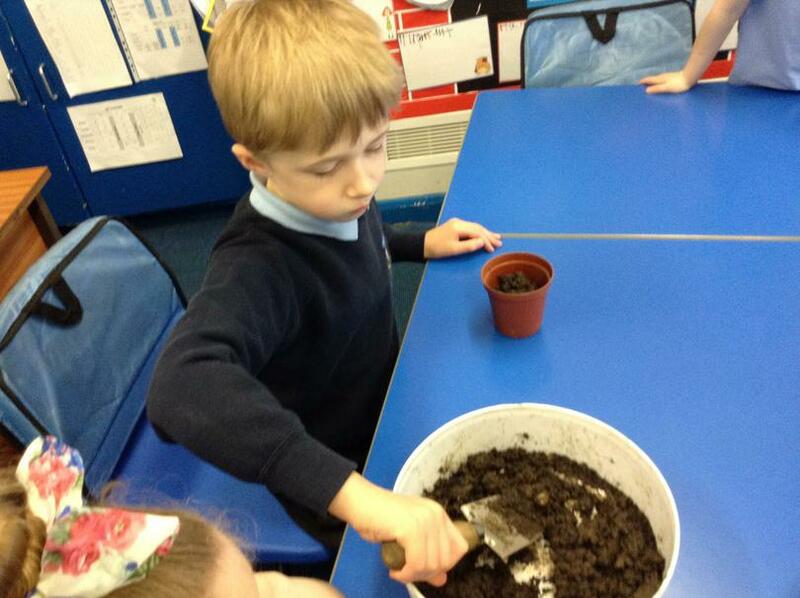 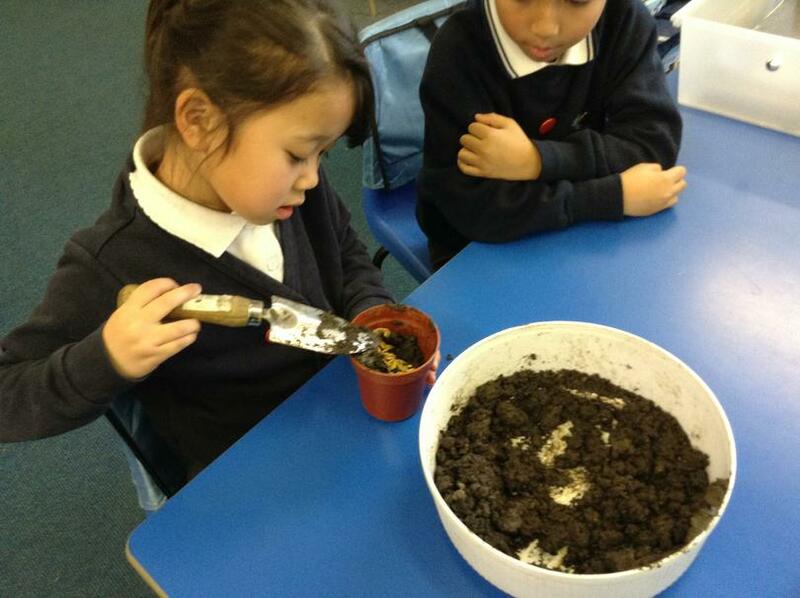 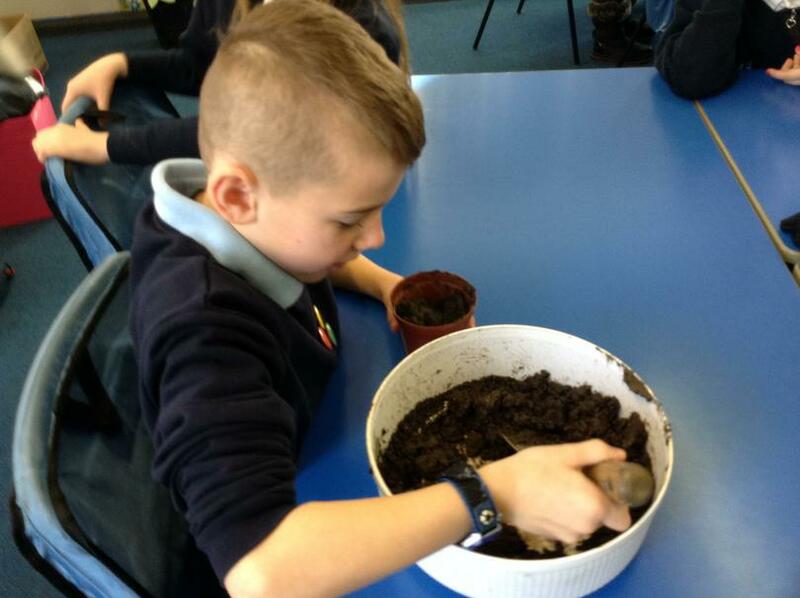 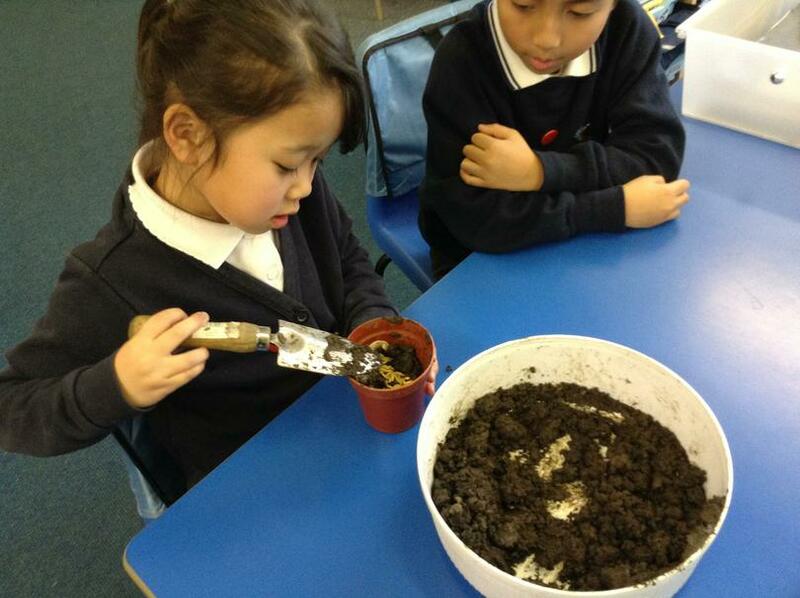 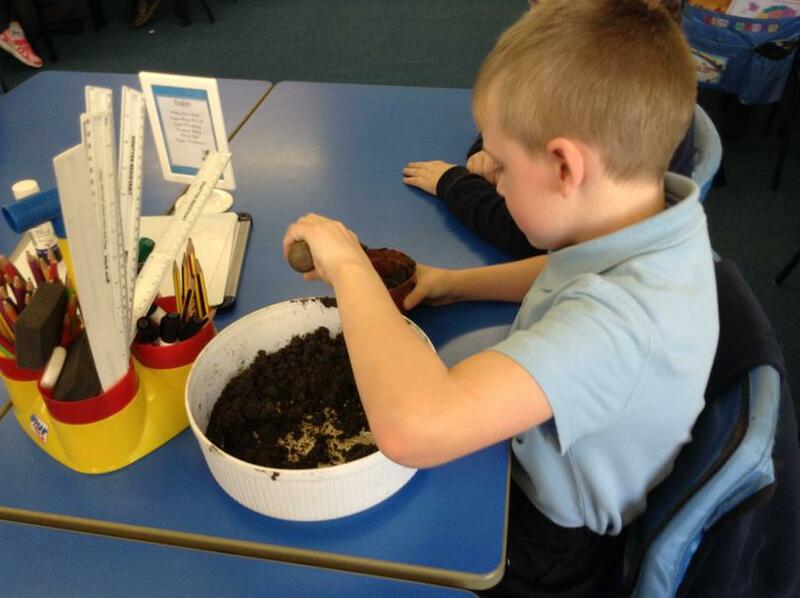 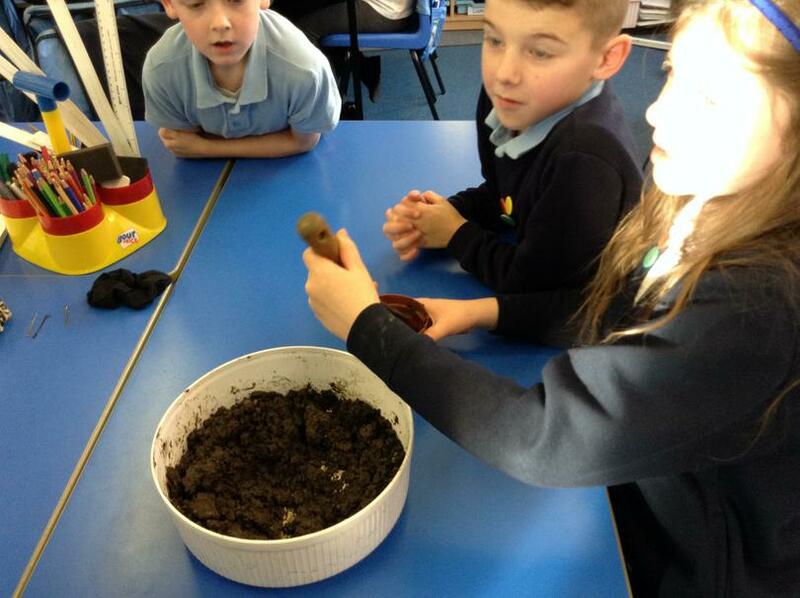 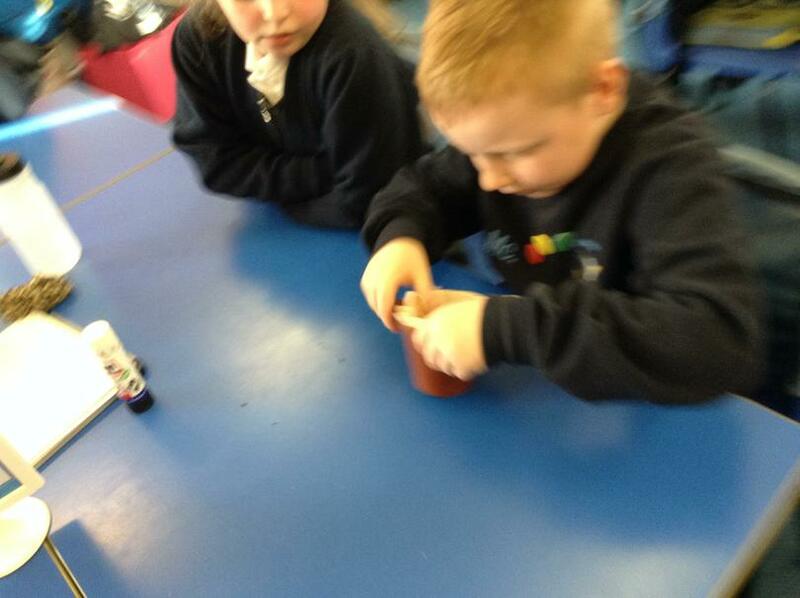 We have learnt about the different parts of a plant and we have been investigating what plants need to grow. 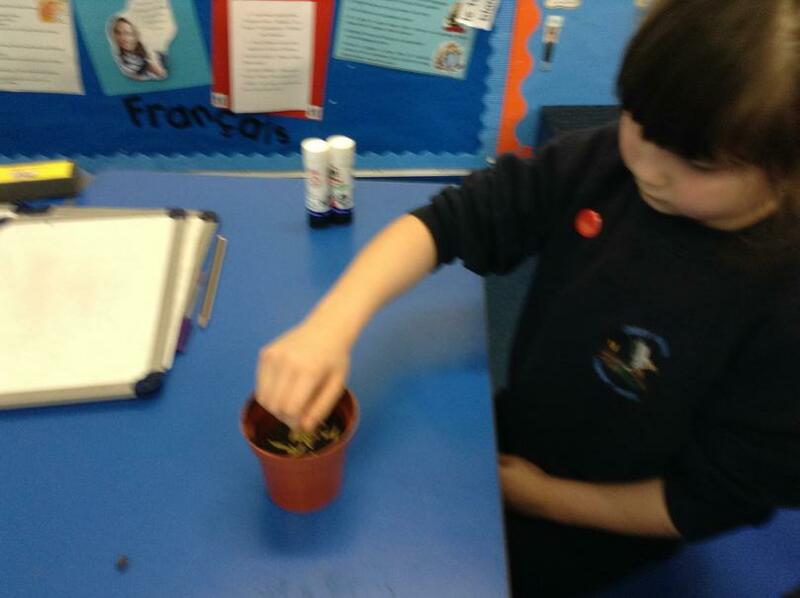 We have designed and set up an experiment to see what different things plants do need to grow and be healthy. 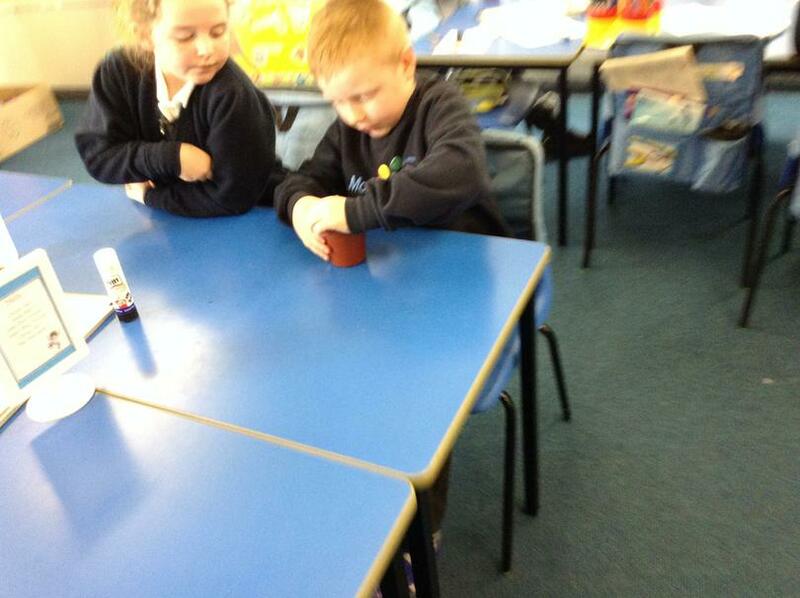 We decided to test this and have set up different plants around our classroom. 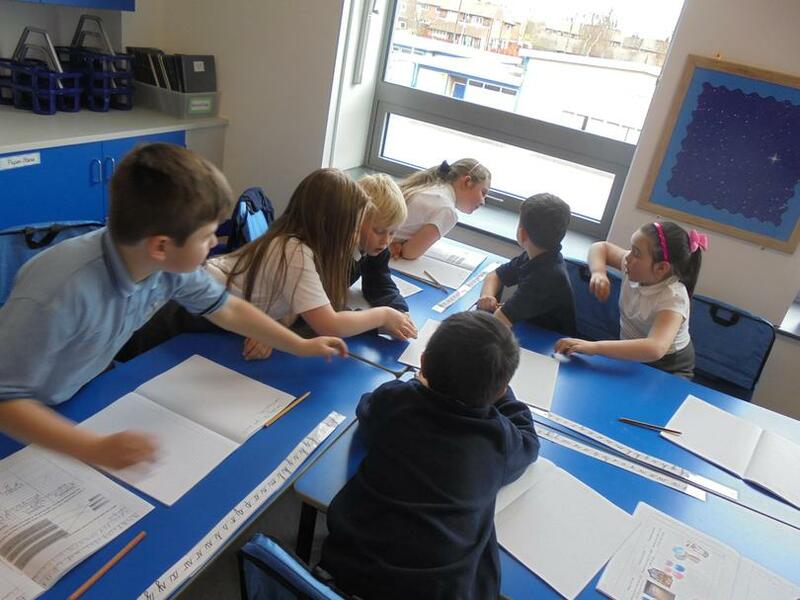 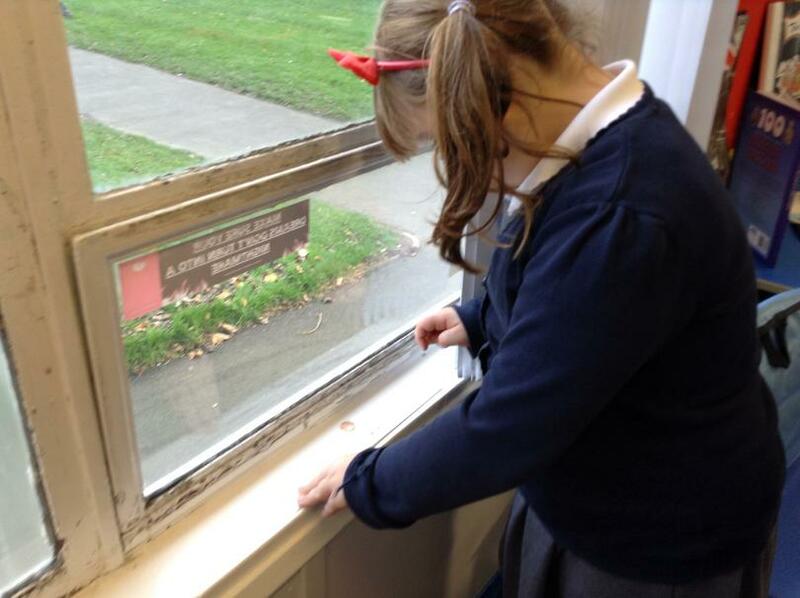 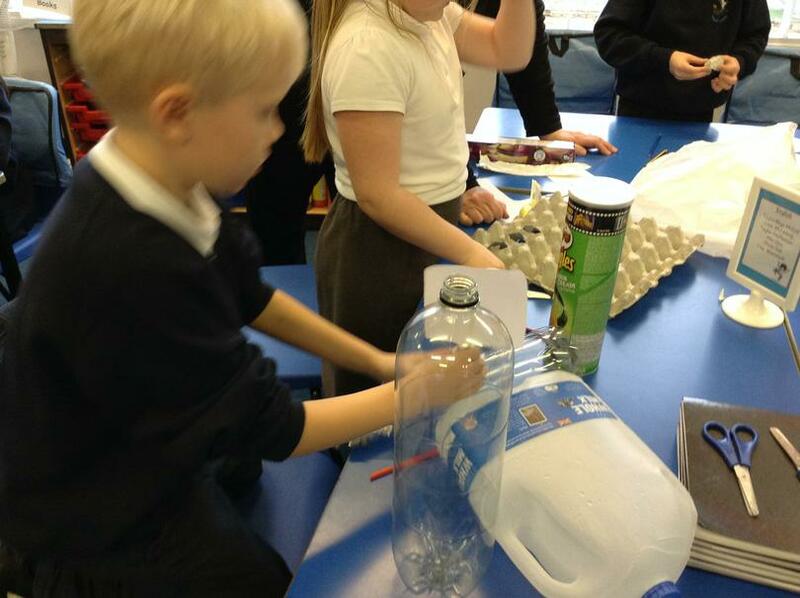 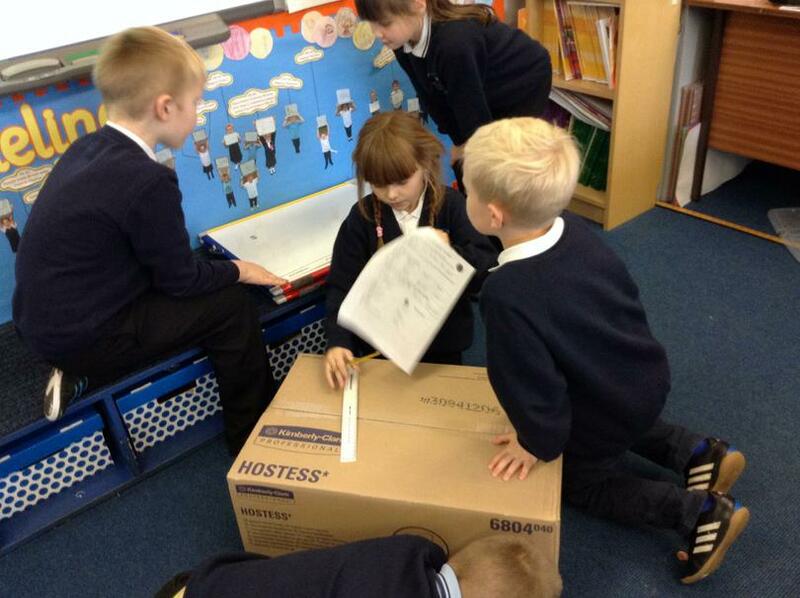 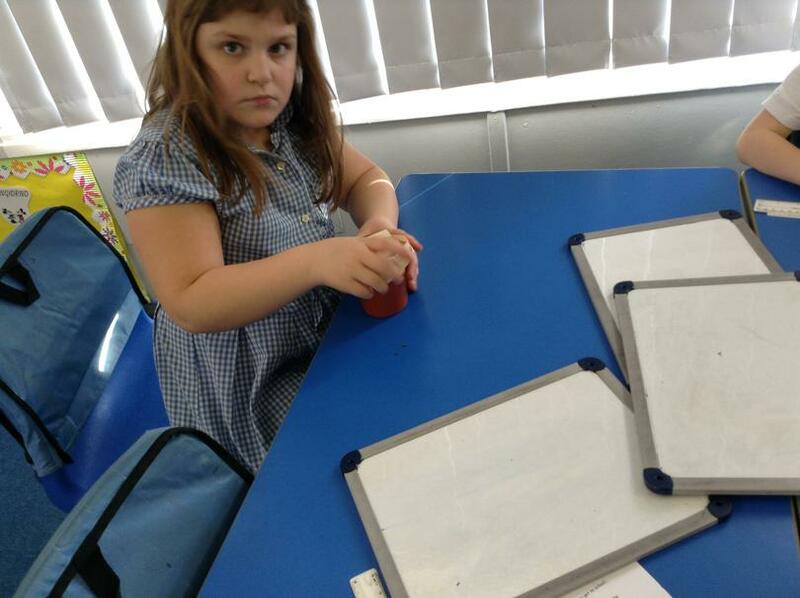 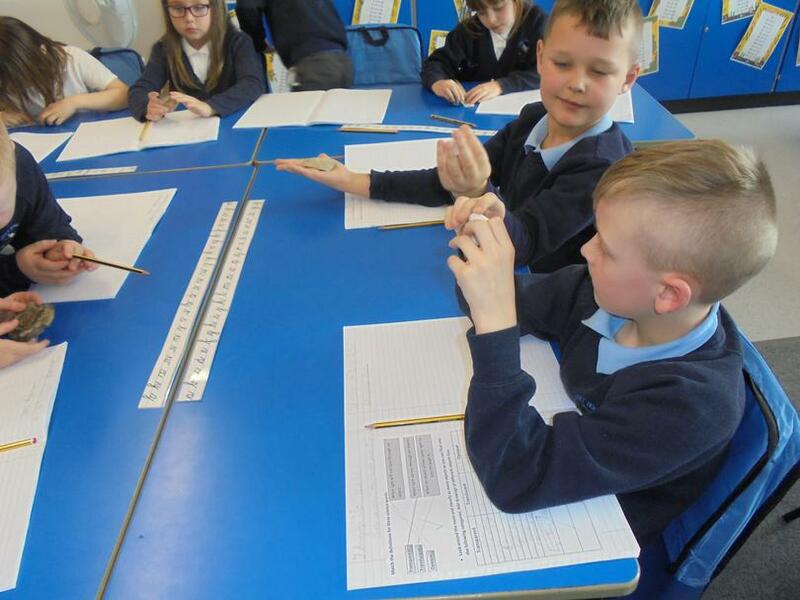 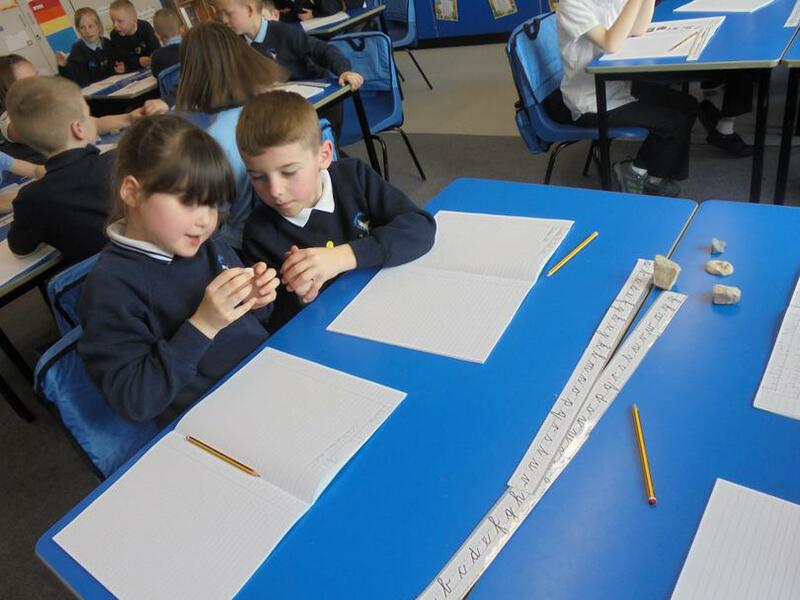 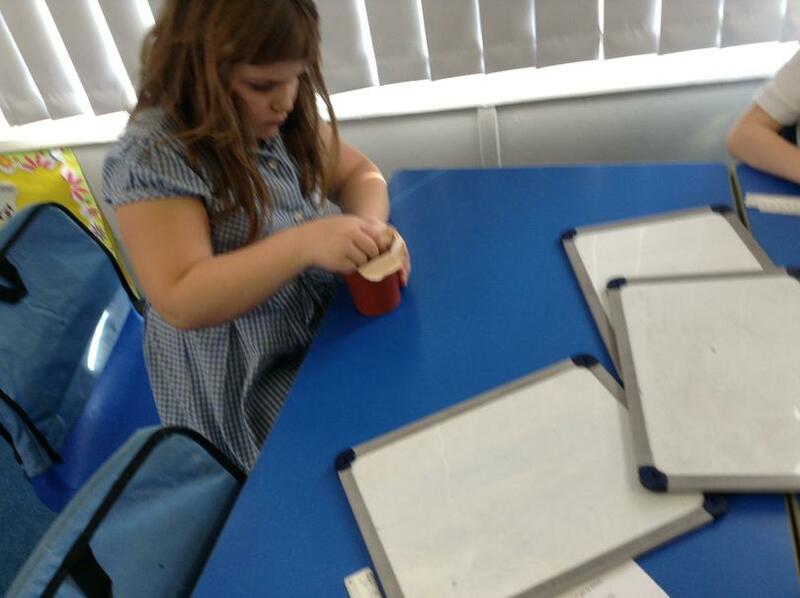 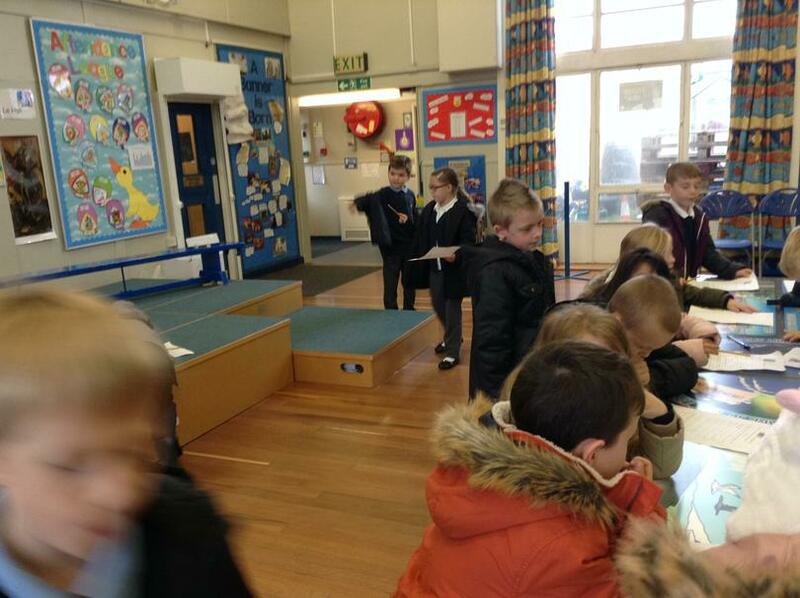 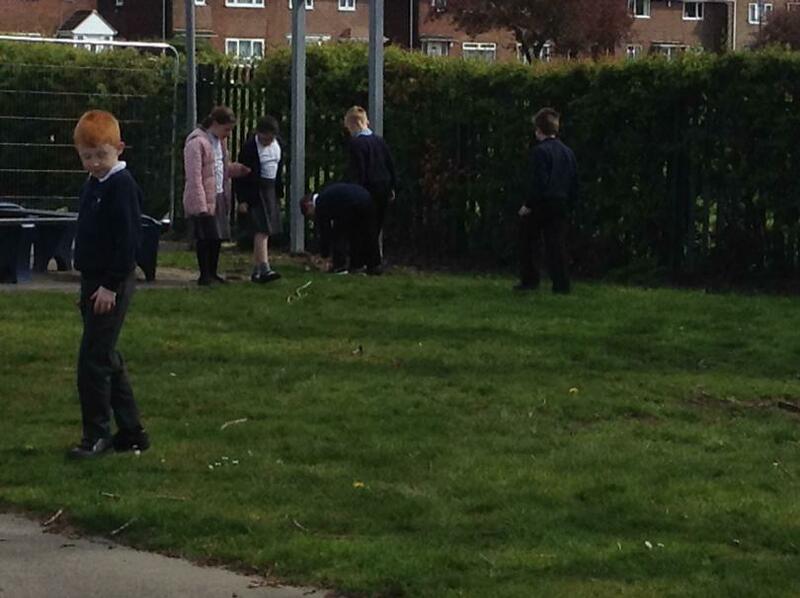 Here are some photos of us making our predictions and setting up our experiment. 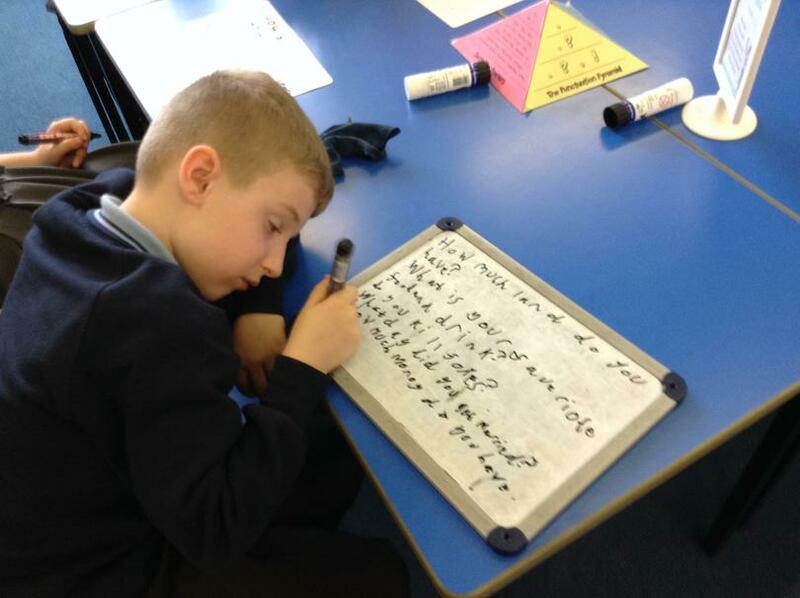 We have had a very busy week in Year 3! 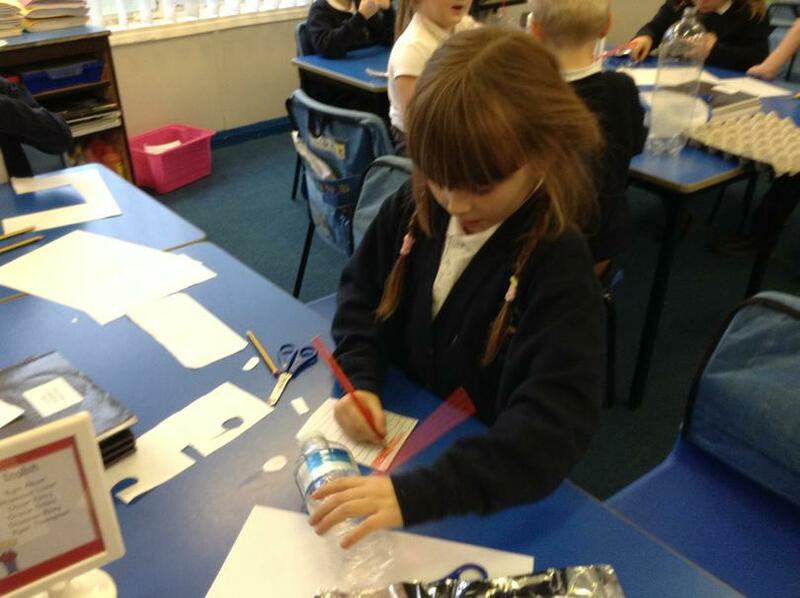 We were back to working hard following our Christmas break. 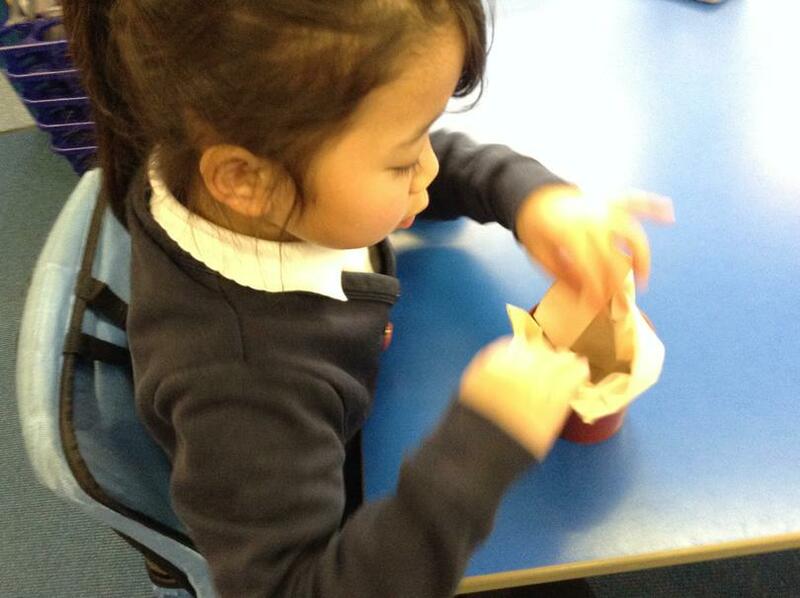 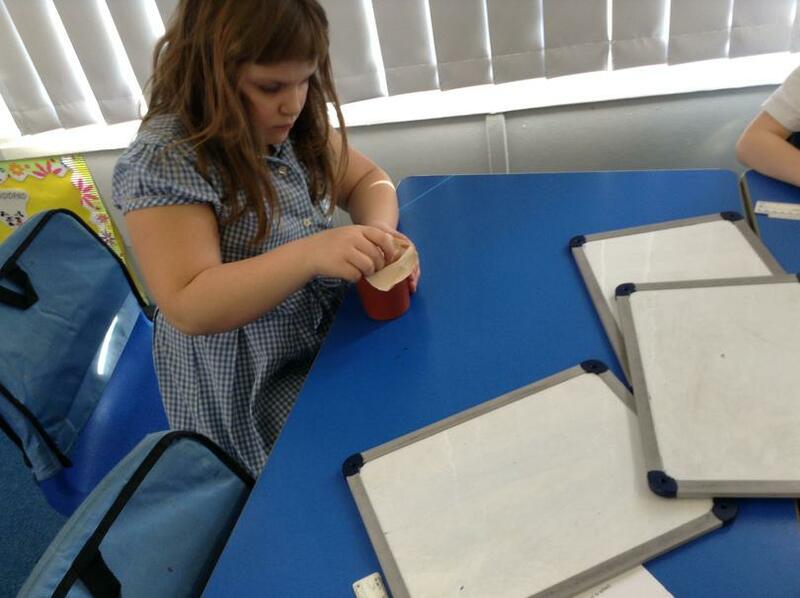 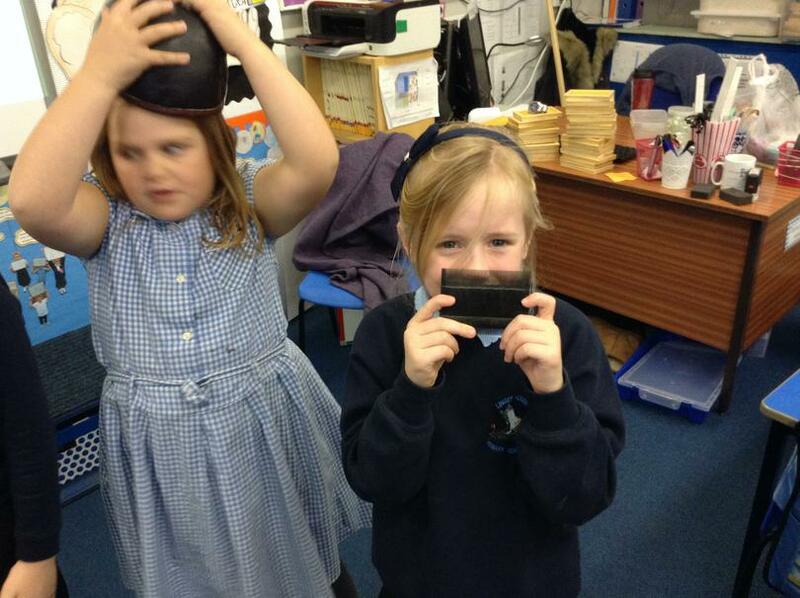 We have been learning all about 2D and 3D shapes in Maths. 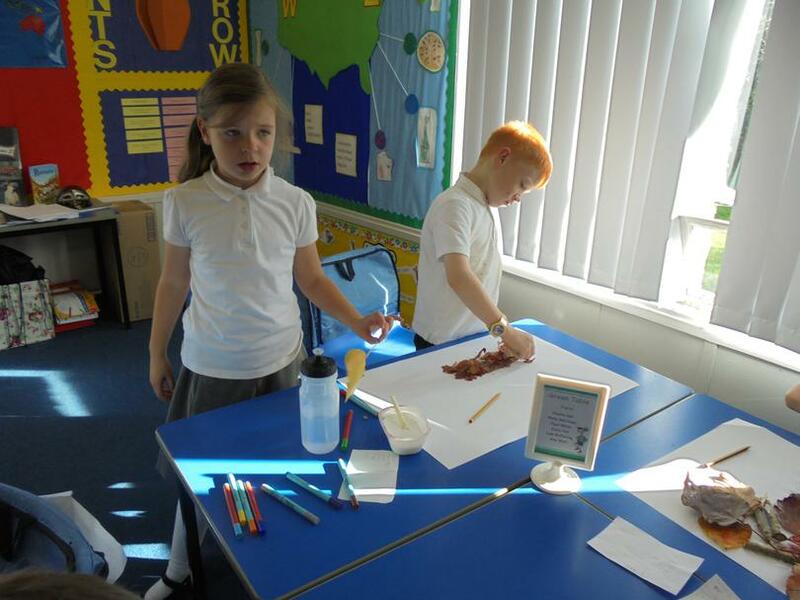 We have been exploring around the classroom to see if we can find any different shapes; we found one called a 'dodecahedron' which has 12 sides! 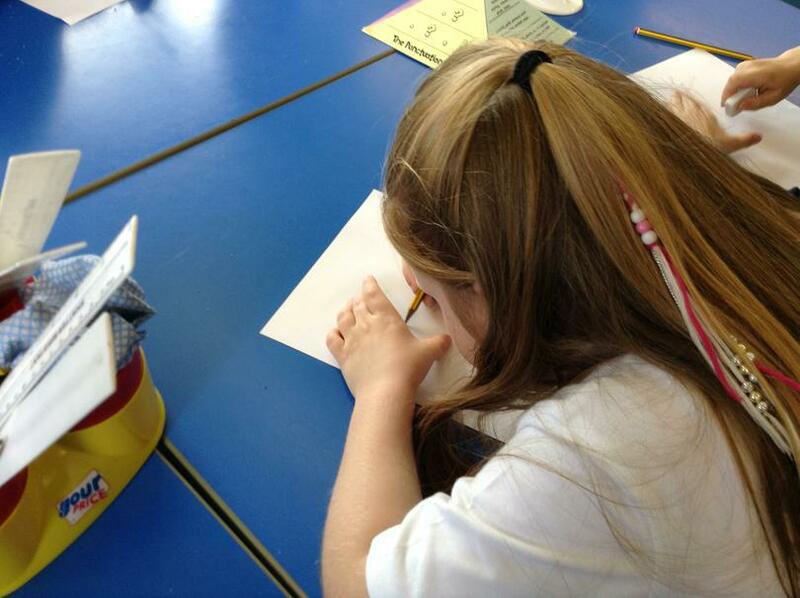 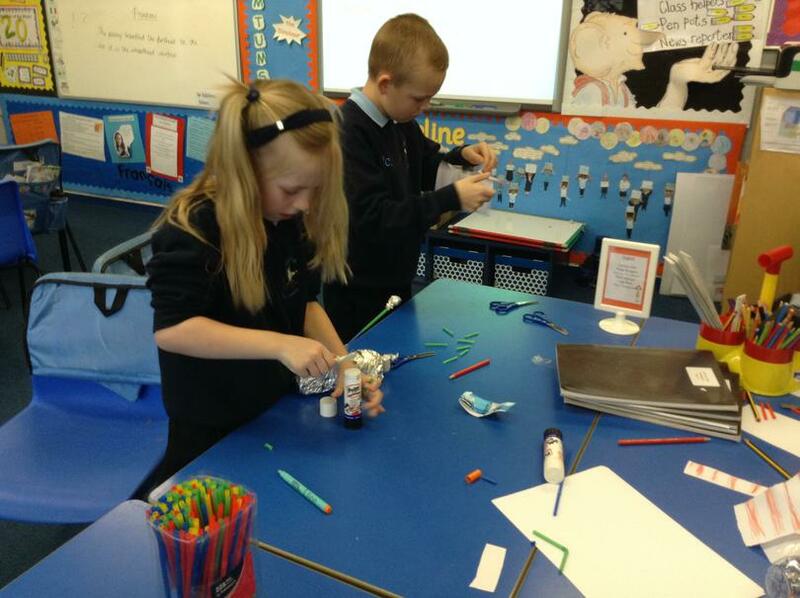 We have also been building 2D and 3D shapes from art straws. 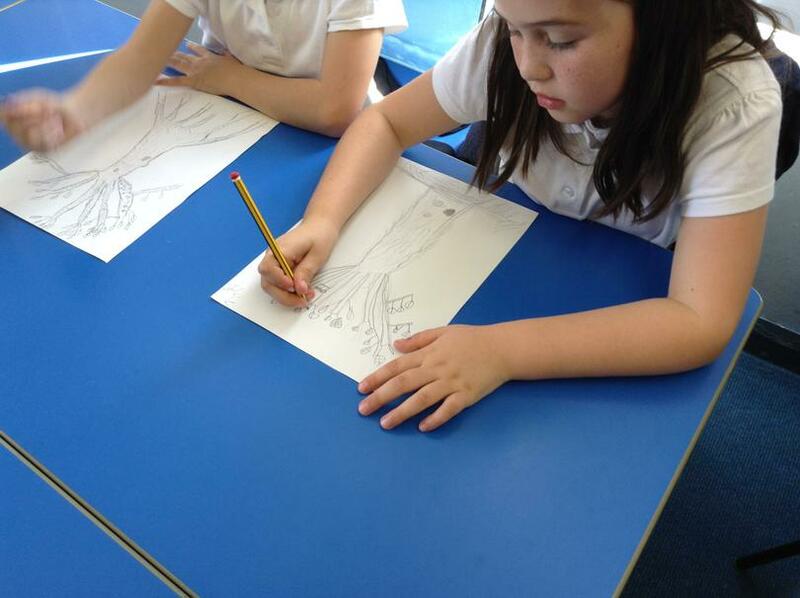 In English this week, we have been looking at fables and in our Creative Curriculum sessions, we have begun to look at America. 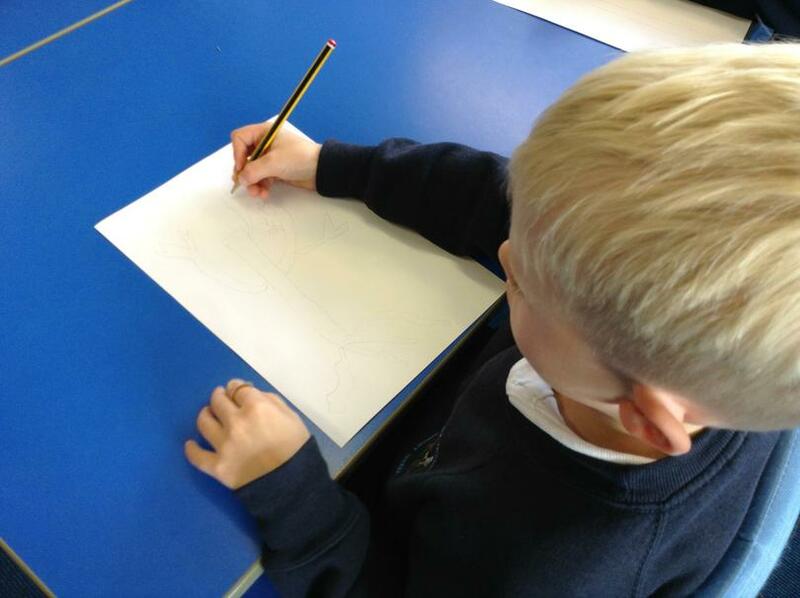 Our topic this half term is called Coast to Coast and we are excited to find out lots of information about the United States. 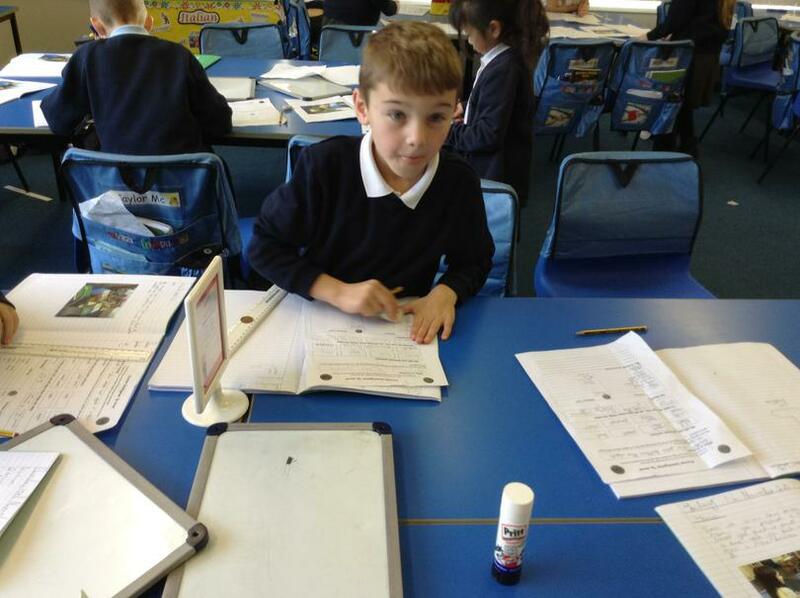 We have looked at different landmarks so far this week and we have also looked at different key events in American history. 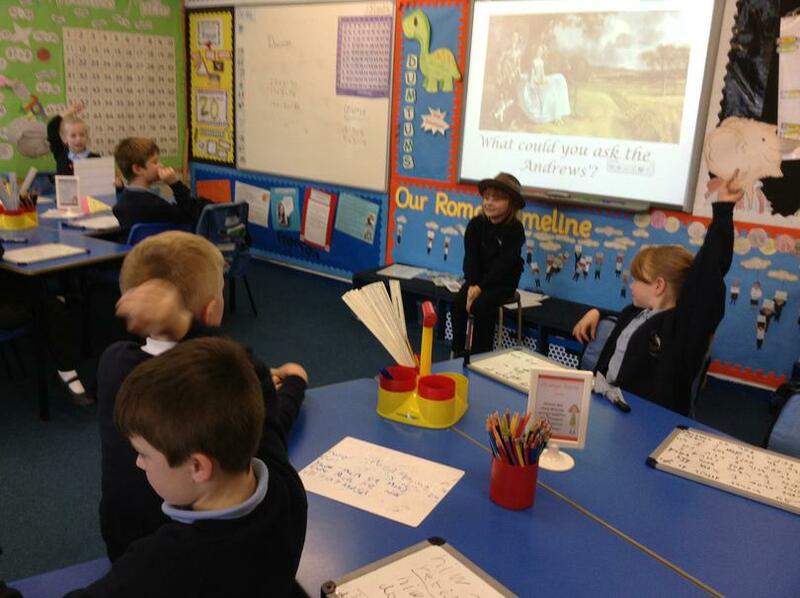 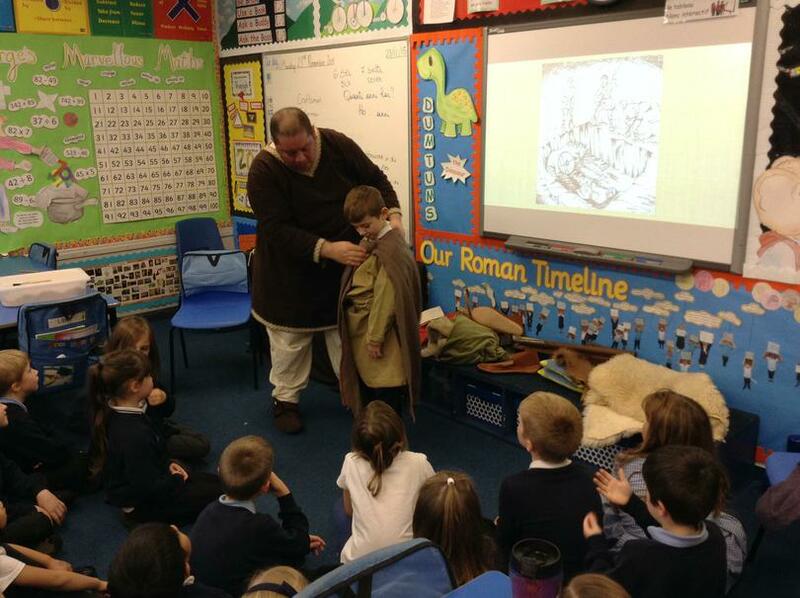 We were lucky enough to receive a visit from ‘That History Bloke’, Richard. 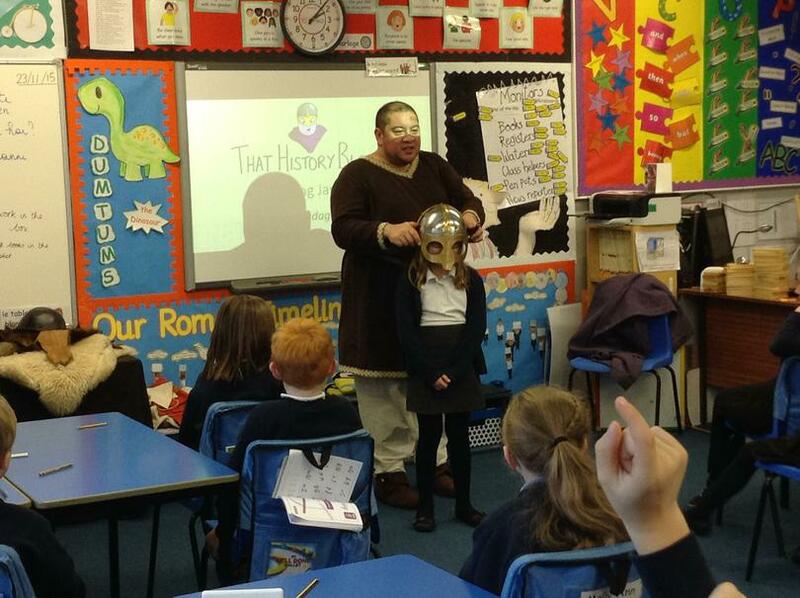 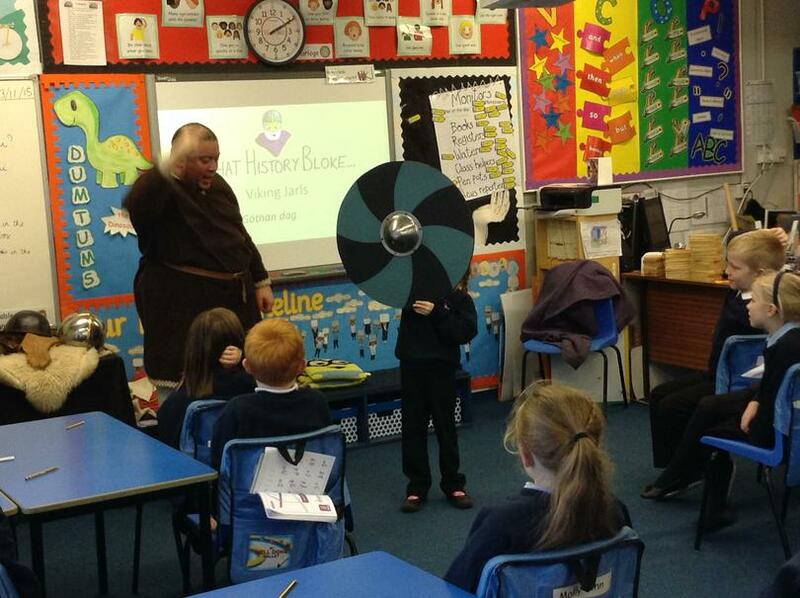 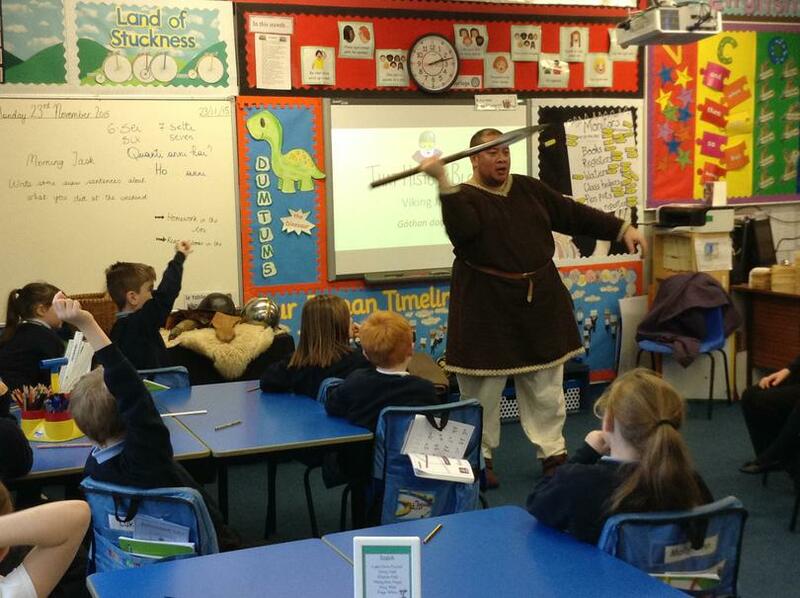 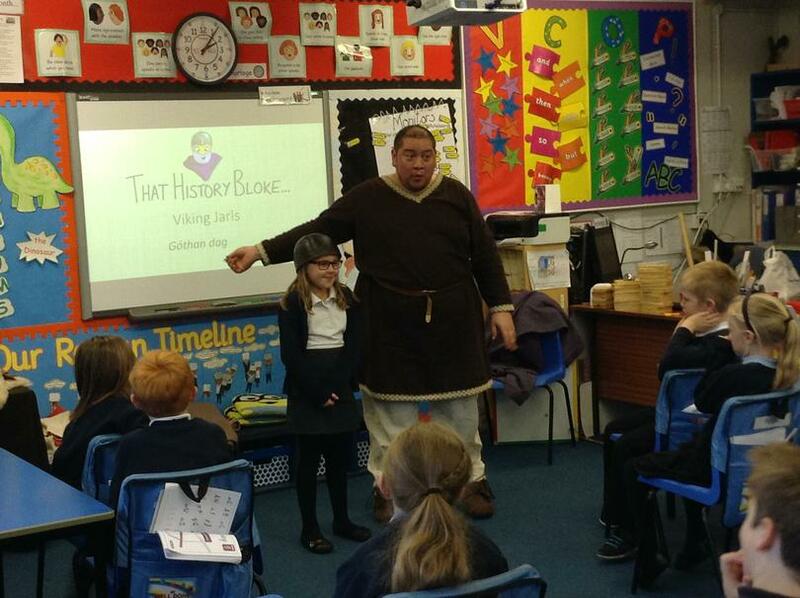 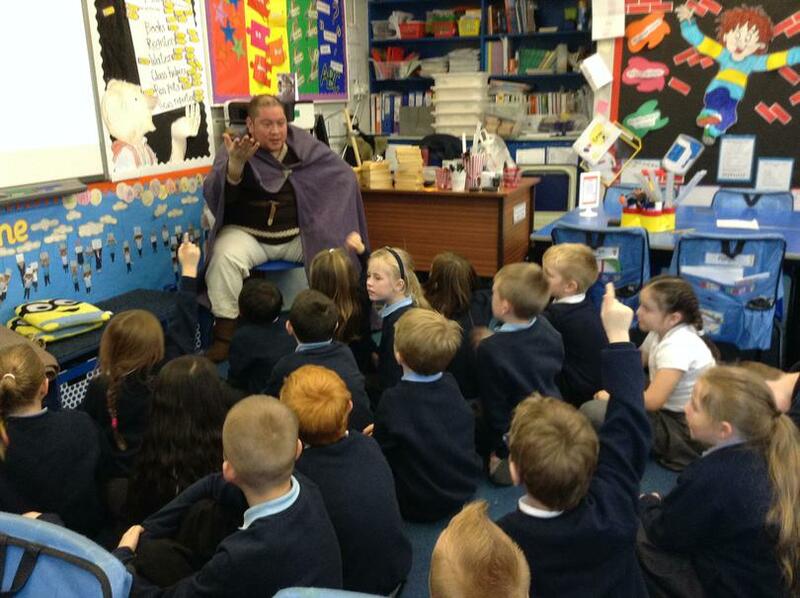 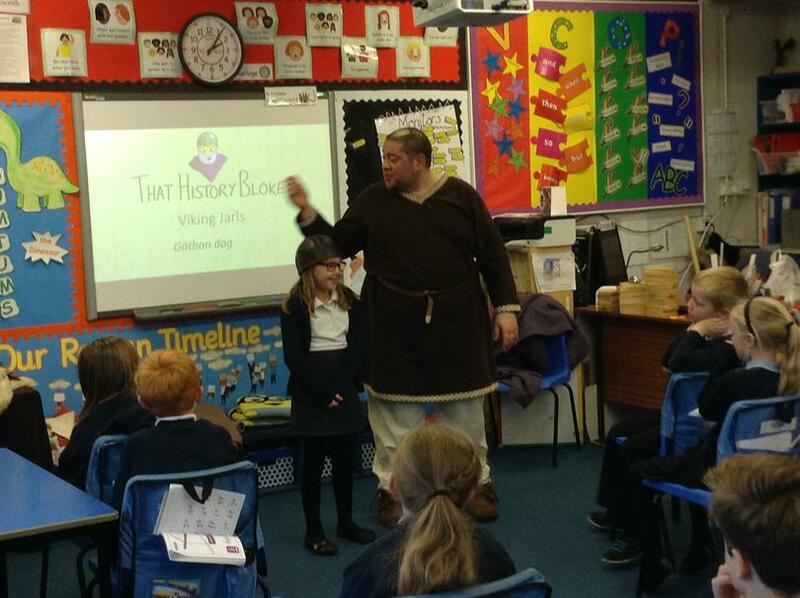 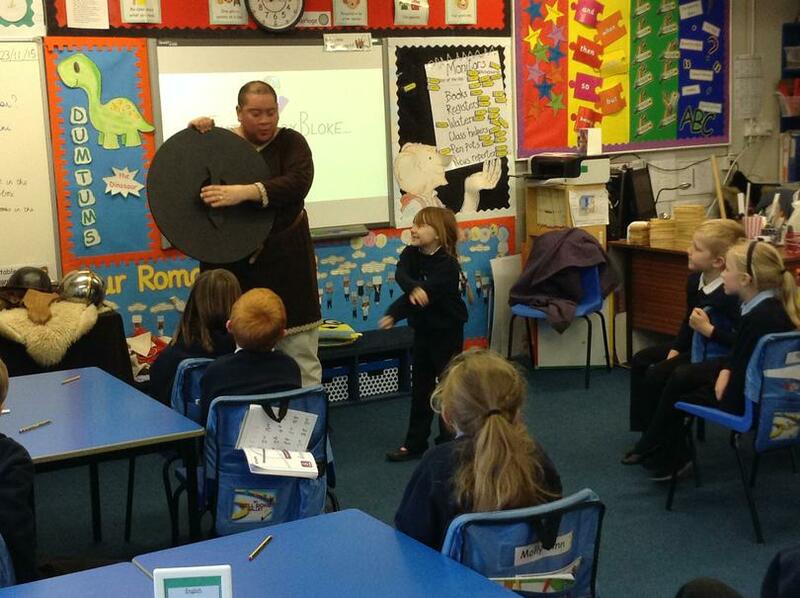 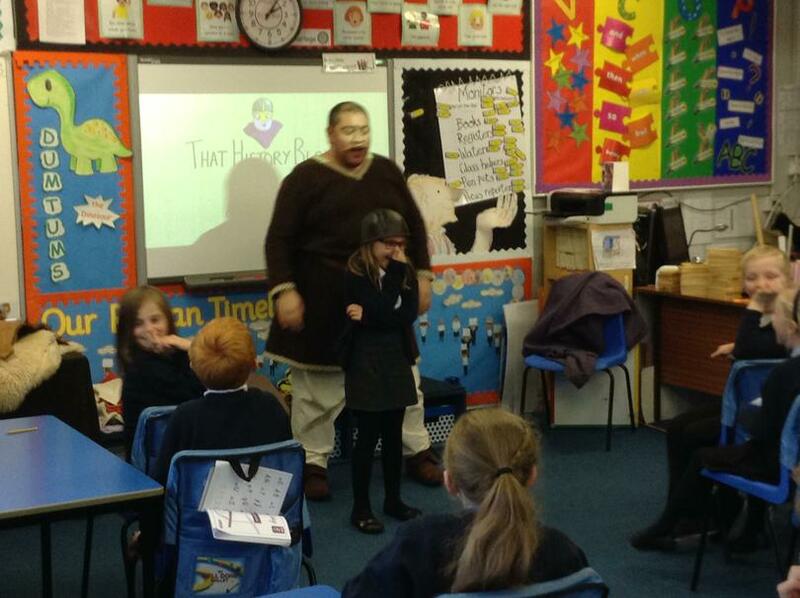 He told us a story called Lingworm and showed us lots of different Viking artefacts. 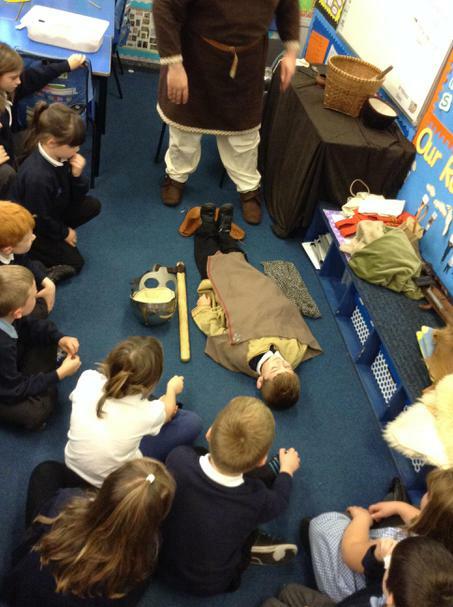 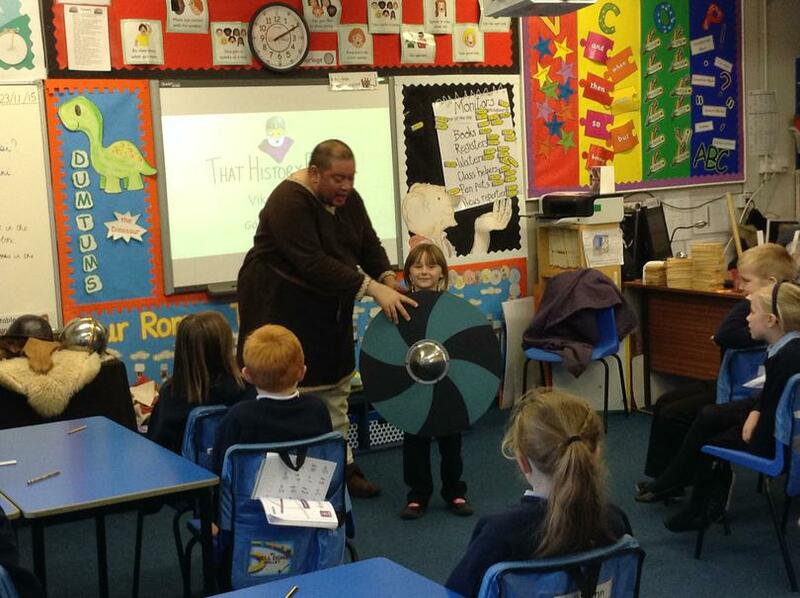 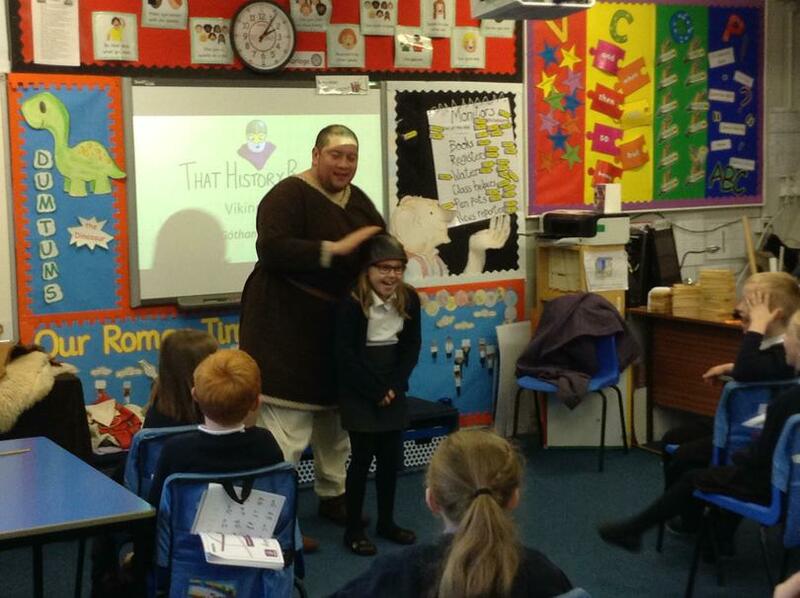 Richard also taught us about a Viking burial. 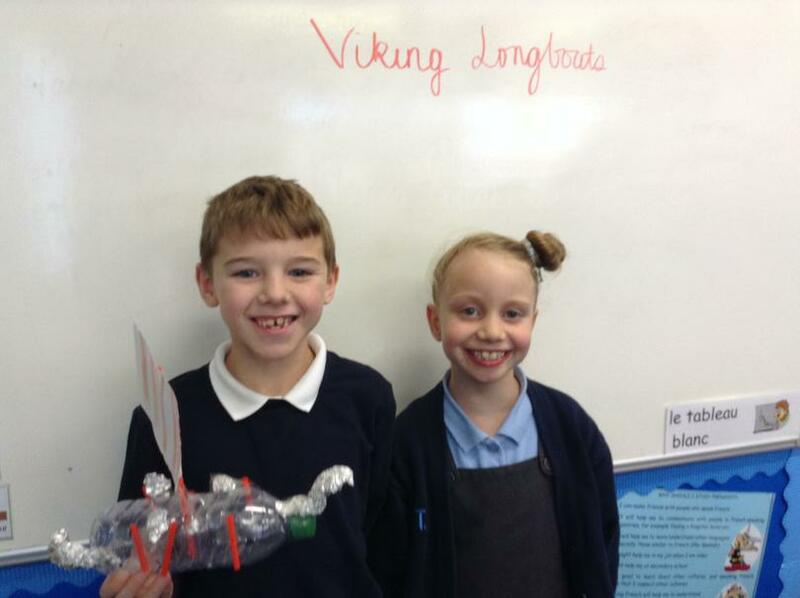 To have a Viking burial, they would have dug a hole, placed in the body and the Viking’s tools and covered the body over with earth. 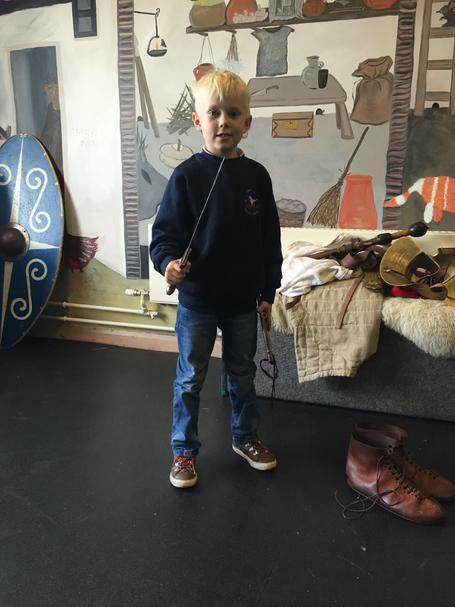 If the horse had died with the warrior, they would have buried the horse too. 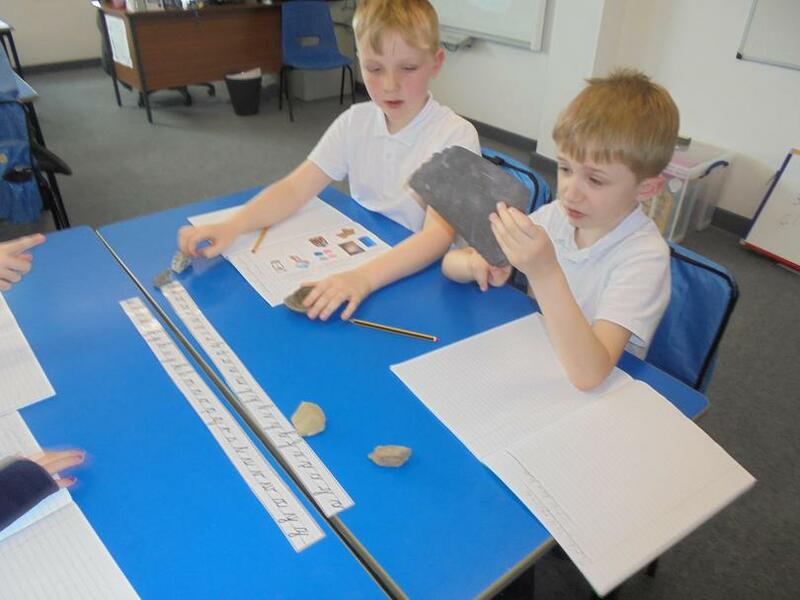 We also really enjoyed being archaeologists! 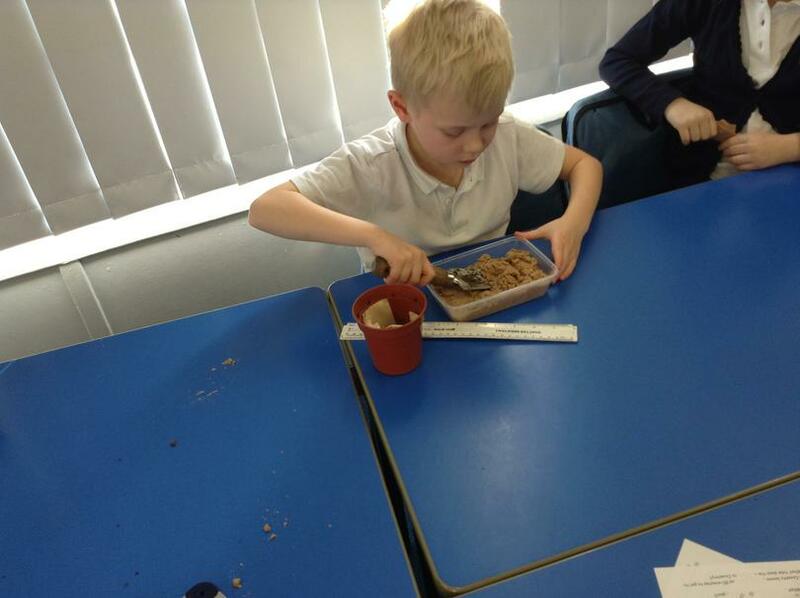 Each table received a box filled with artefacts and we had to dig through the saw dust to figure out where the items would be from. 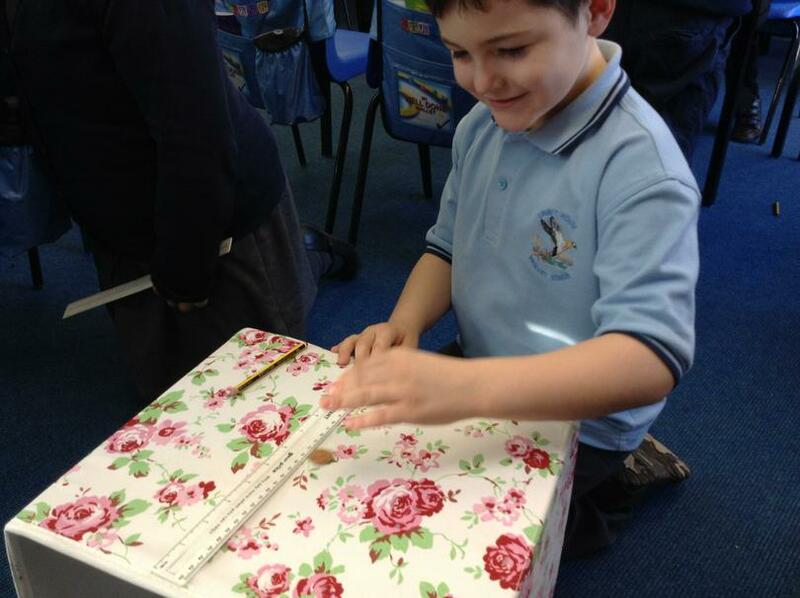 Some boxes were filled with items used by craftsmen or housewives. 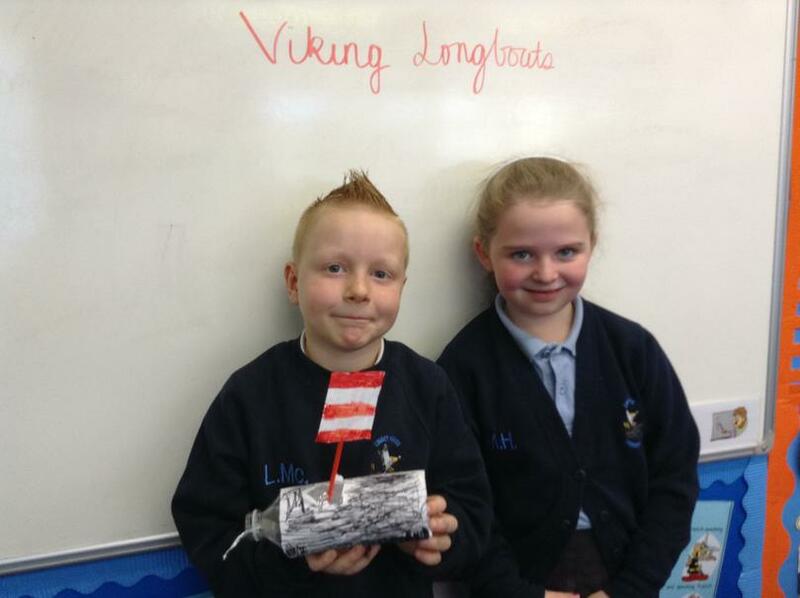 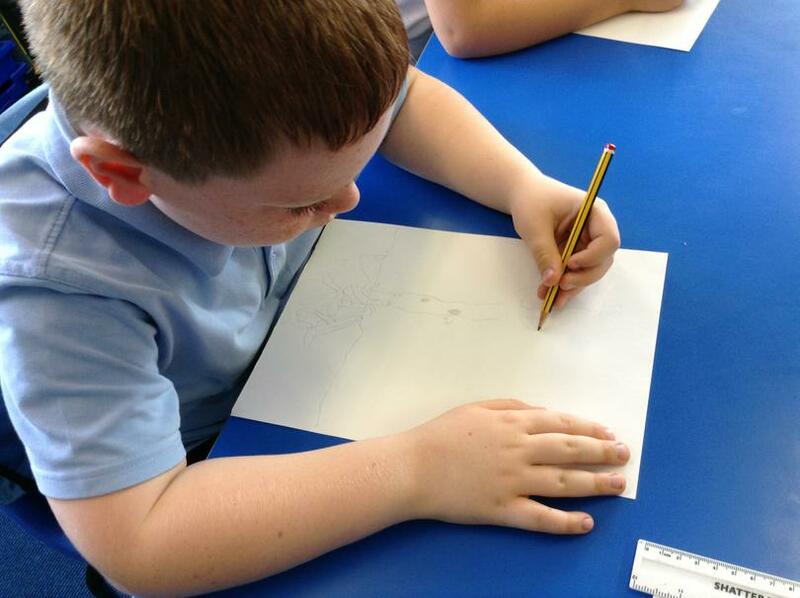 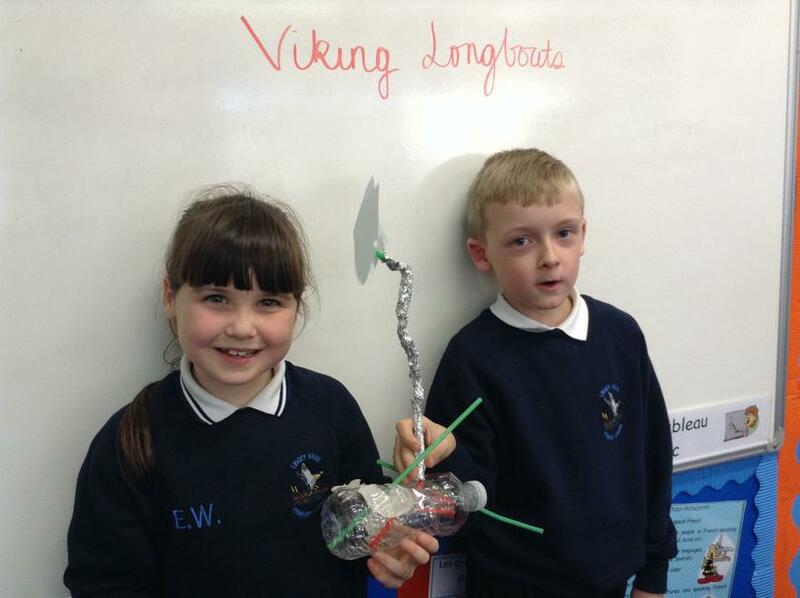 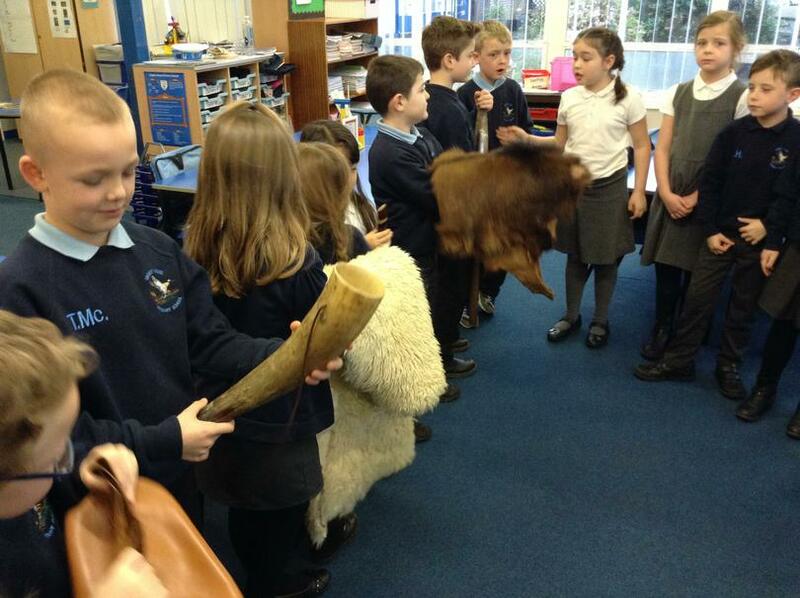 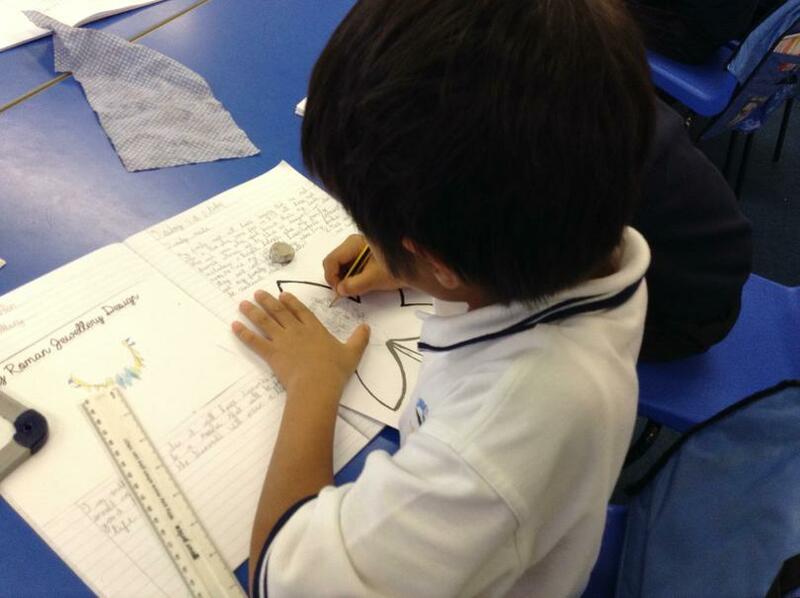 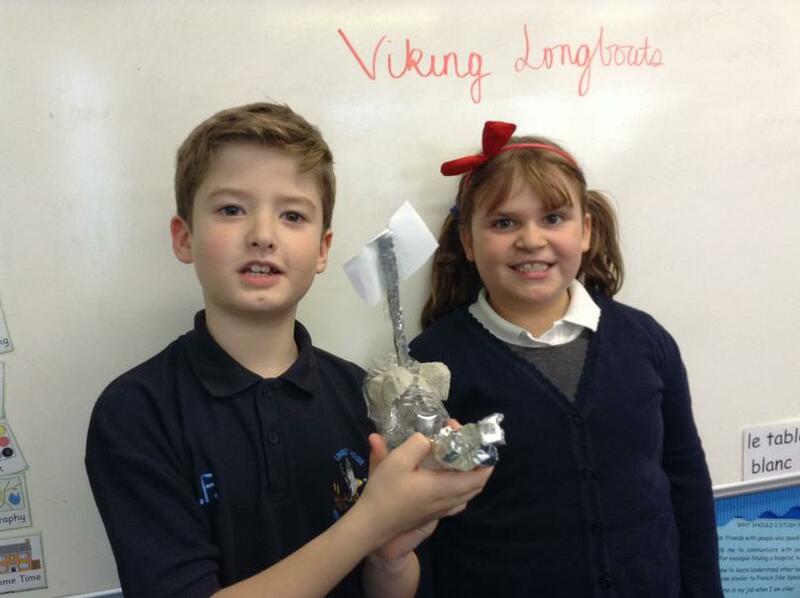 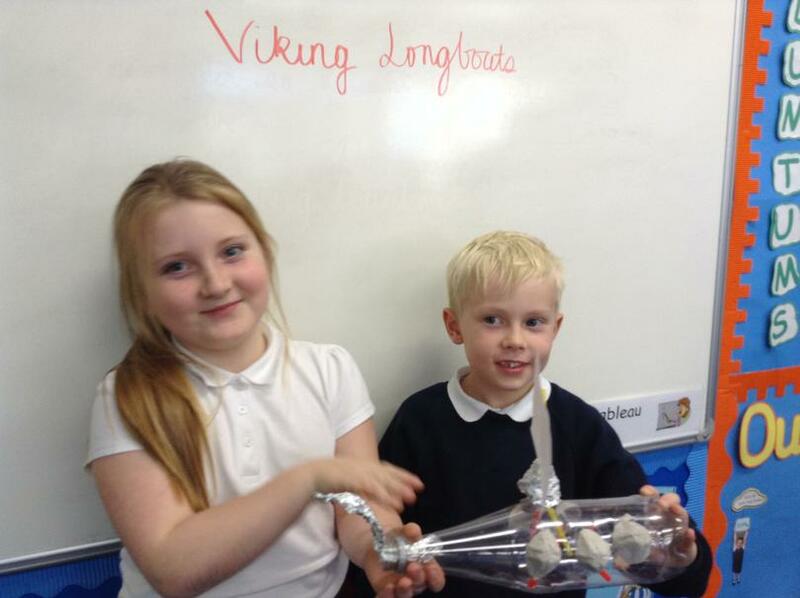 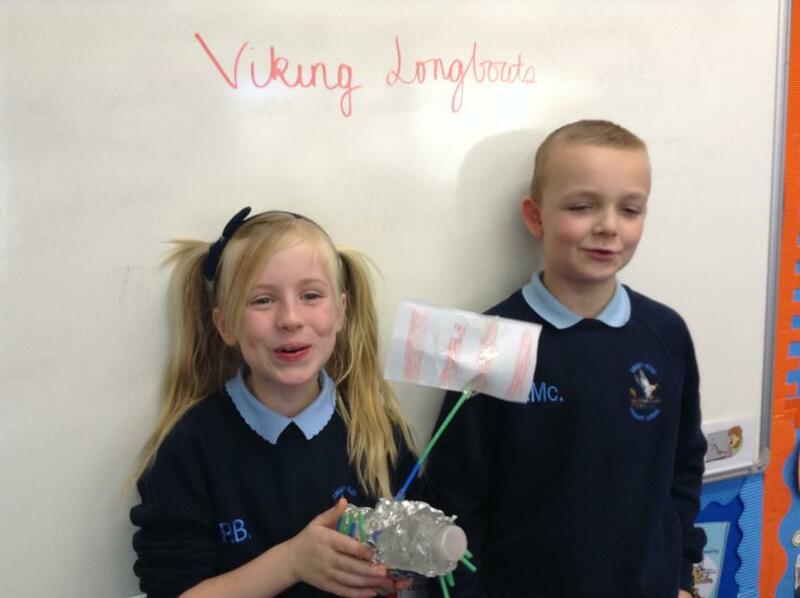 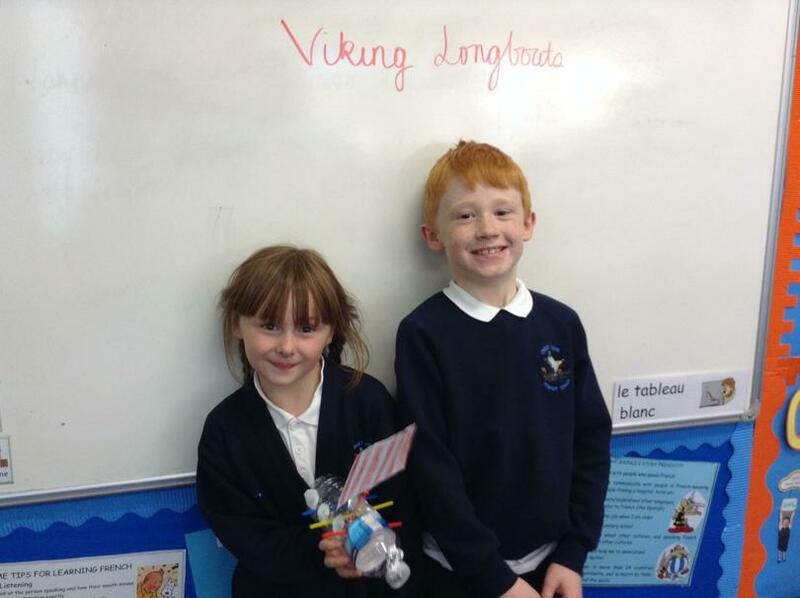 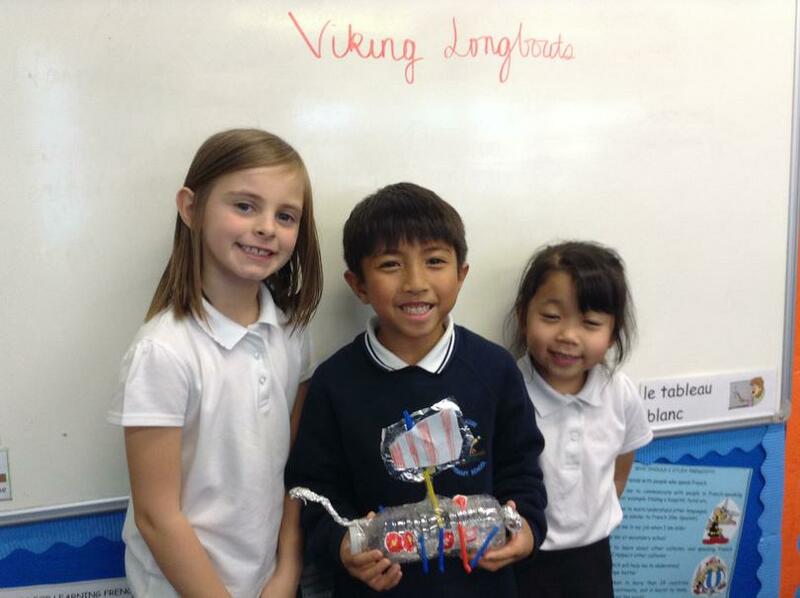 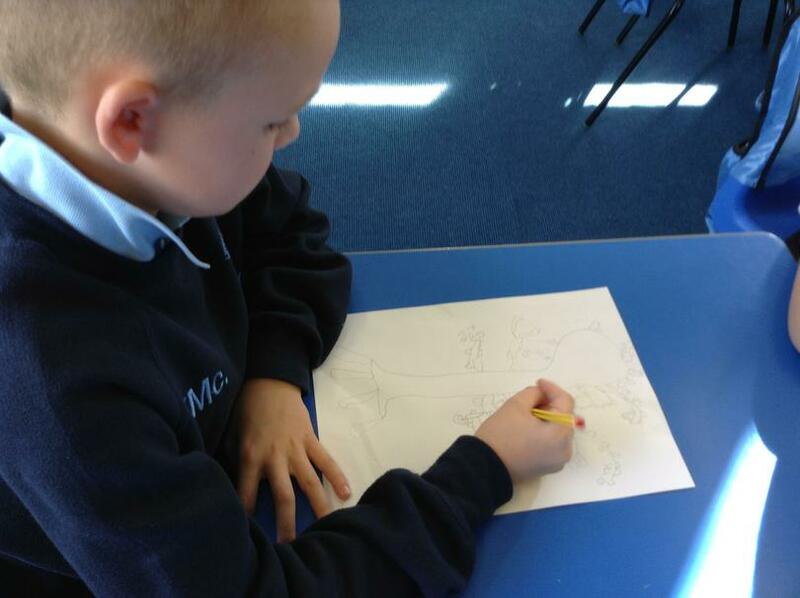 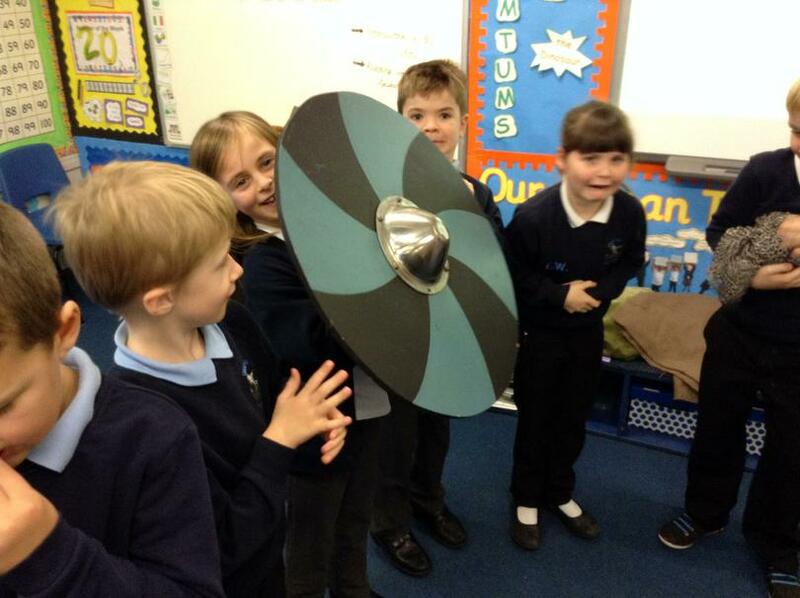 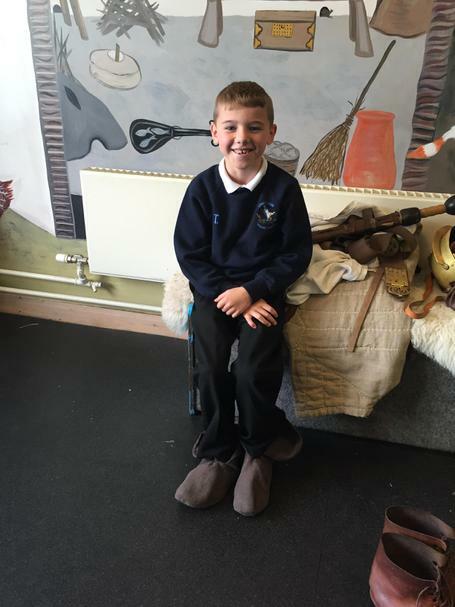 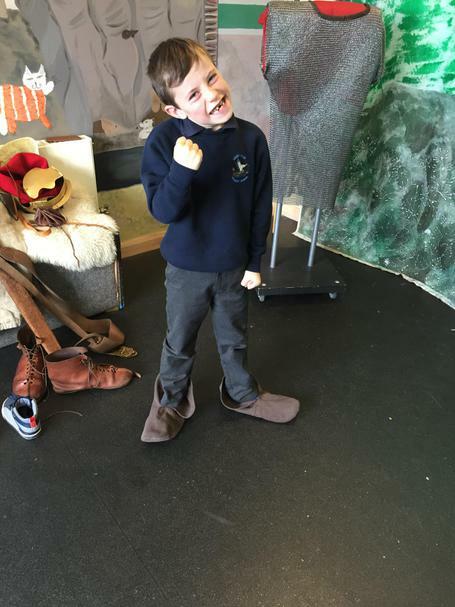 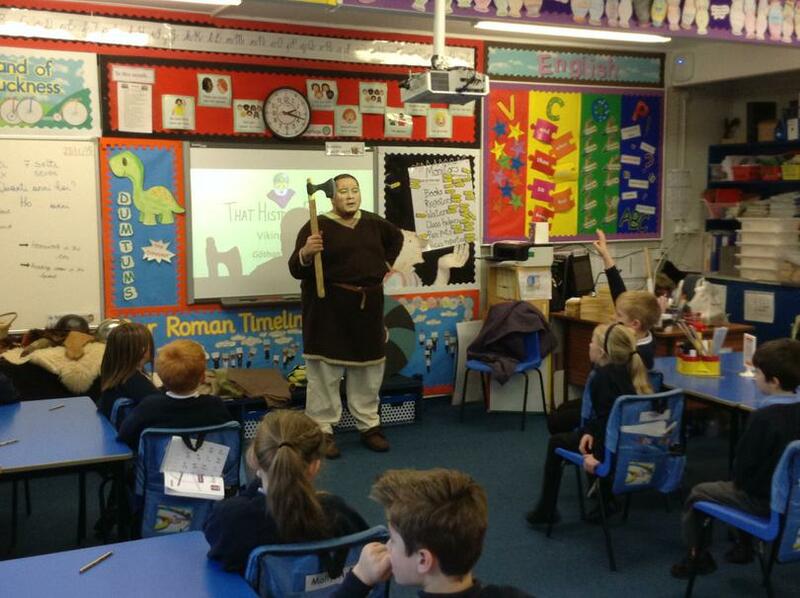 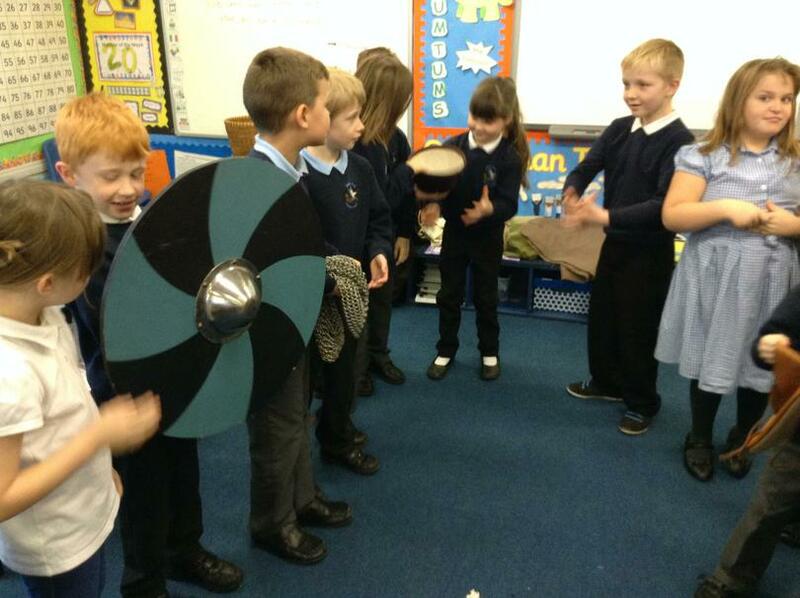 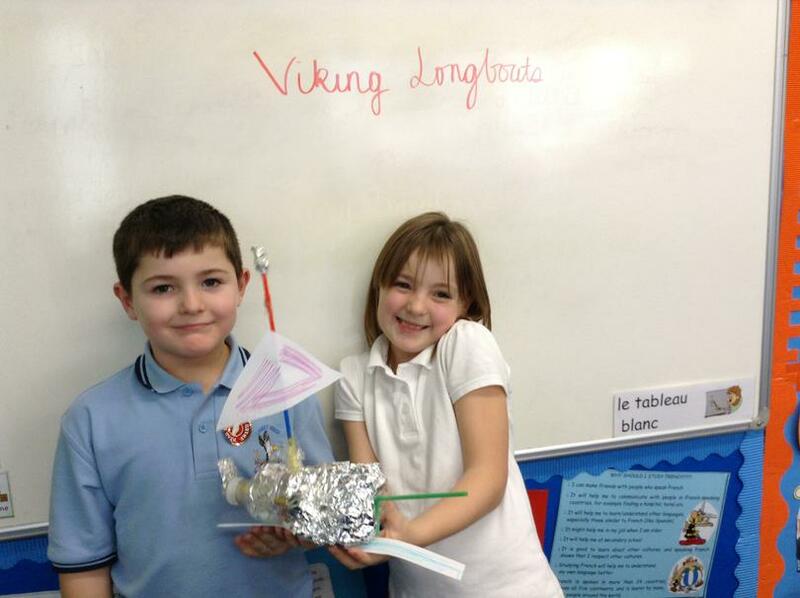 Our Creative Curriculum topic this half term is the Vikings and we have been looking at how the Vikings travelled. 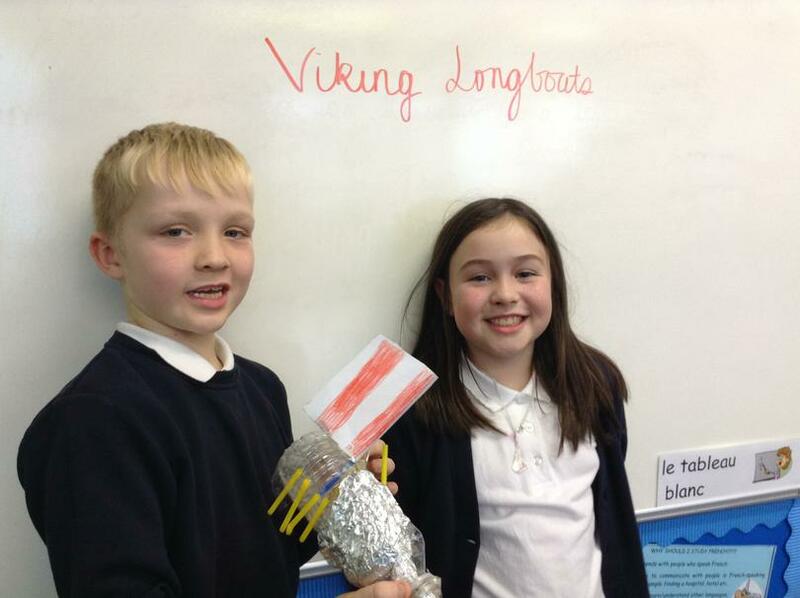 They travelled in longboats that were lightweight so that they could be hauled upon the shore during a raid. 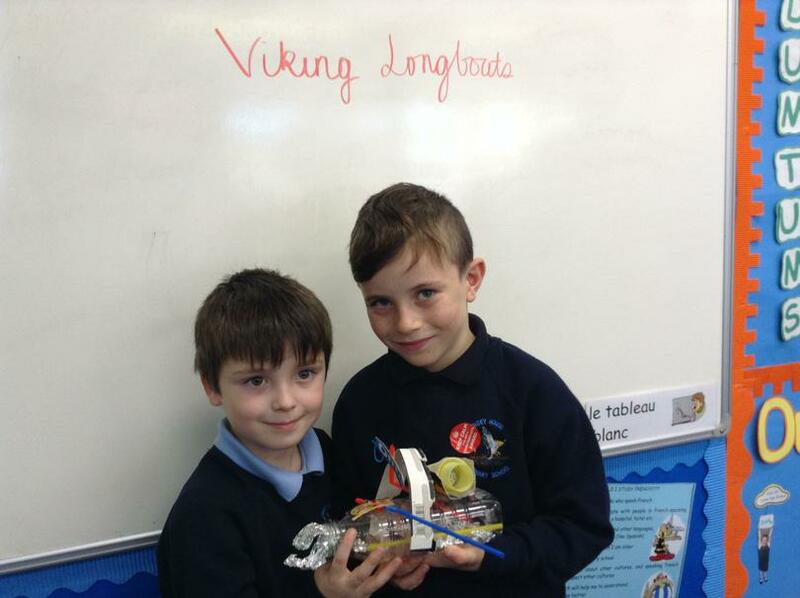 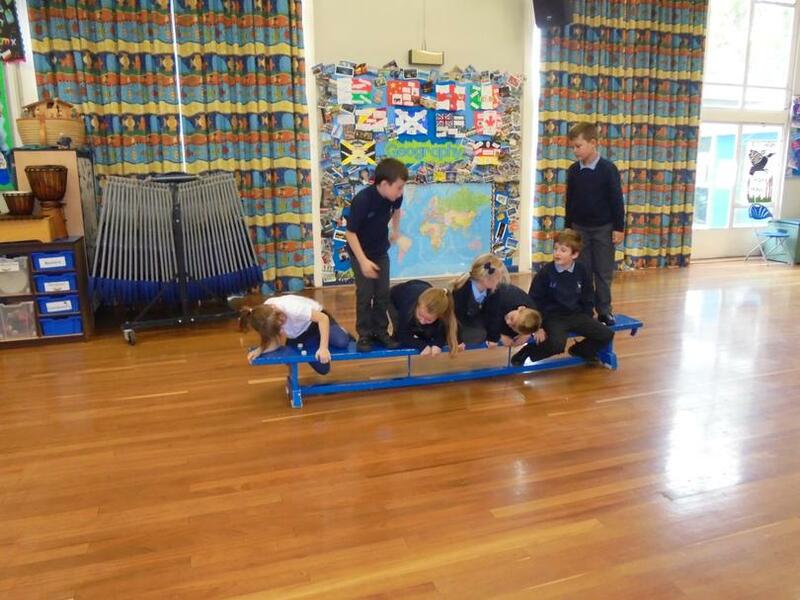 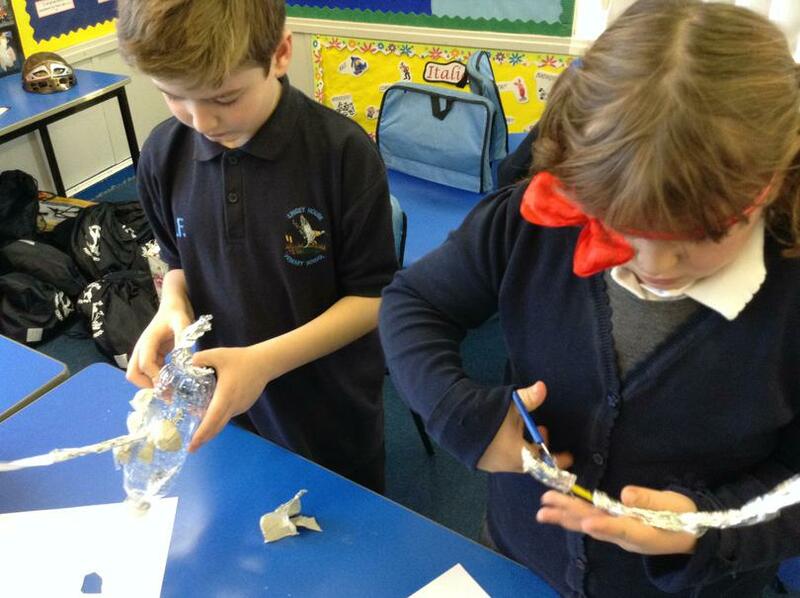 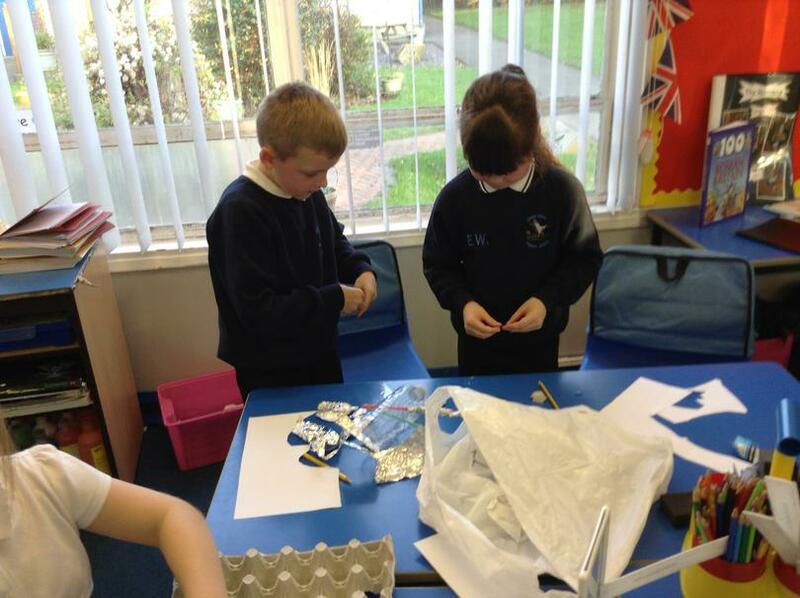 We designed a longboat in our last DT lesson and have built them today in pairs. 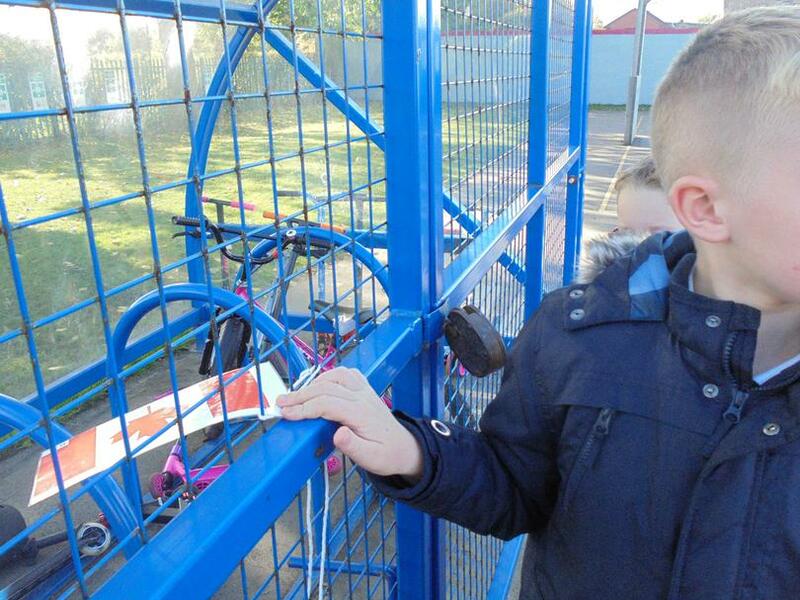 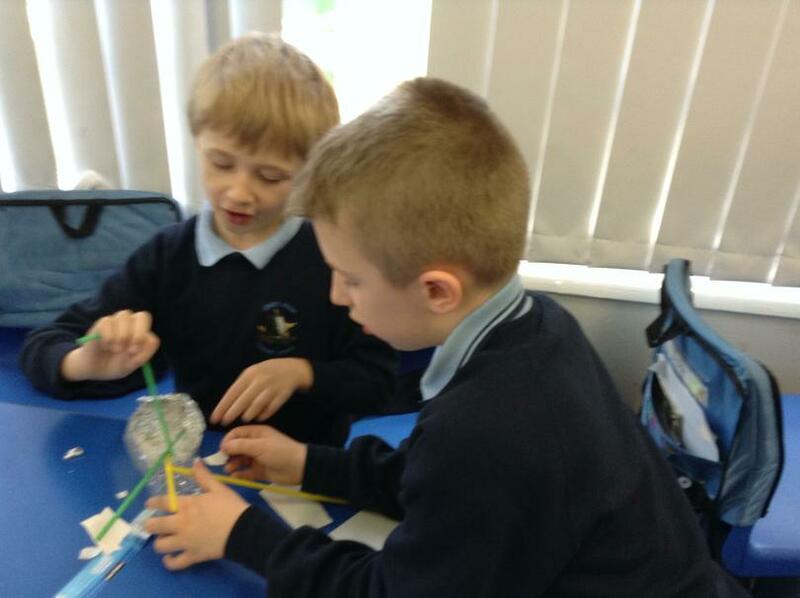 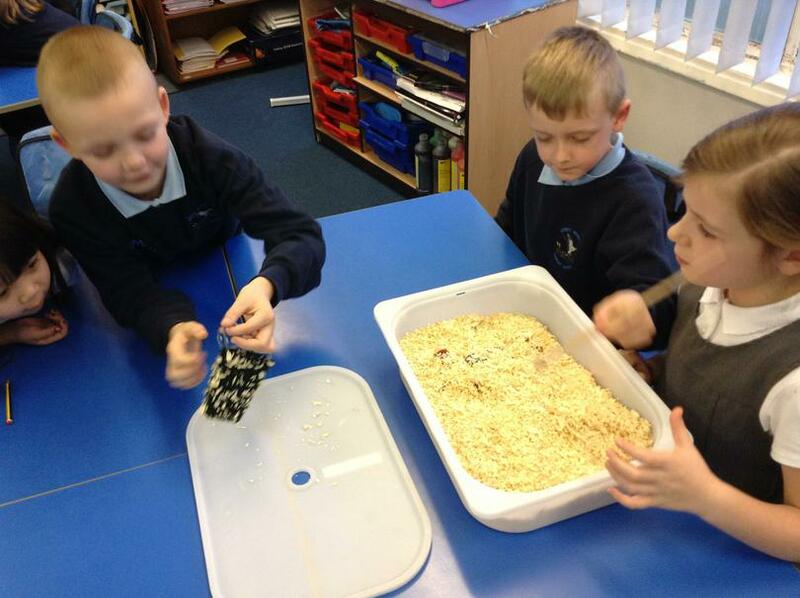 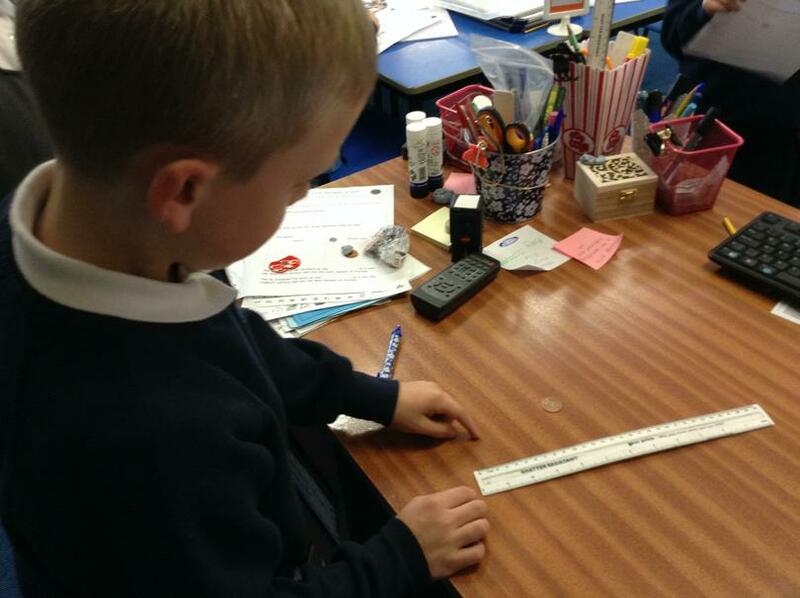 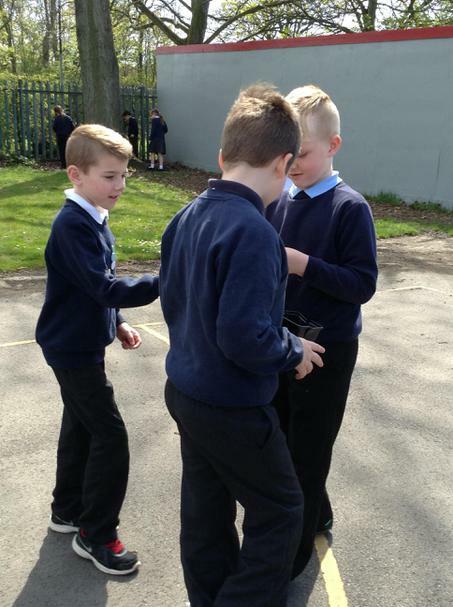 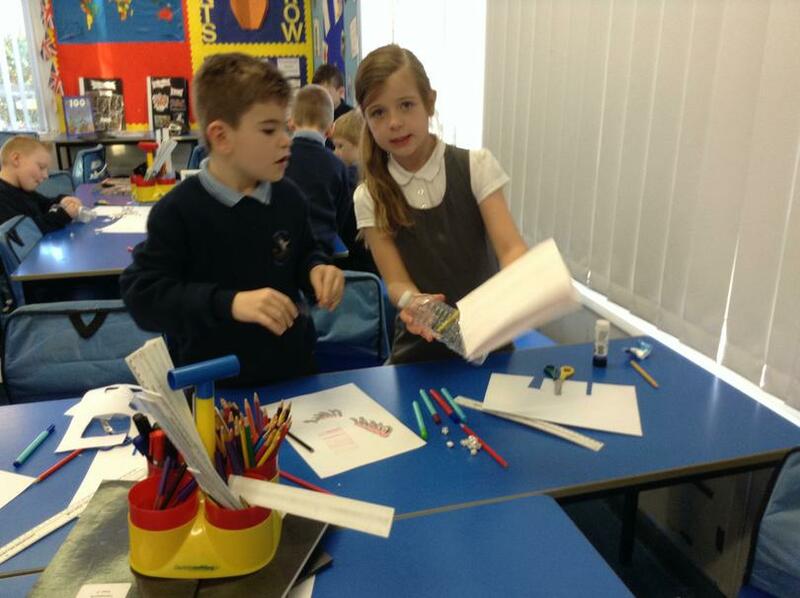 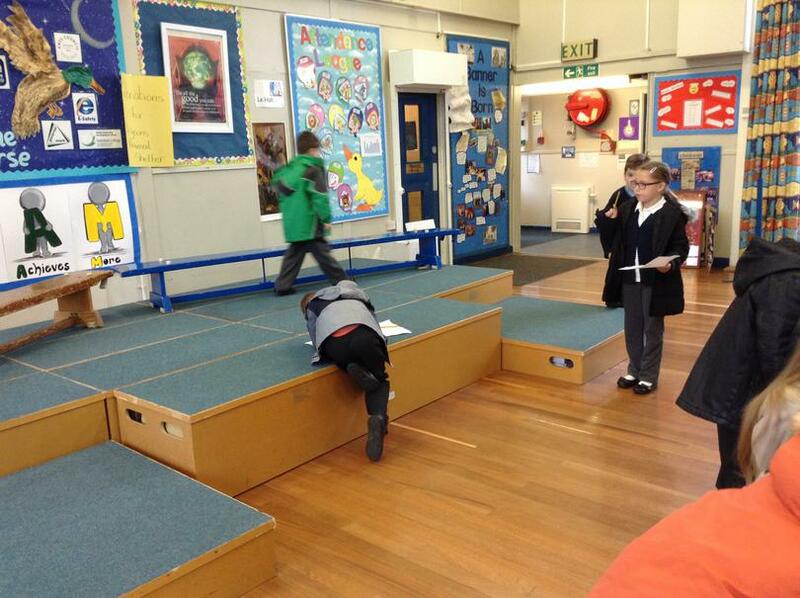 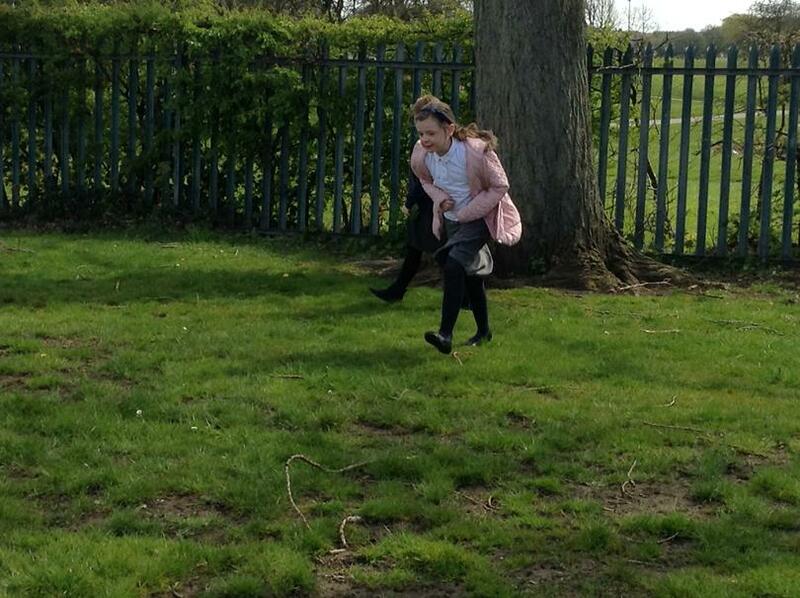 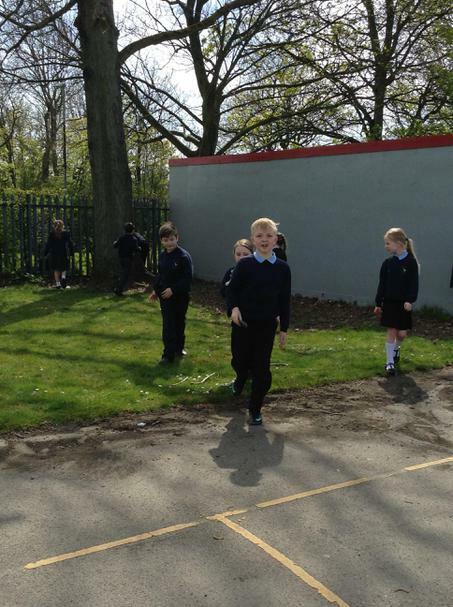 In Science we have been looking at forces and friction. 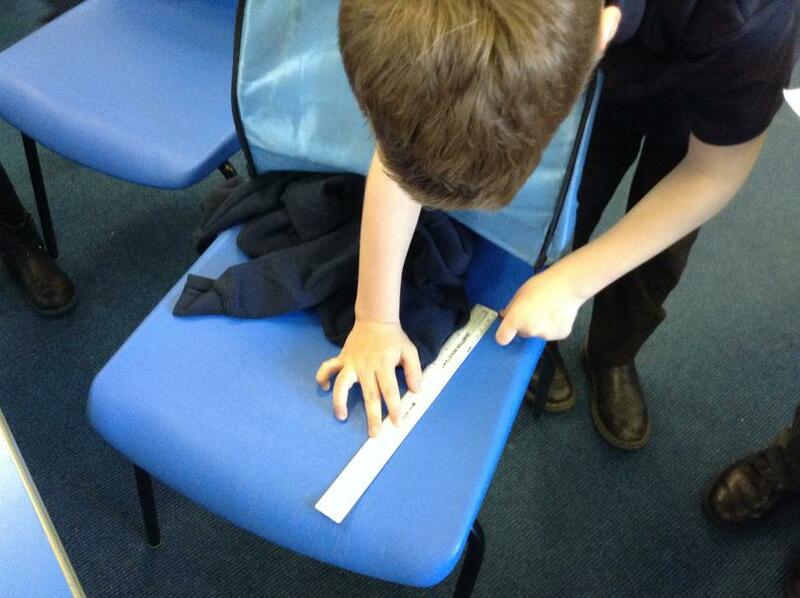 Today we did an experiment to see which surfaces produced the most friction. 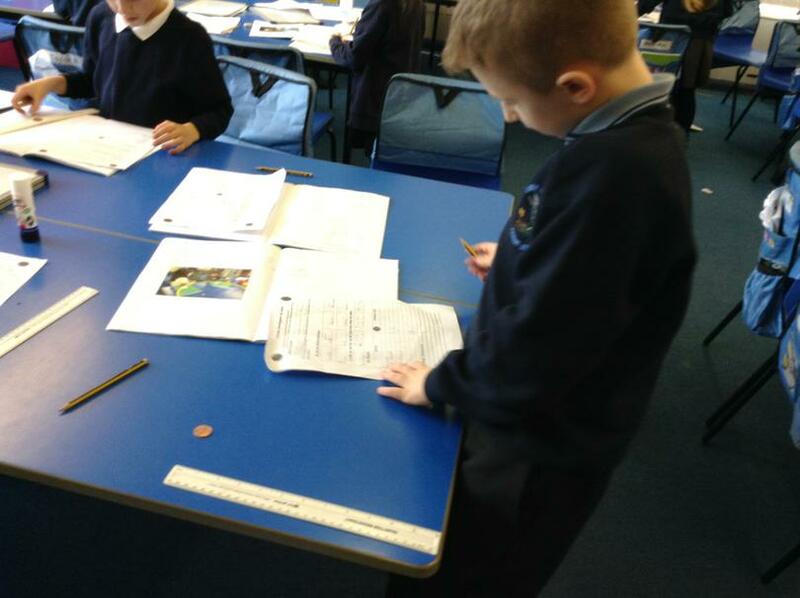 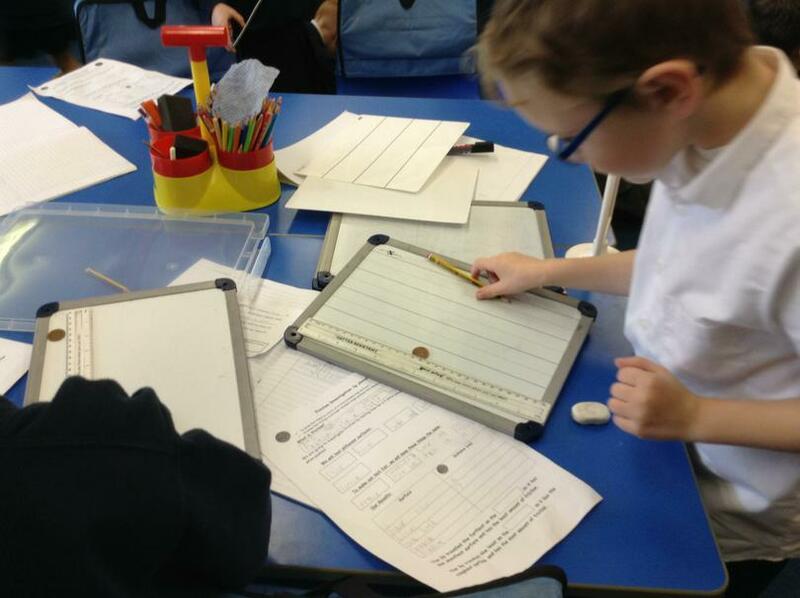 We slid a penny across different materials and recorded our answers in a table. 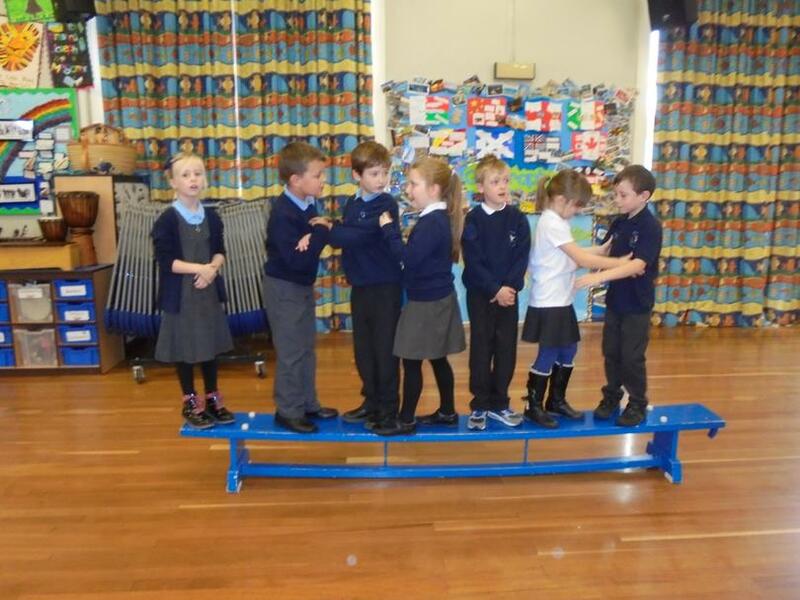 We loved performing our assembly for our friends and family. 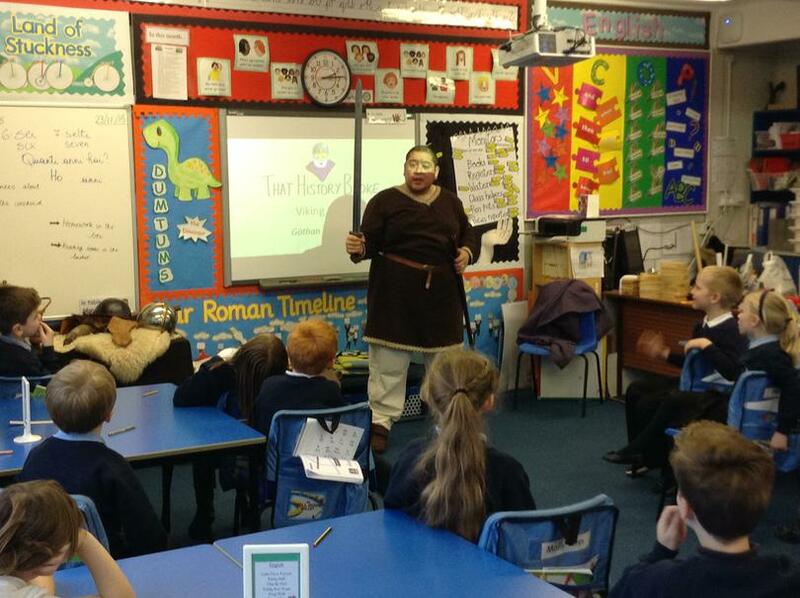 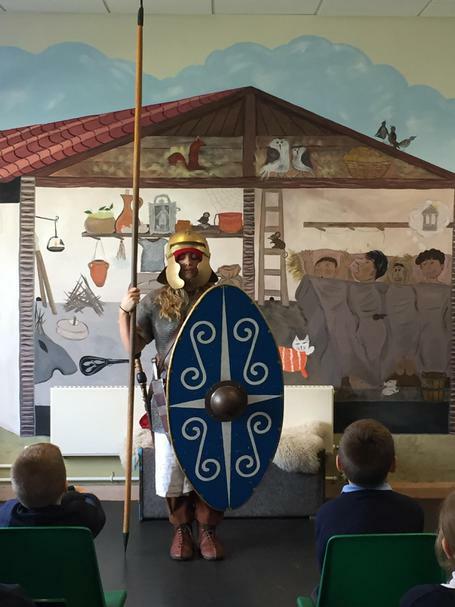 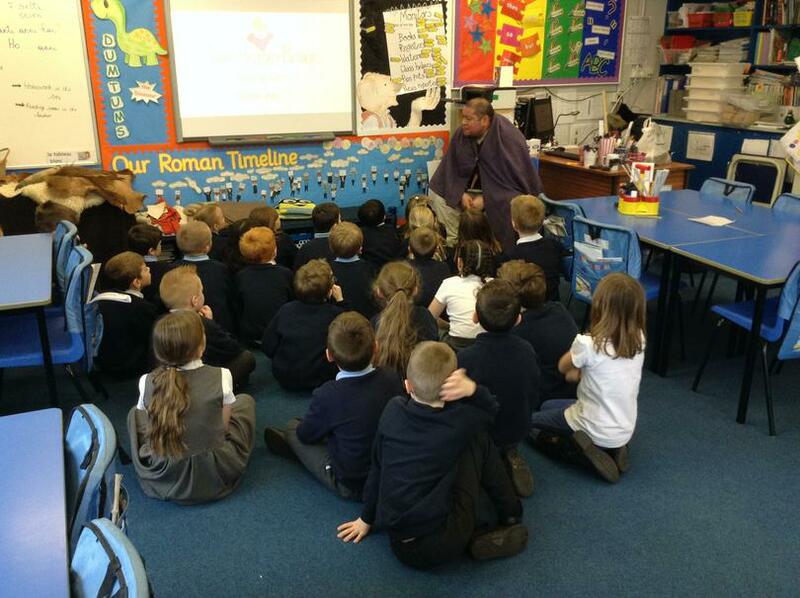 Our assembly was all about the Romans. 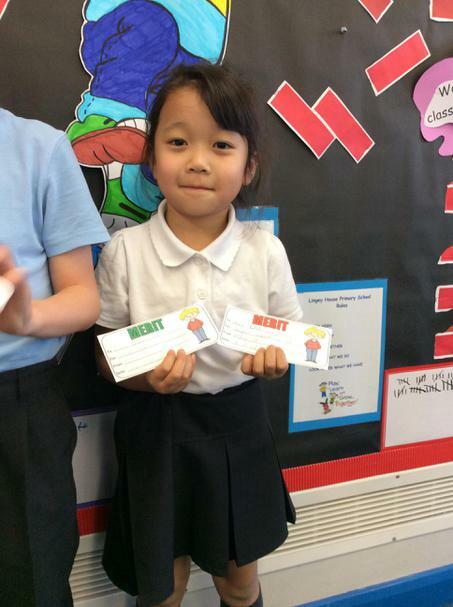 We hope you enjoyed it as much as we did! 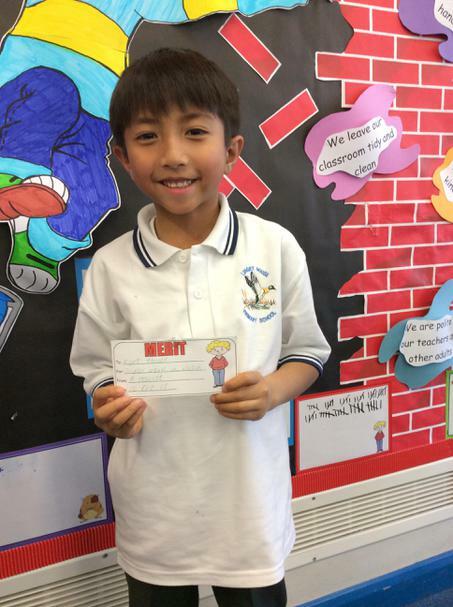 In Year 3, we always try our best and work our socks off! 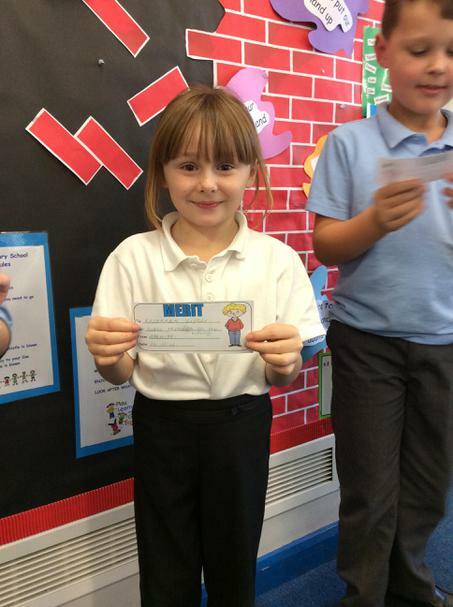 Mrs Jackson came and handed out our merits we had earned. 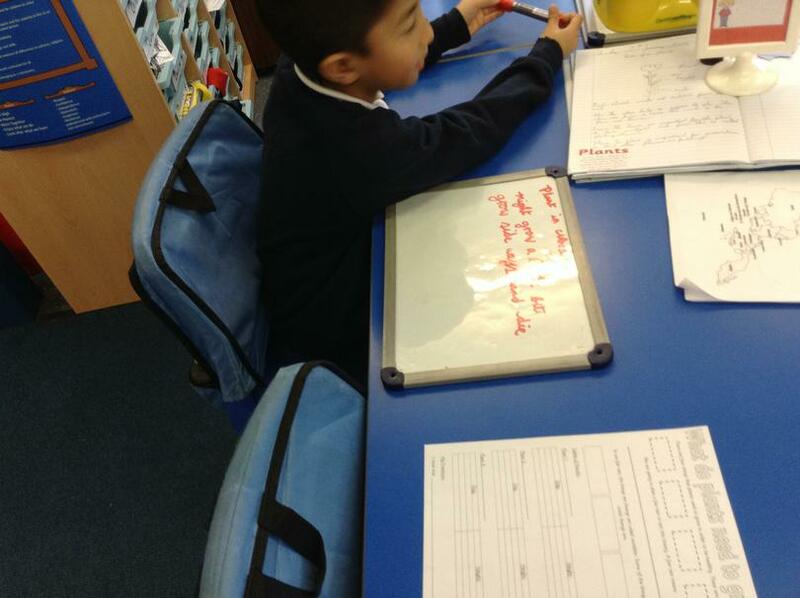 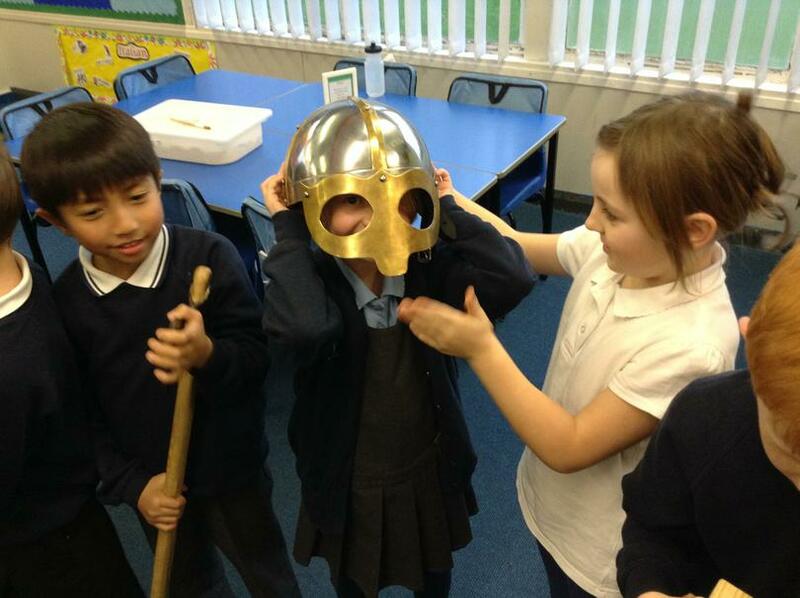 This week has been a brilliant week in Year 3. 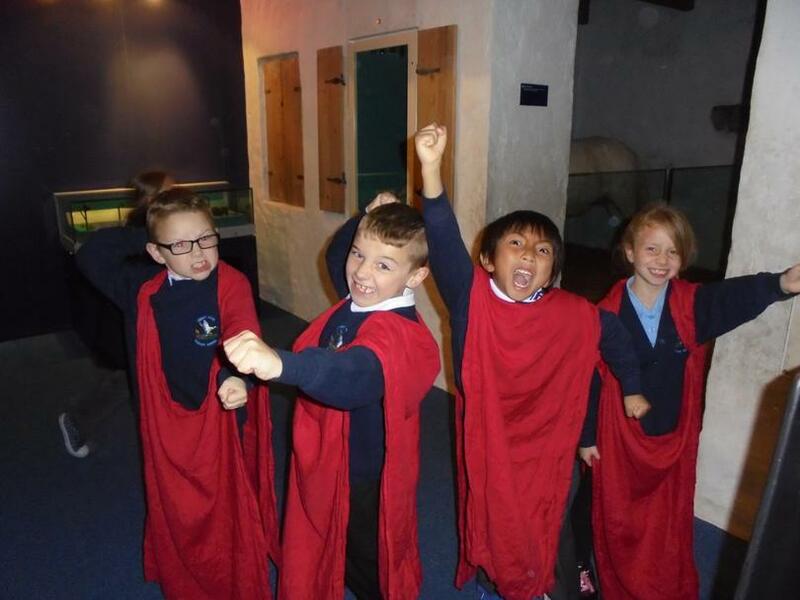 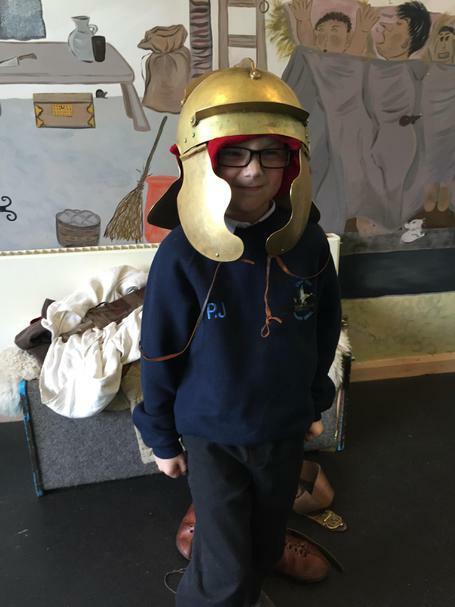 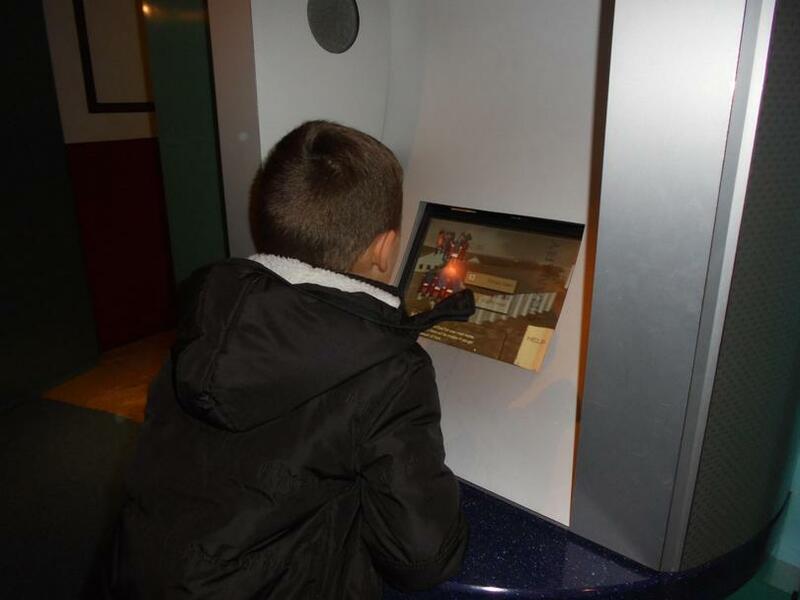 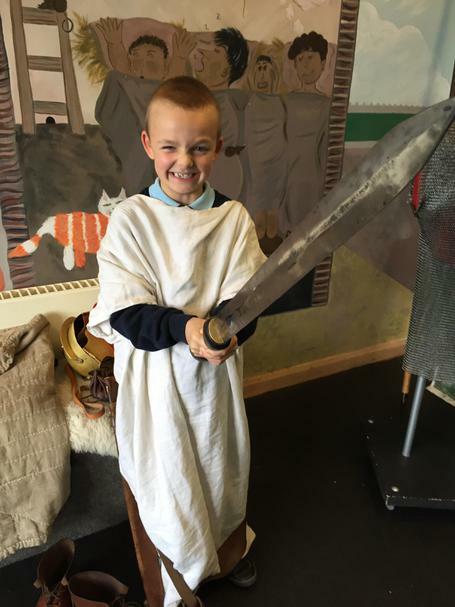 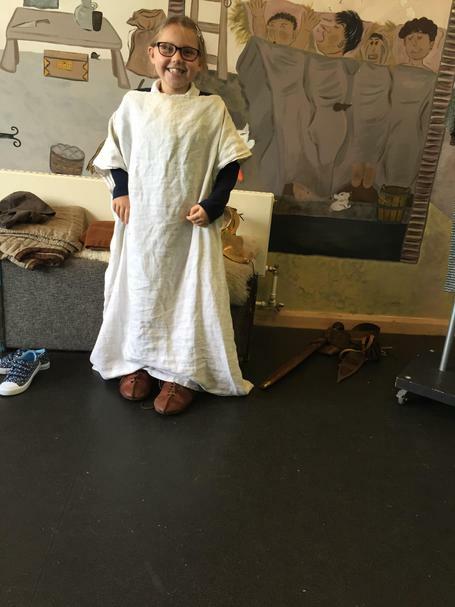 We began our week with a trip to Segedunum to learn more about the Romans. 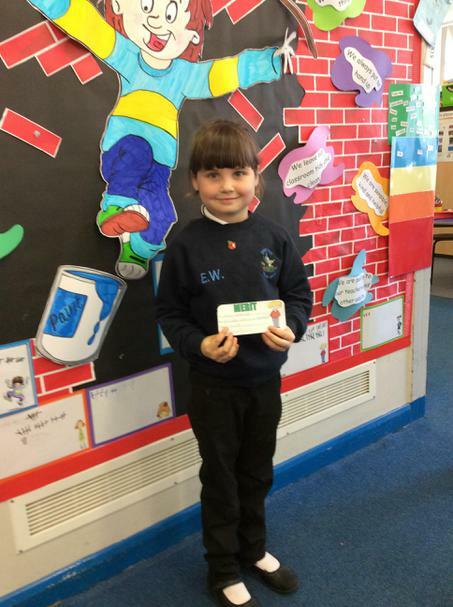 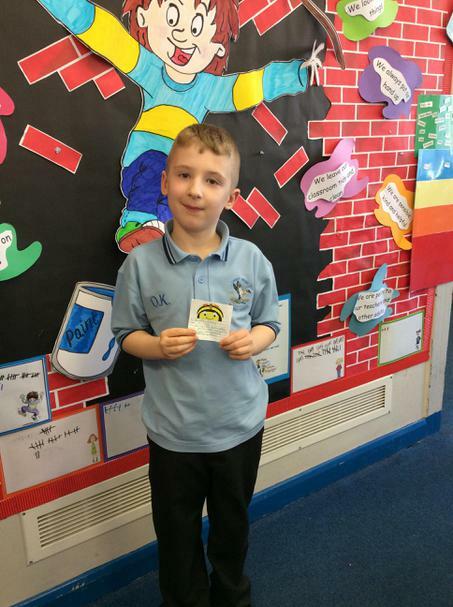 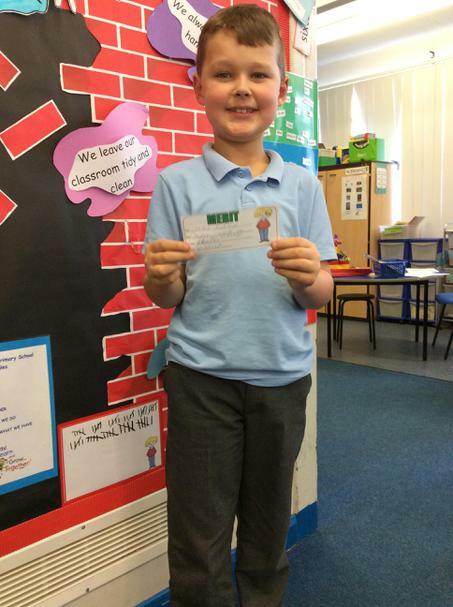 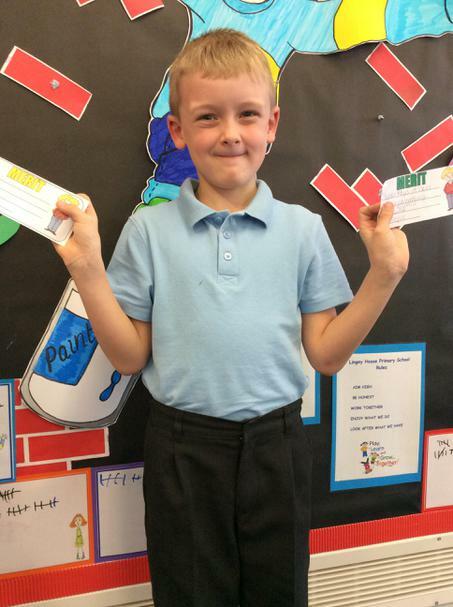 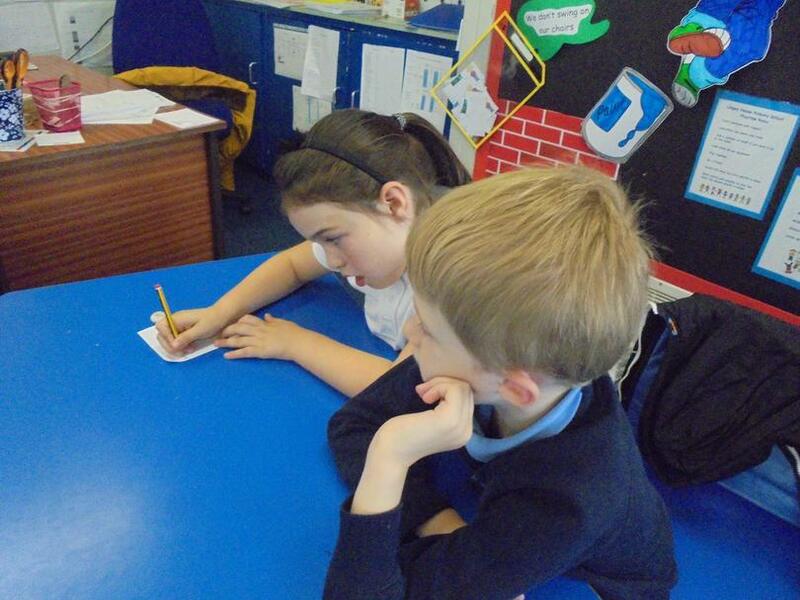 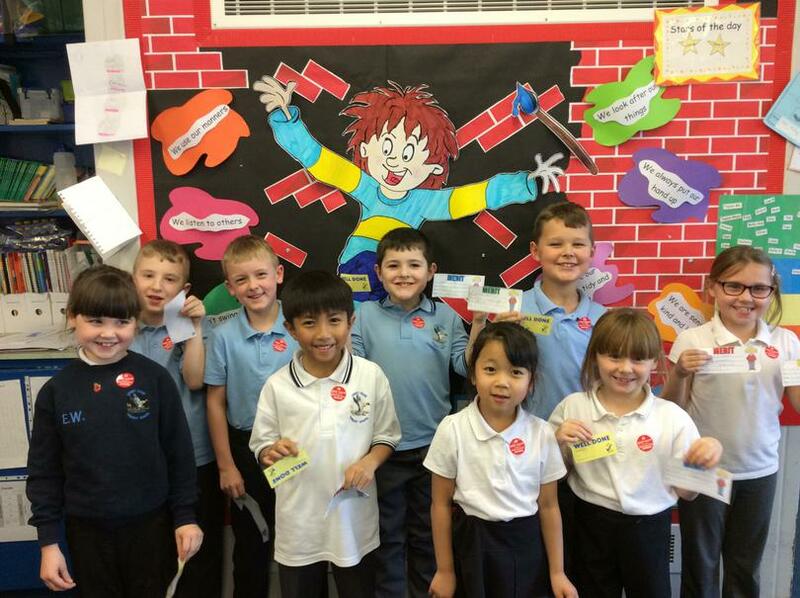 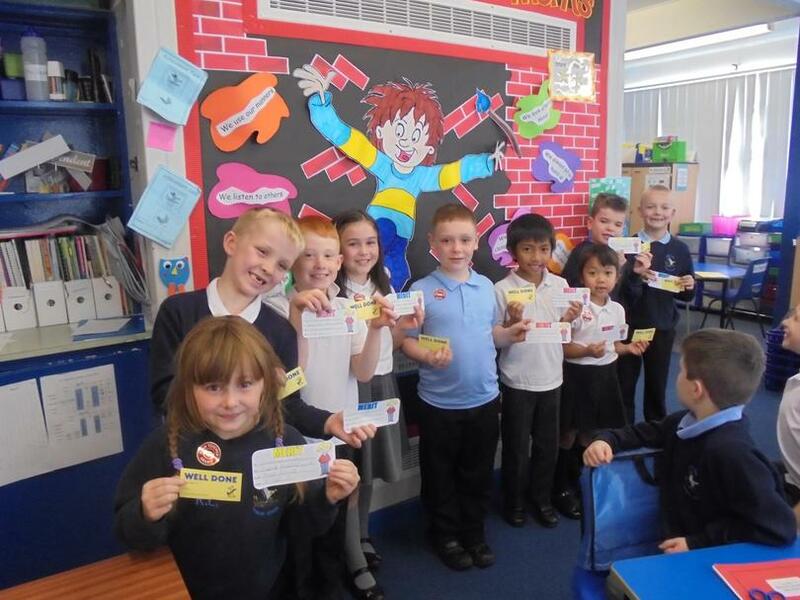 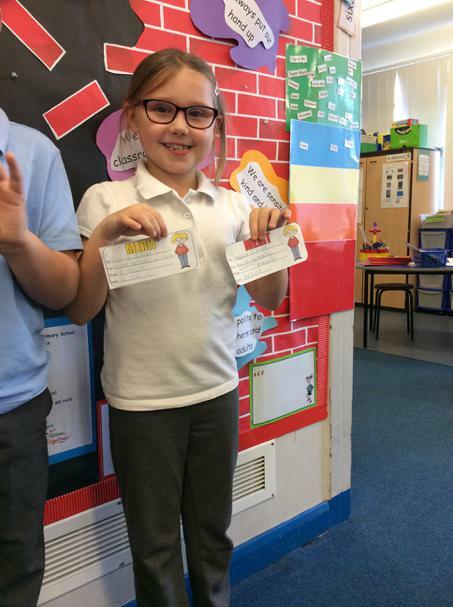 Over the week, we have also completed a French and a Maths trail. 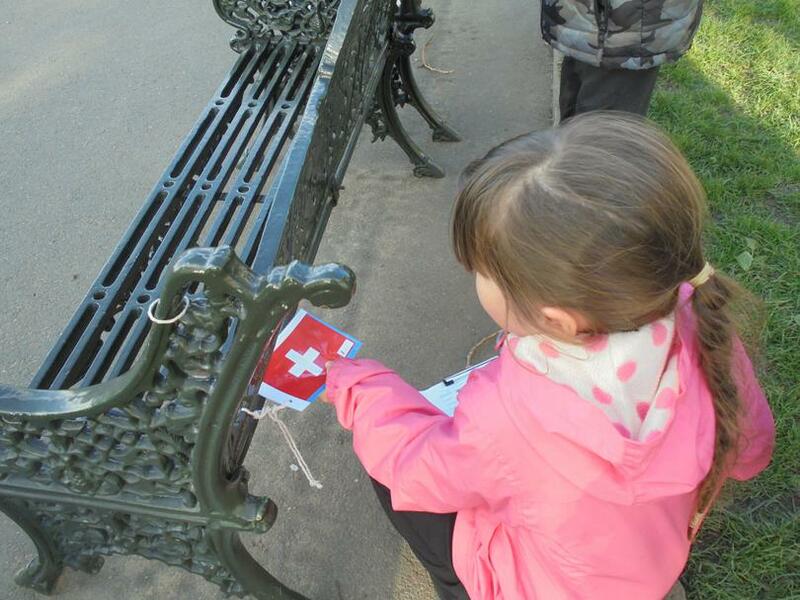 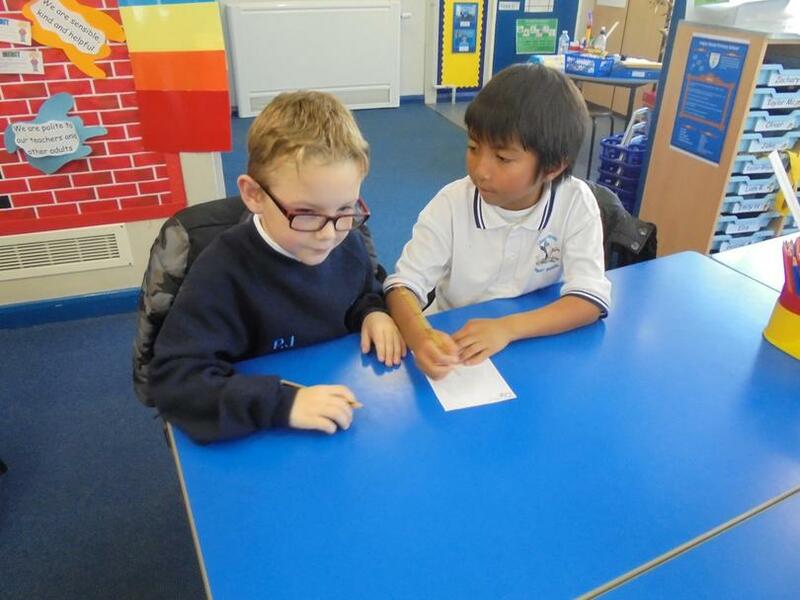 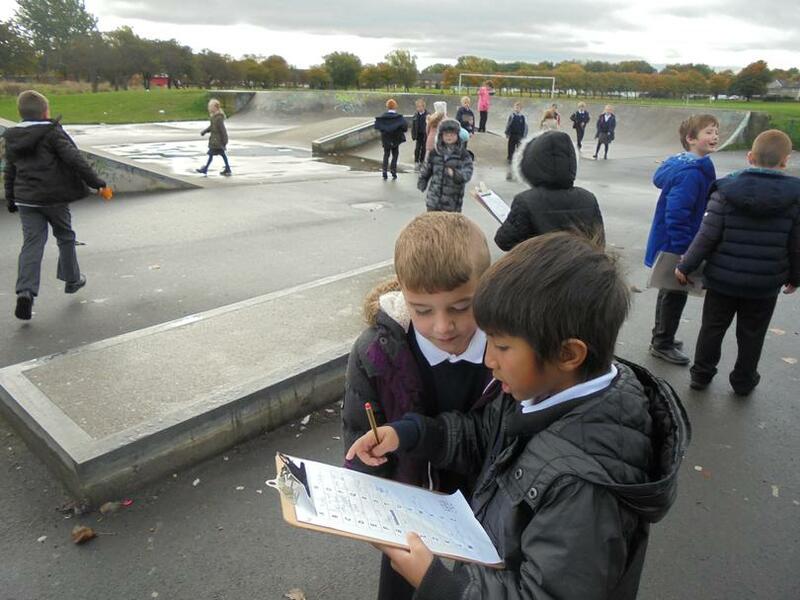 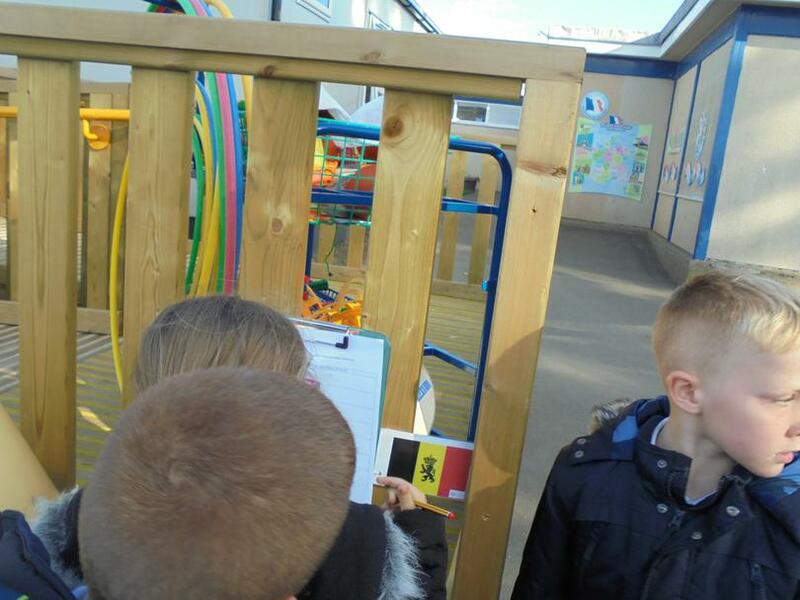 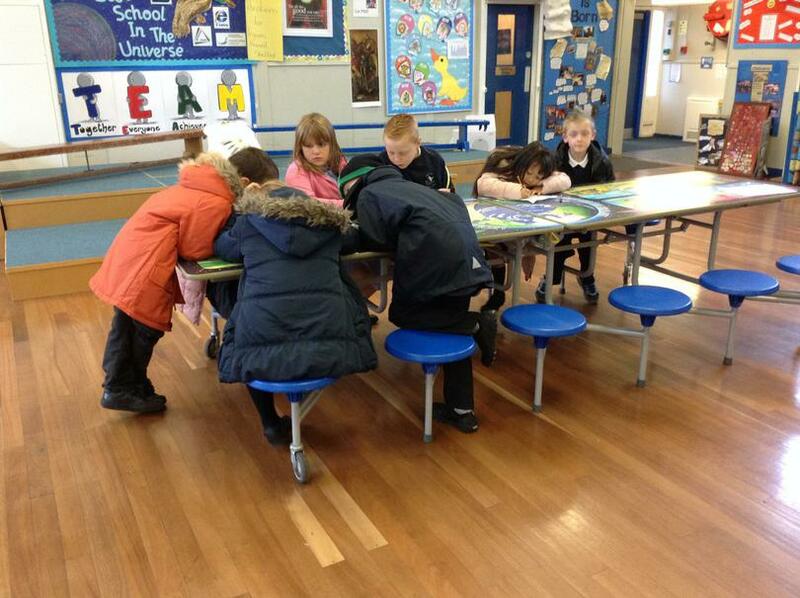 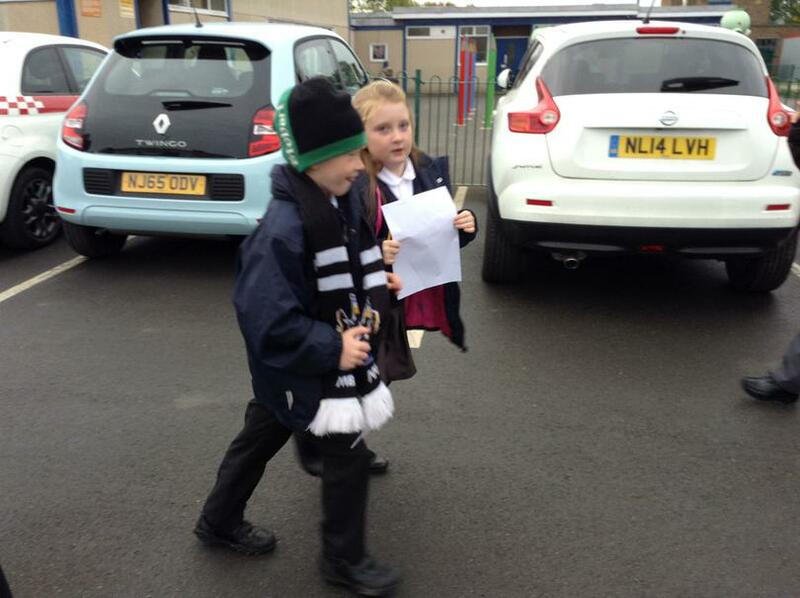 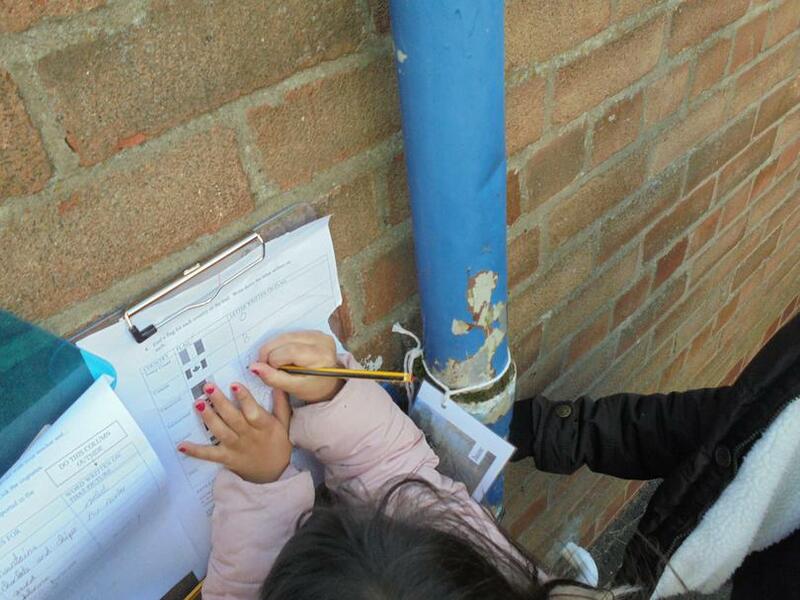 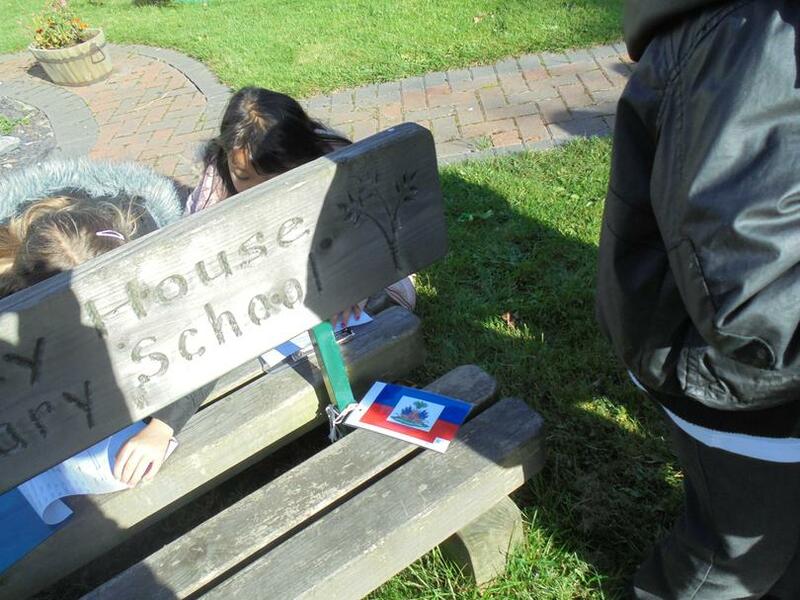 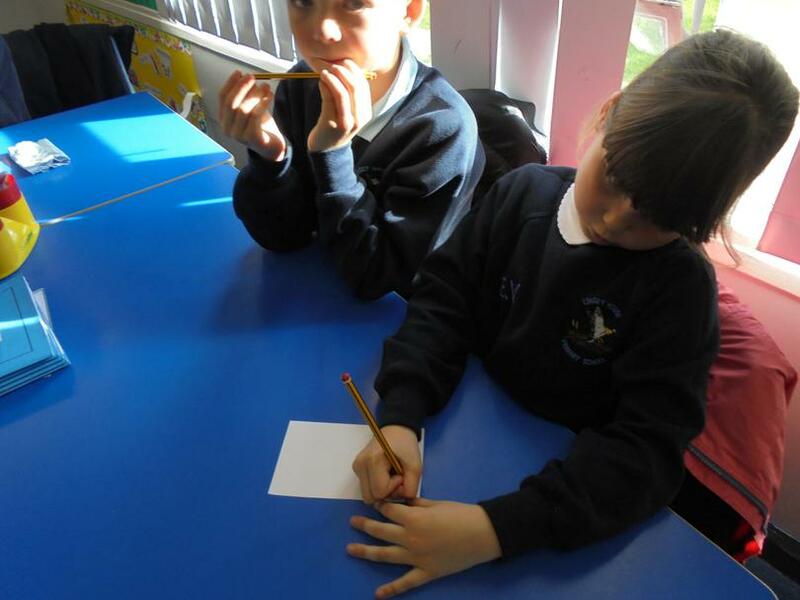 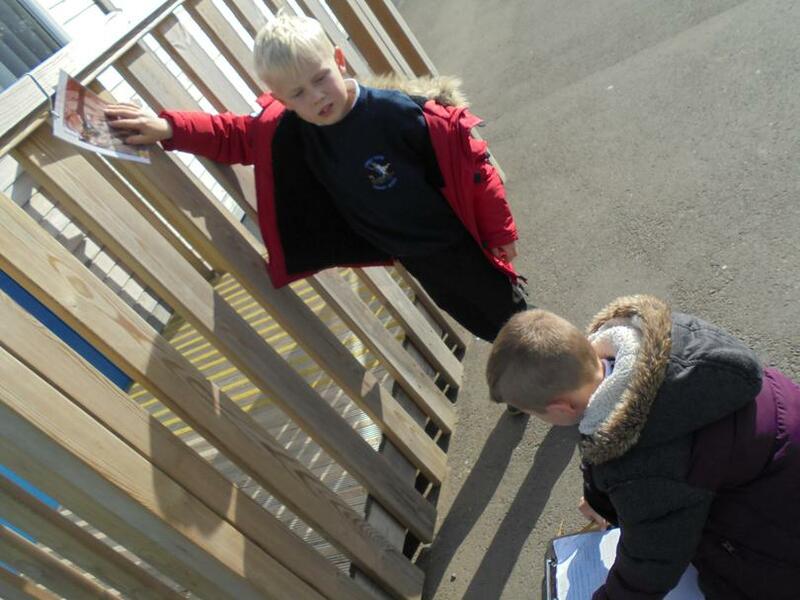 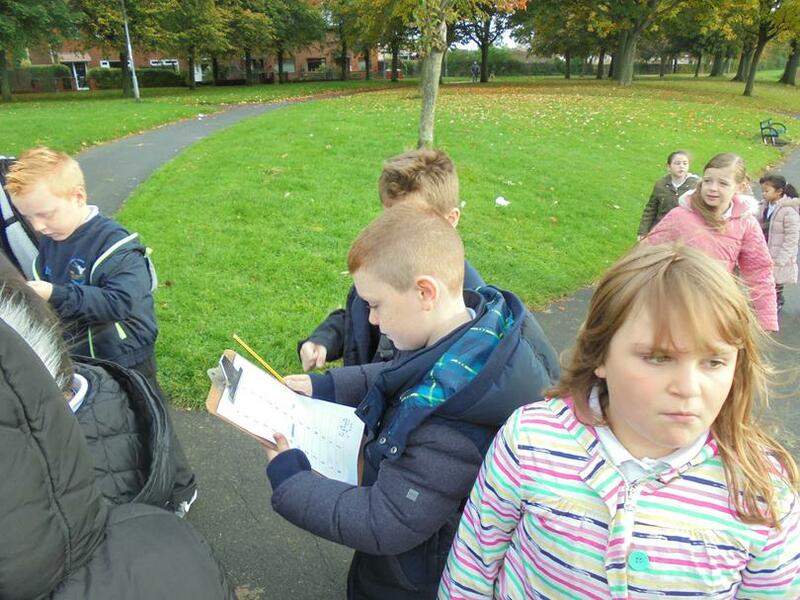 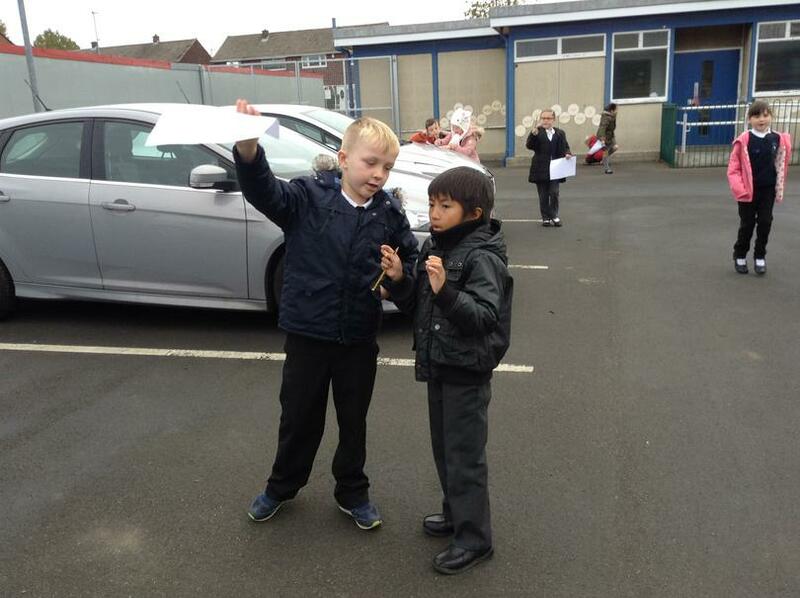 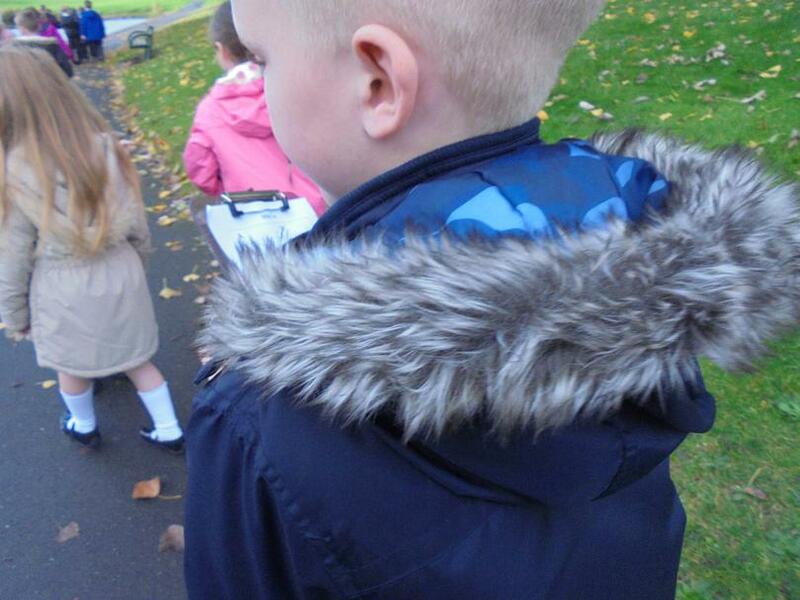 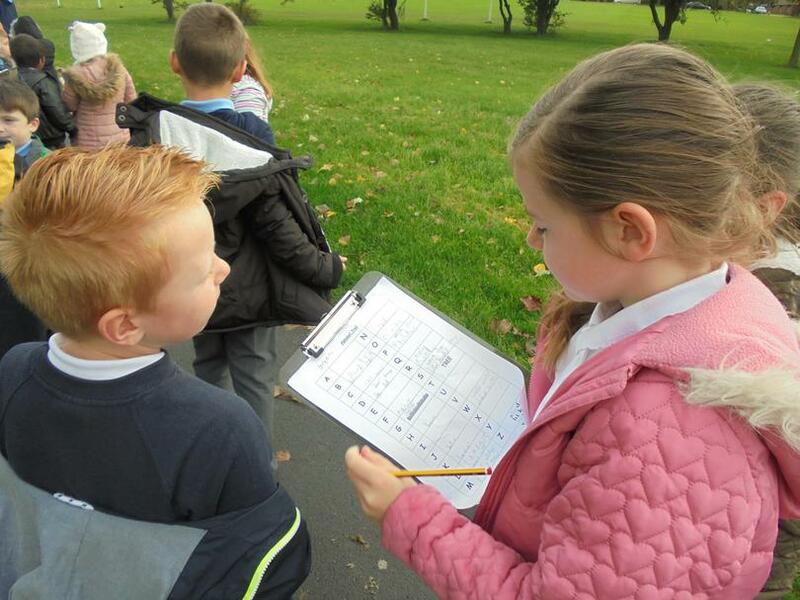 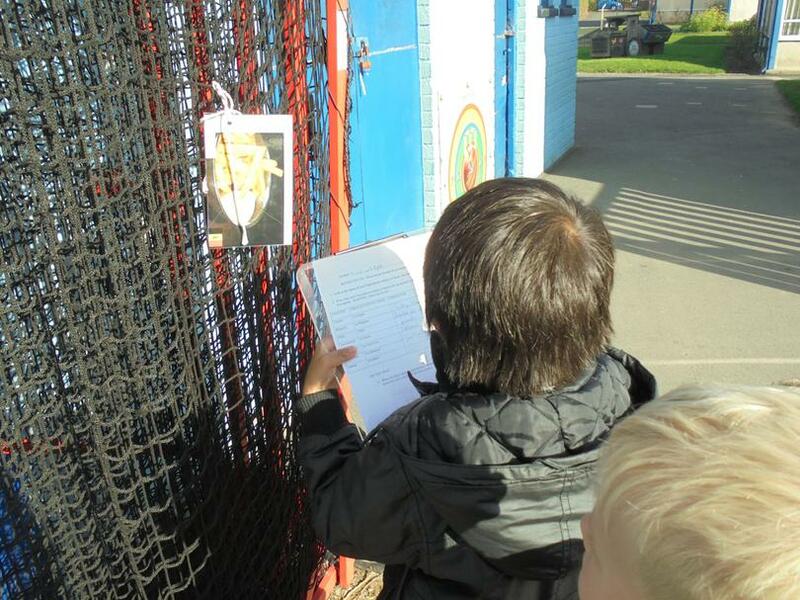 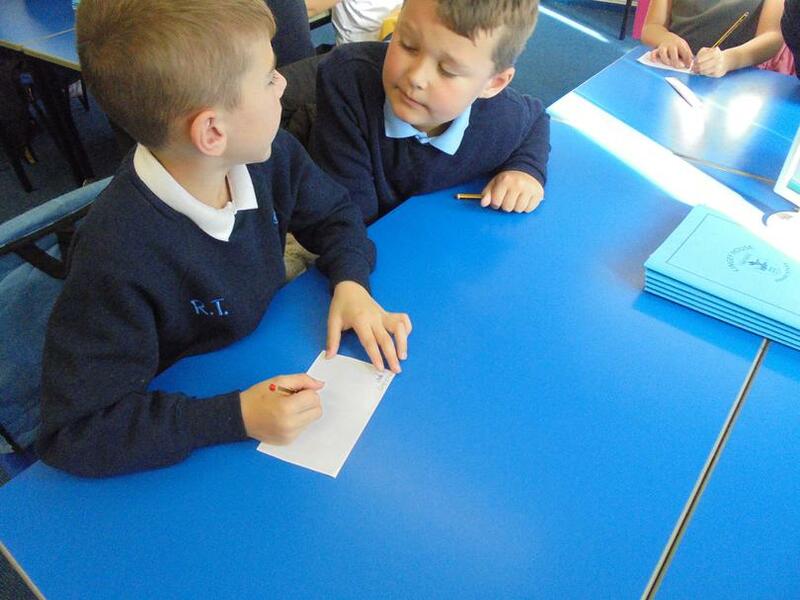 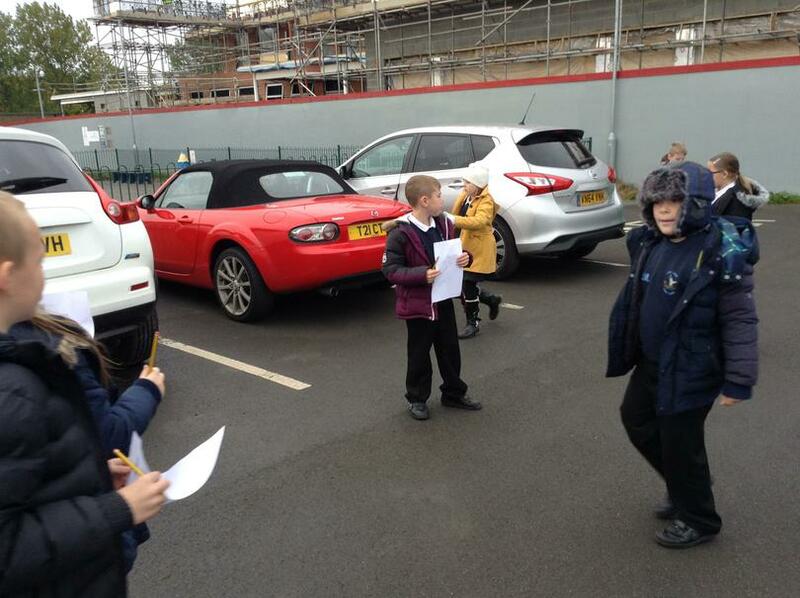 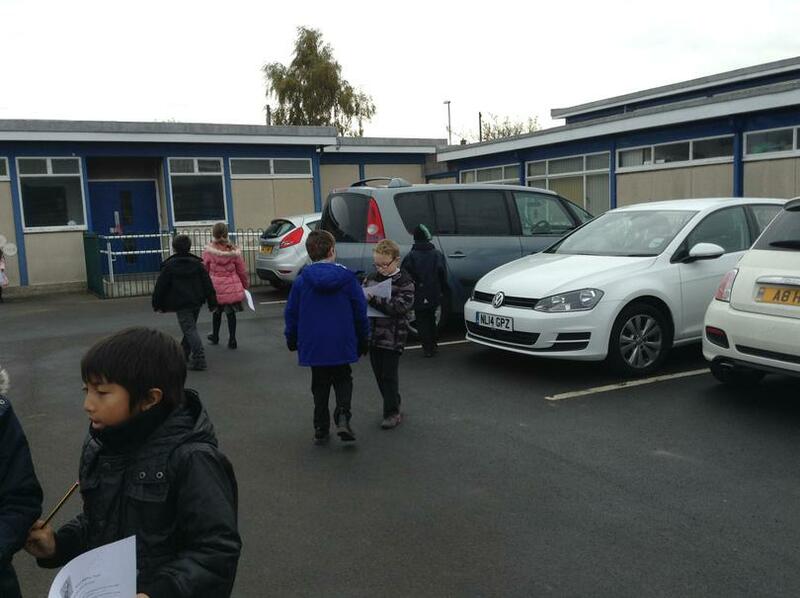 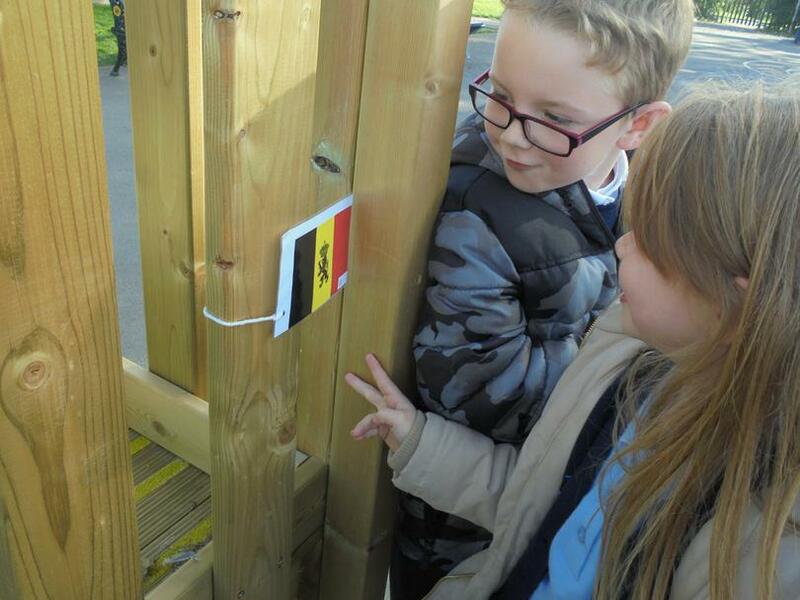 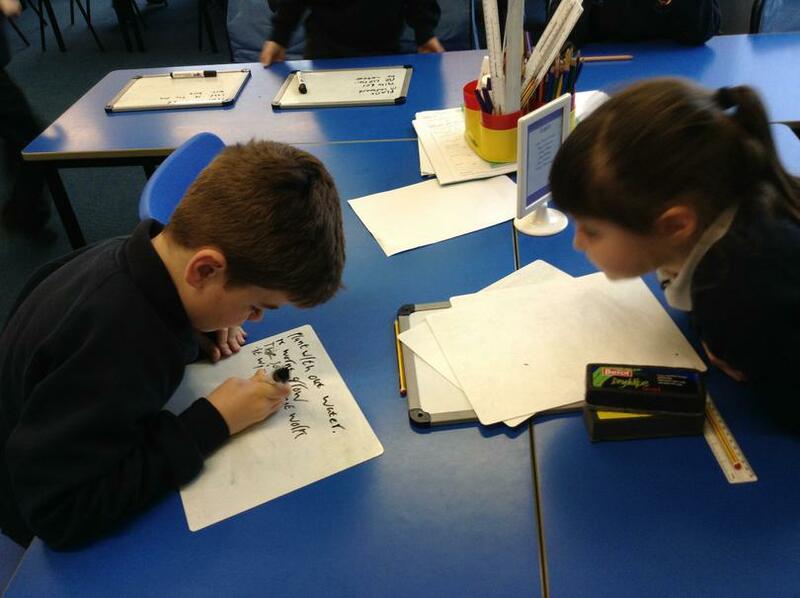 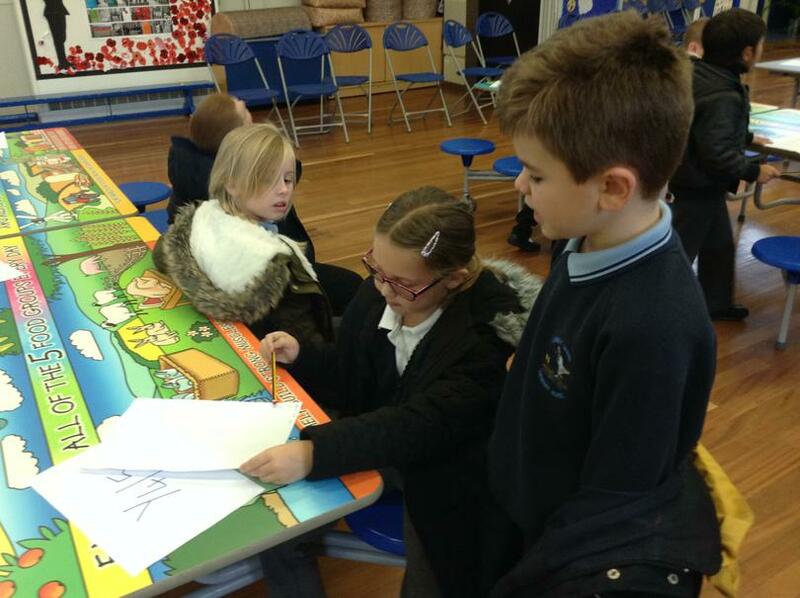 The French trail involved us working in pairs and finding clues hidden around school to crack Mrs Moses' code. 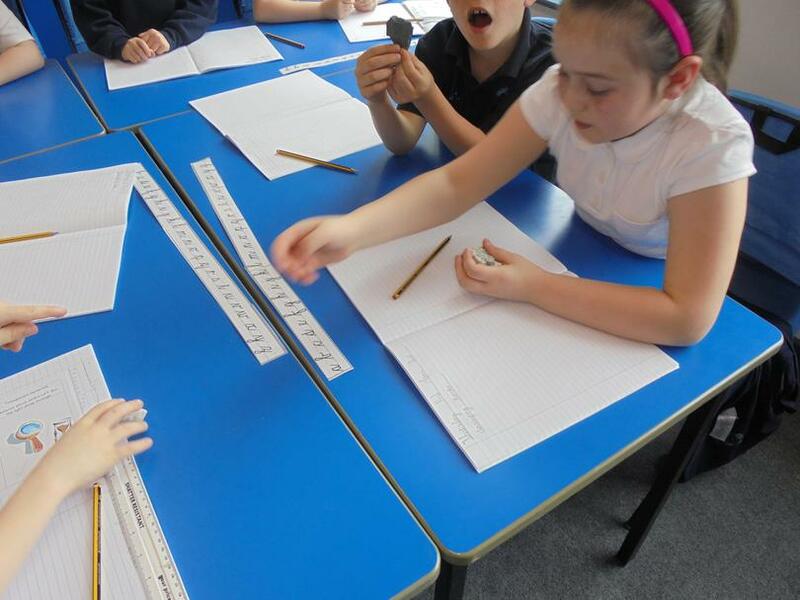 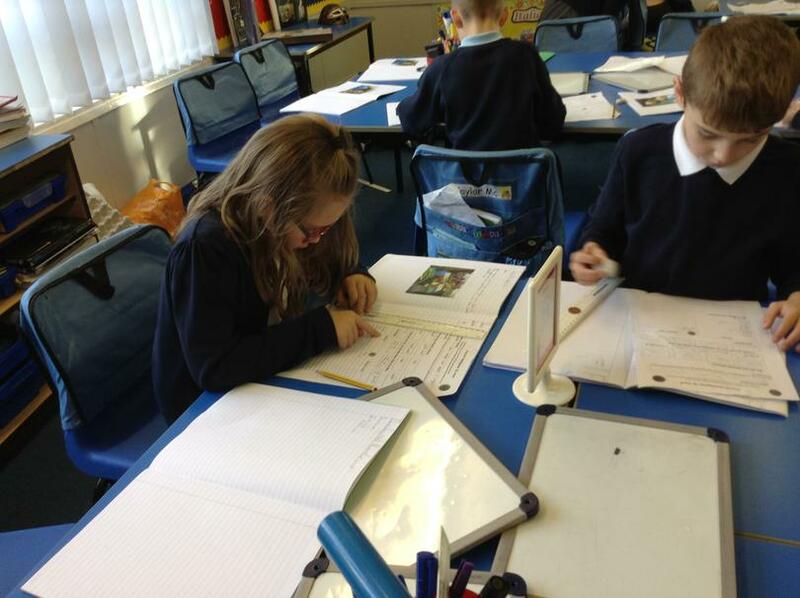 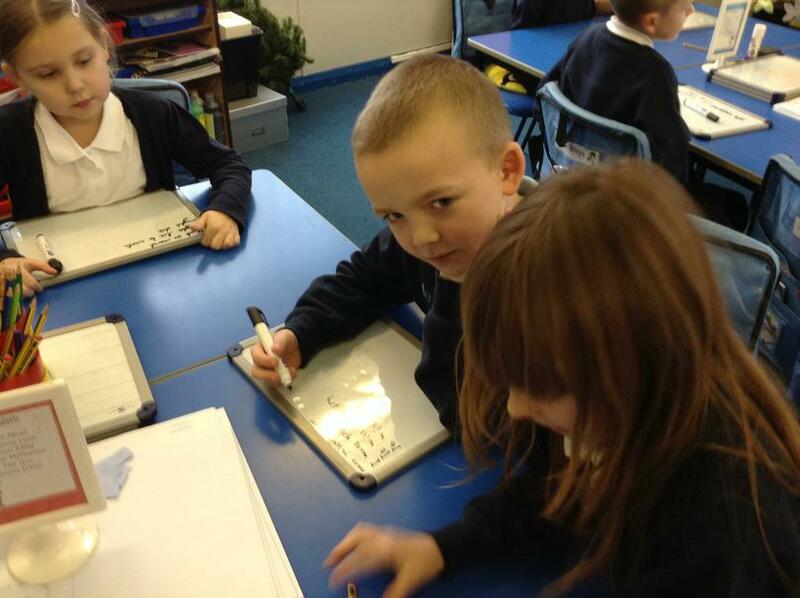 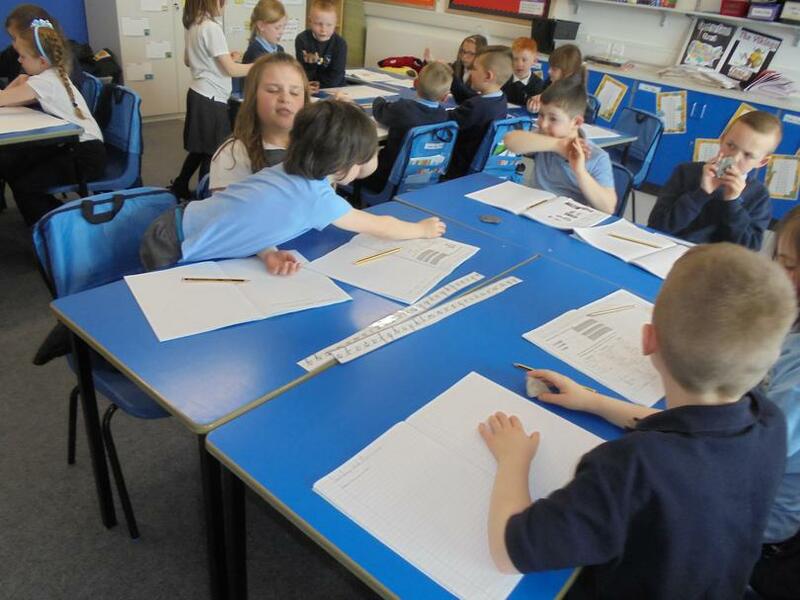 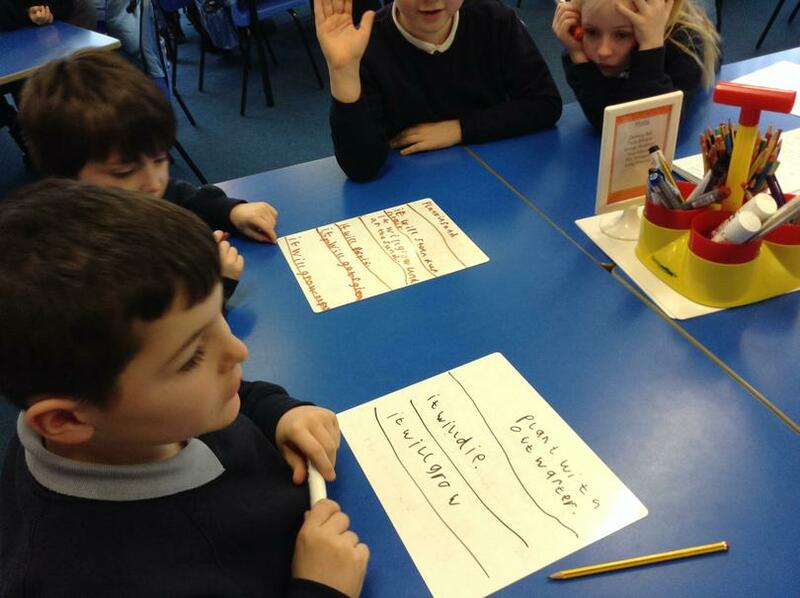 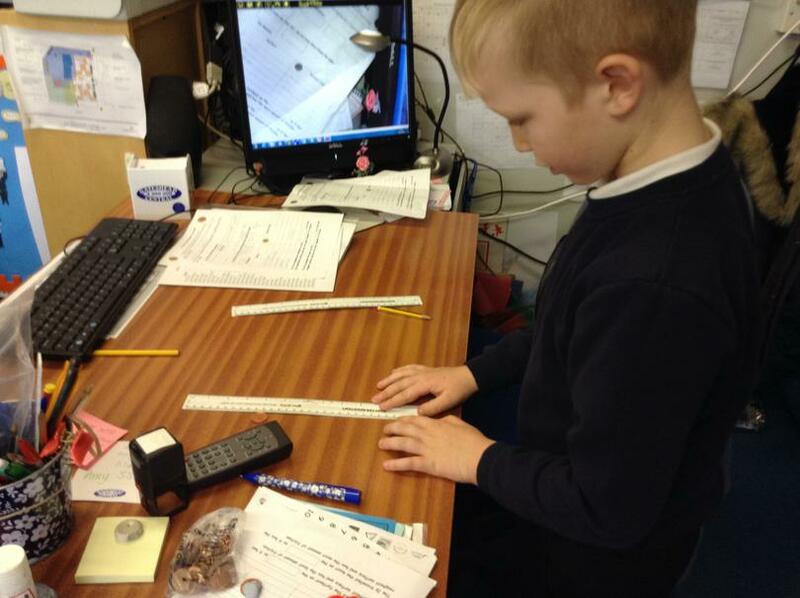 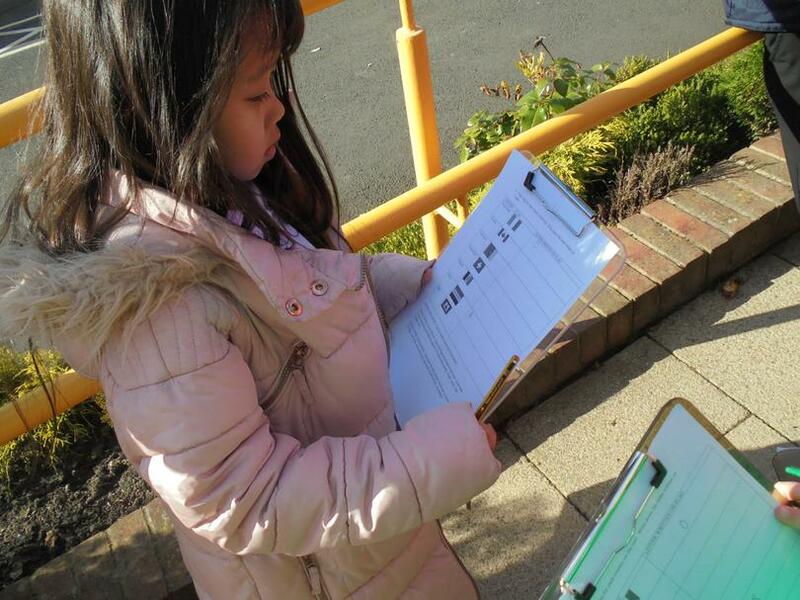 The Maths trail we completed required us to use a range of different operations to answer questions. 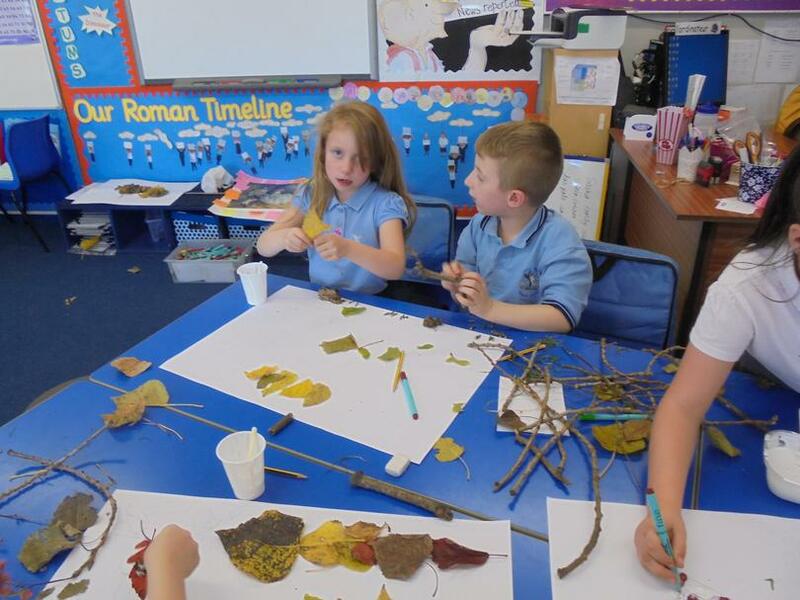 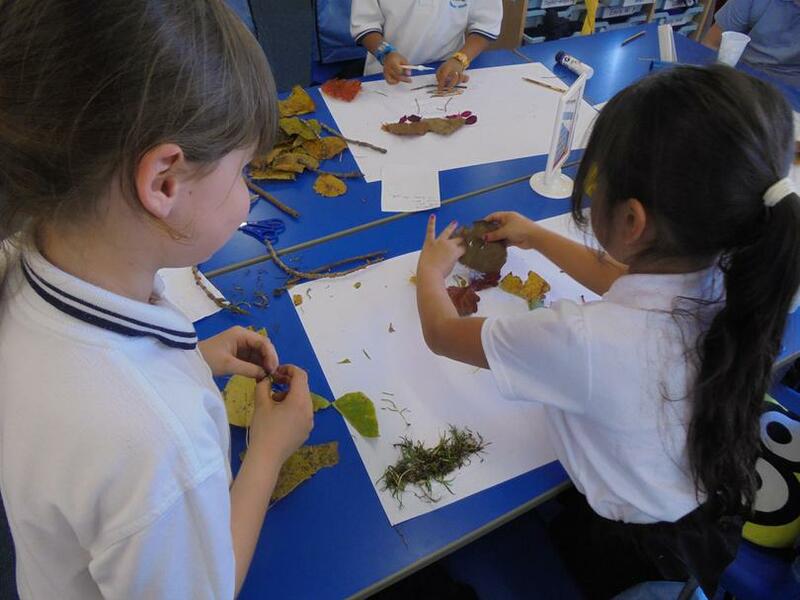 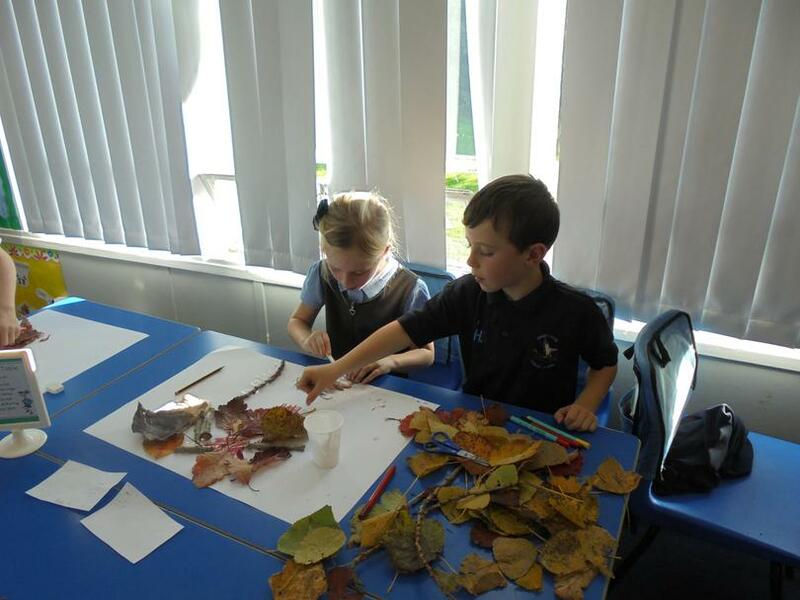 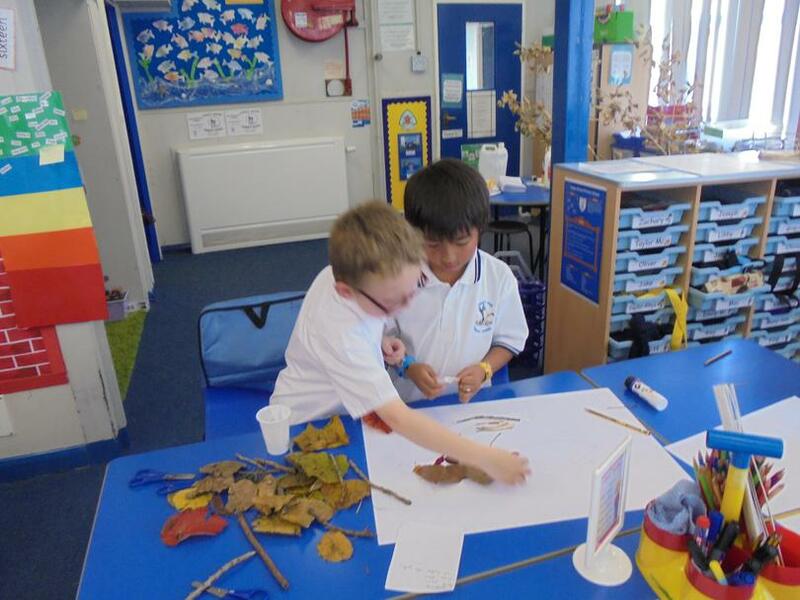 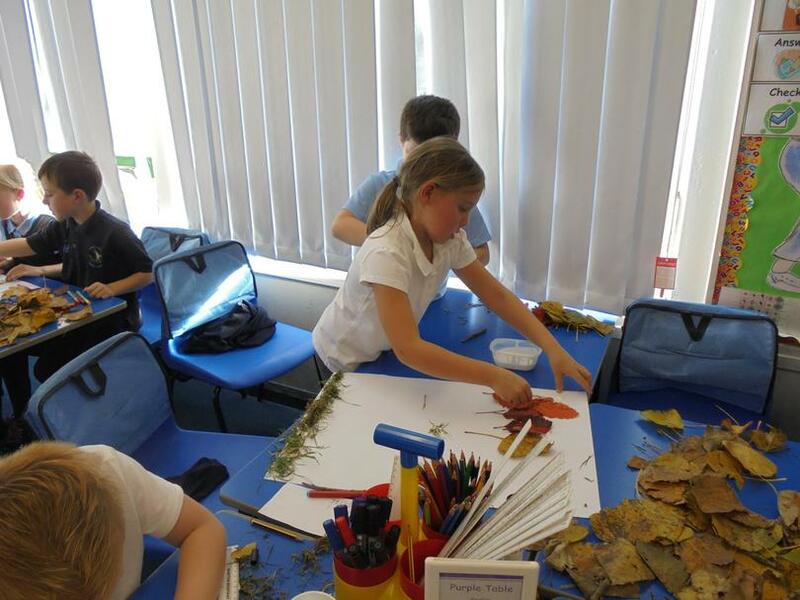 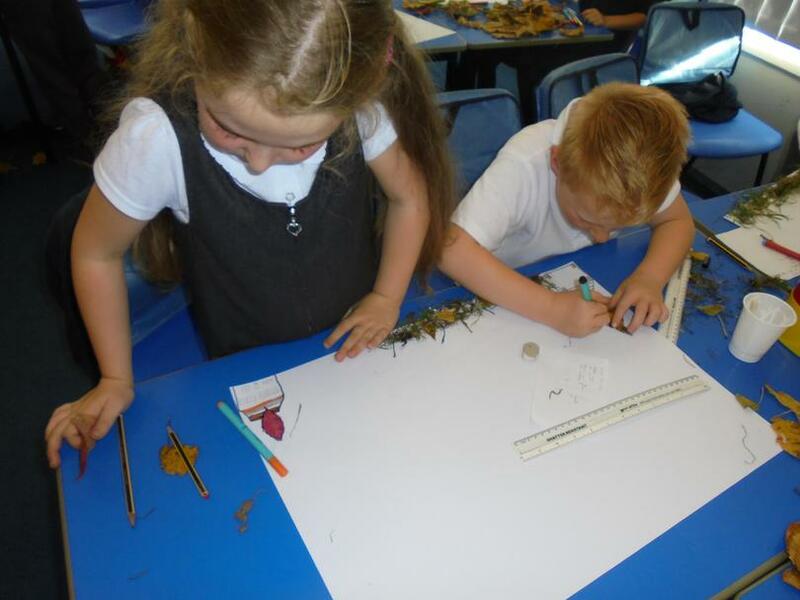 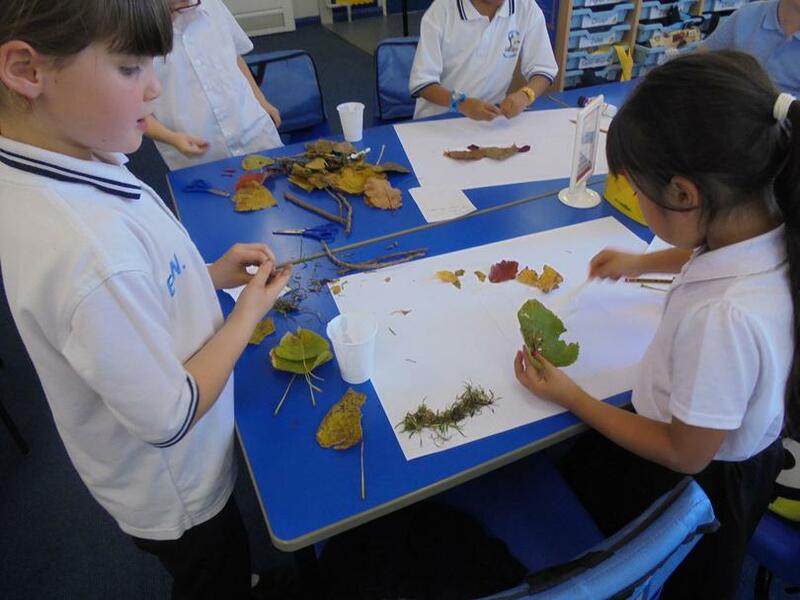 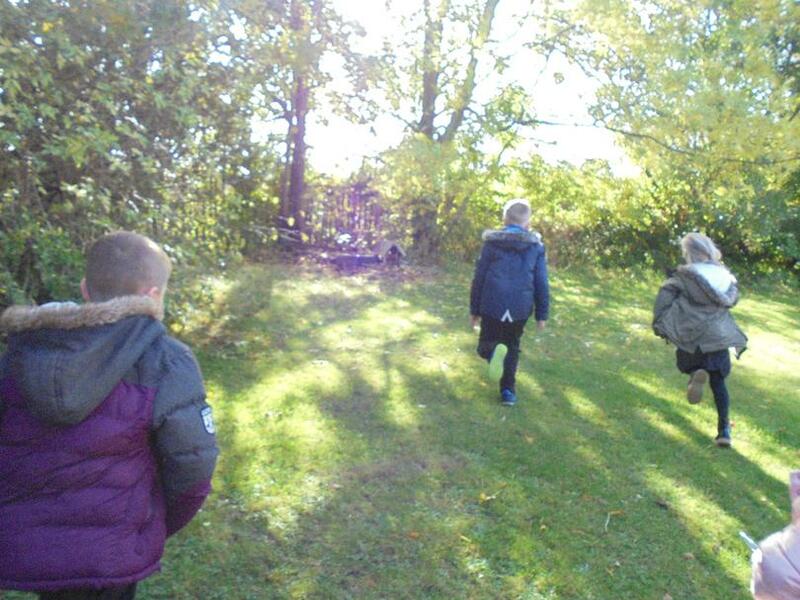 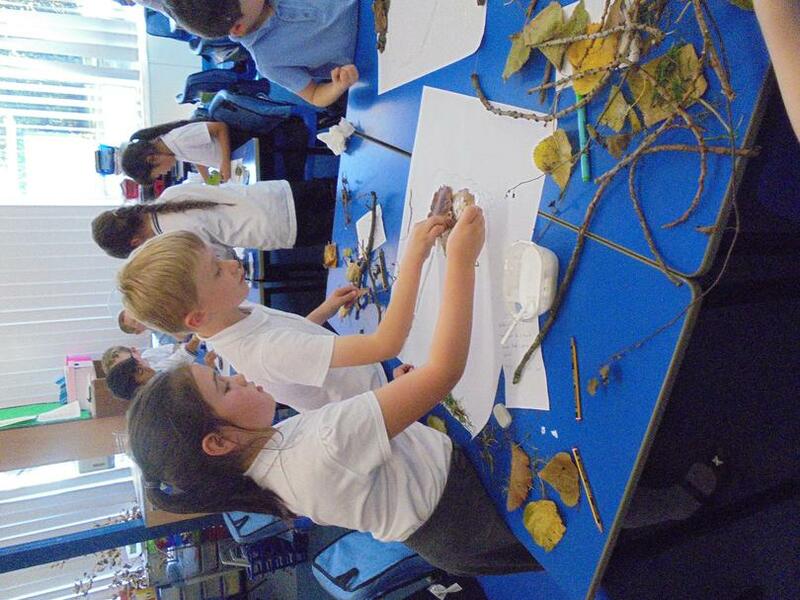 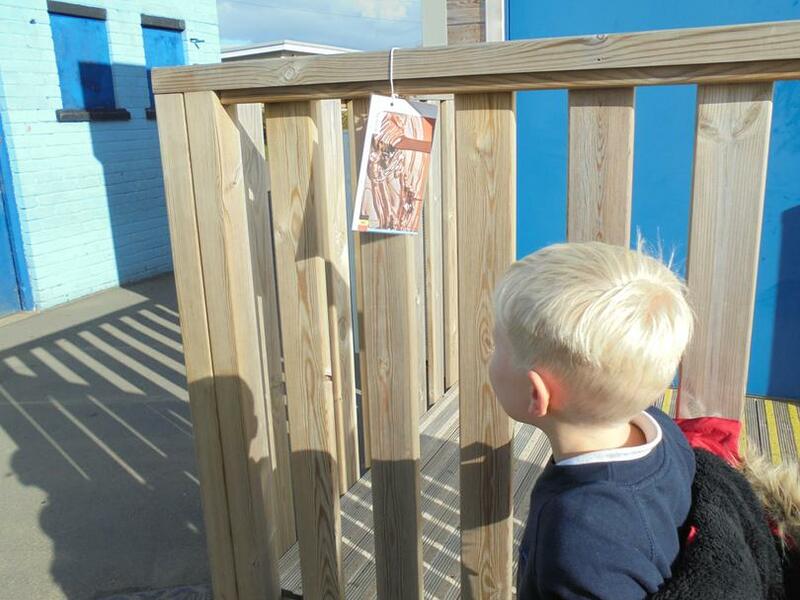 We have also created autumnal pictures using materials we found outside and participated in team building activities with Miss Needham. 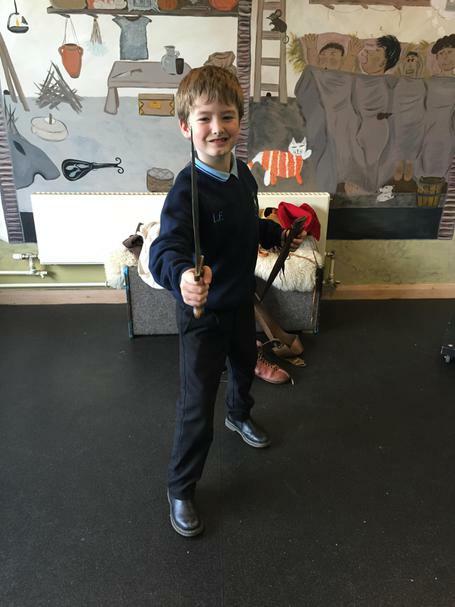 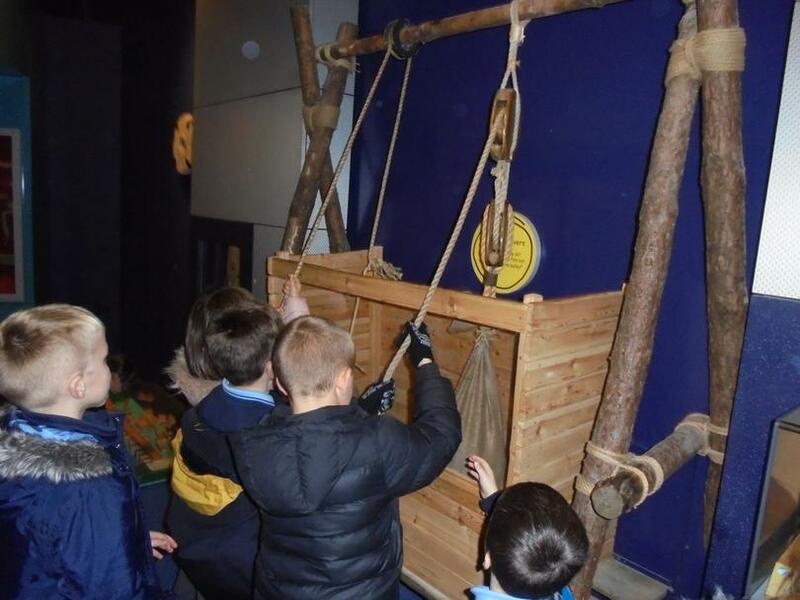 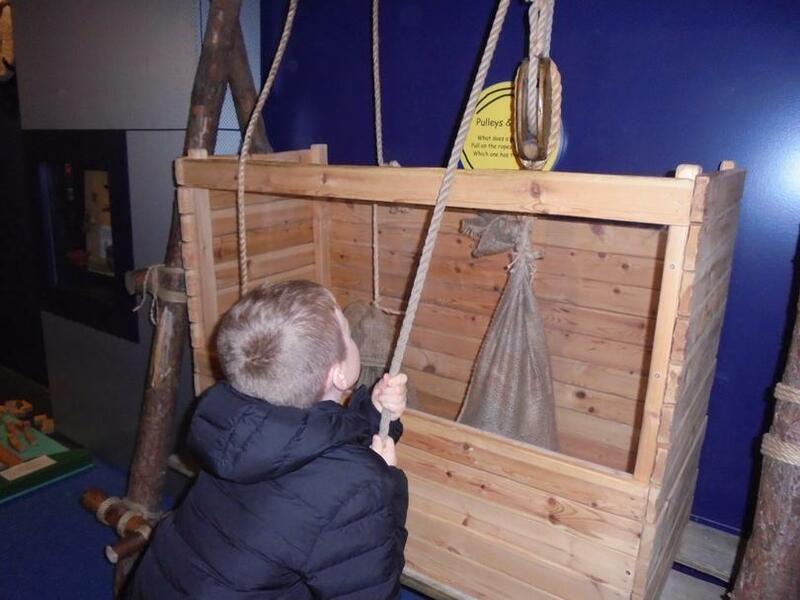 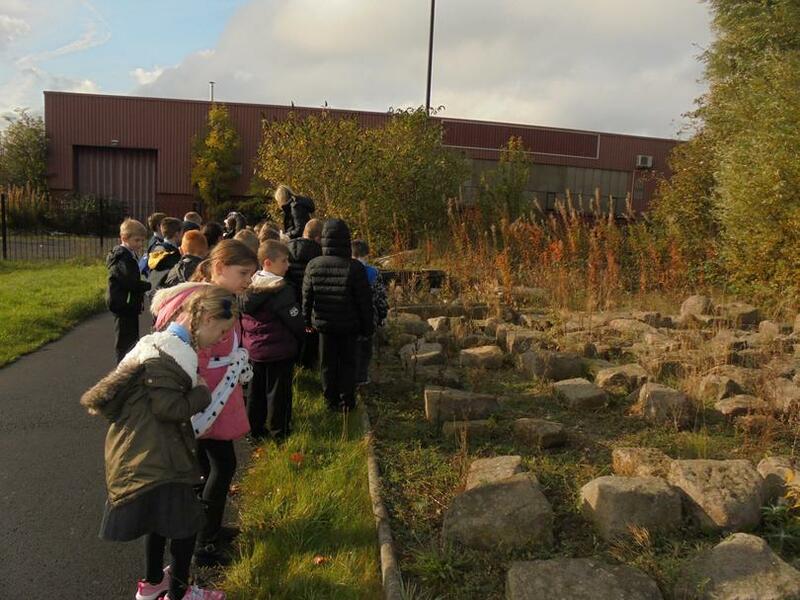 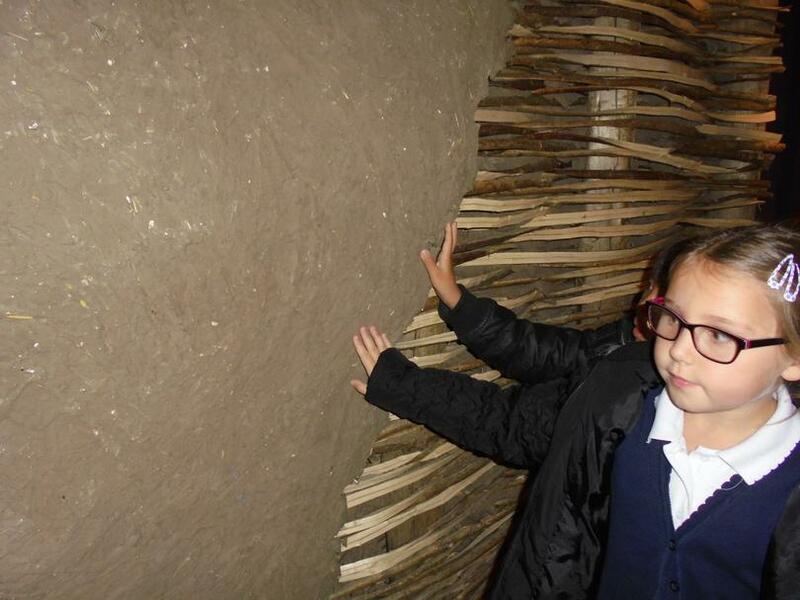 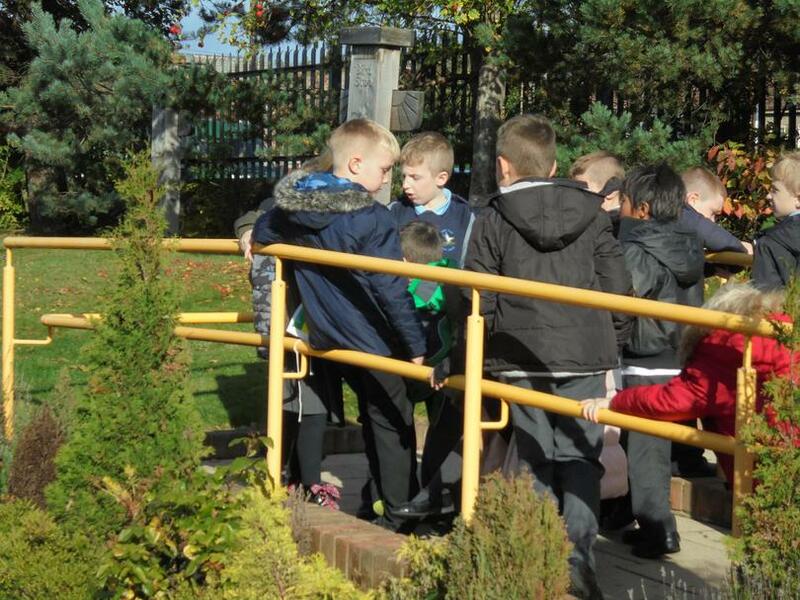 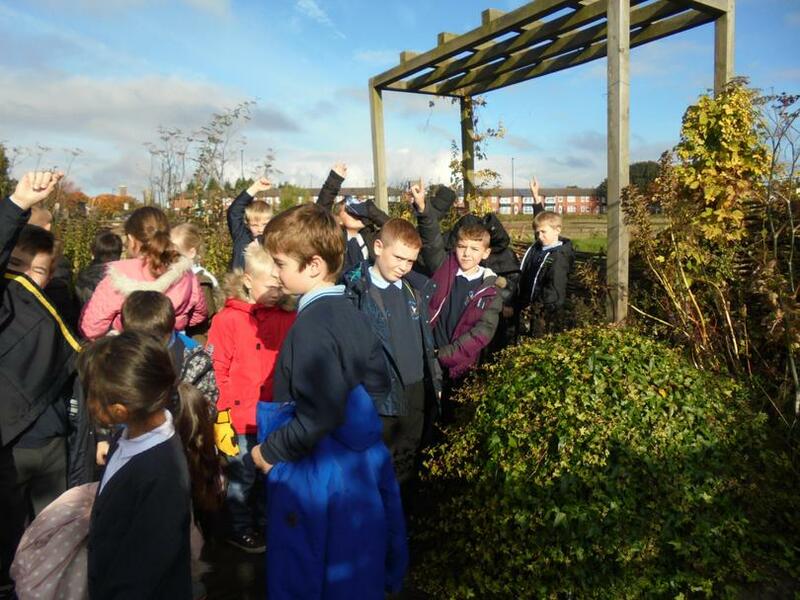 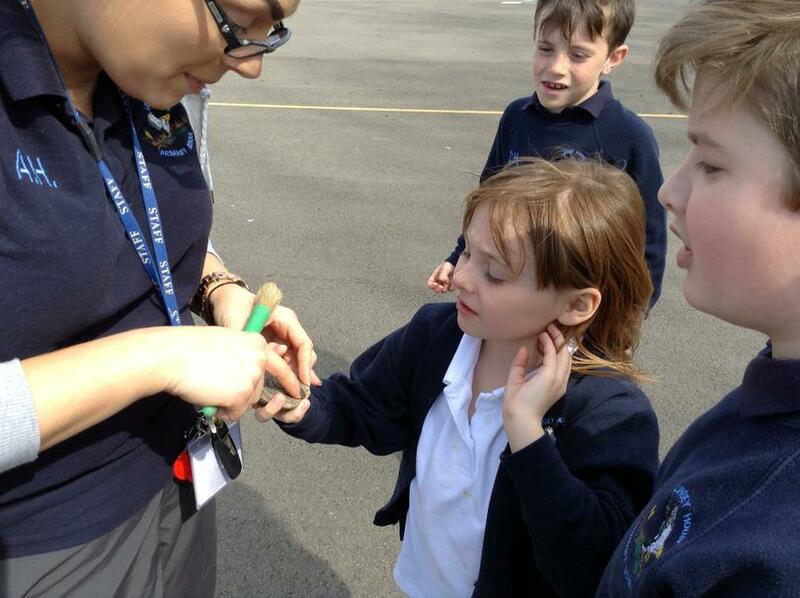 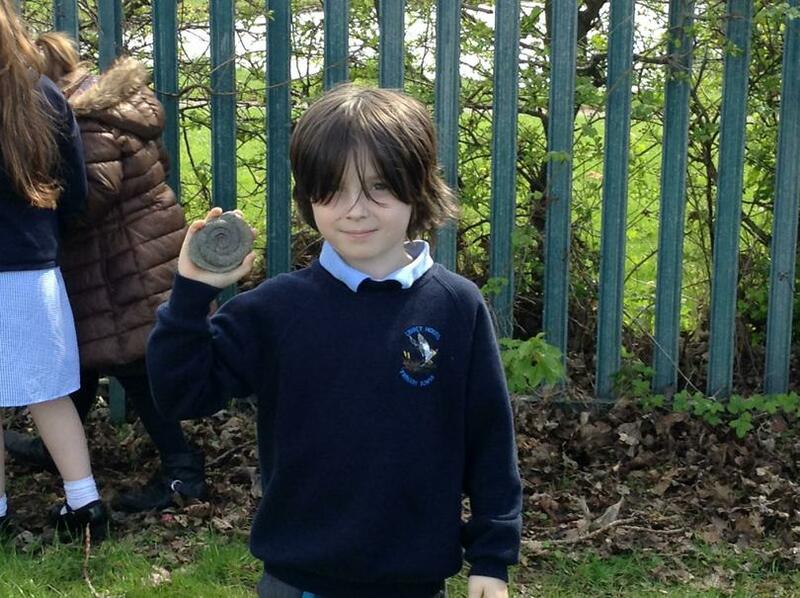 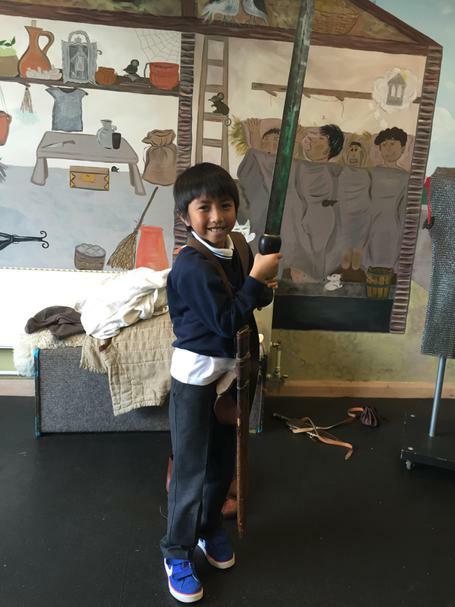 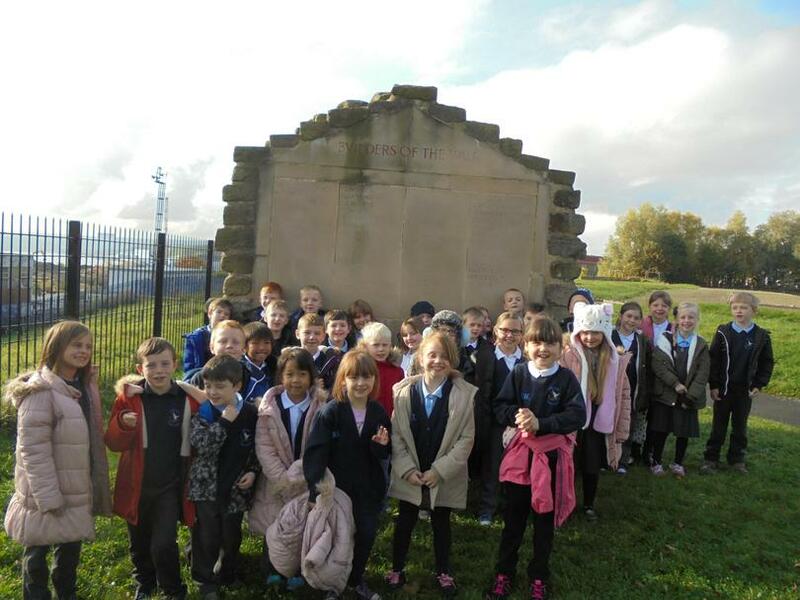 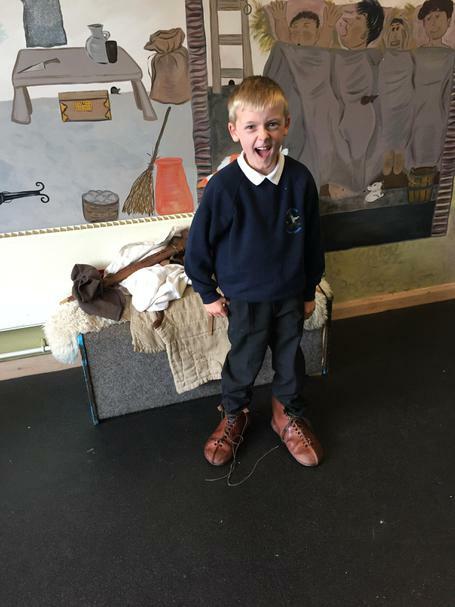 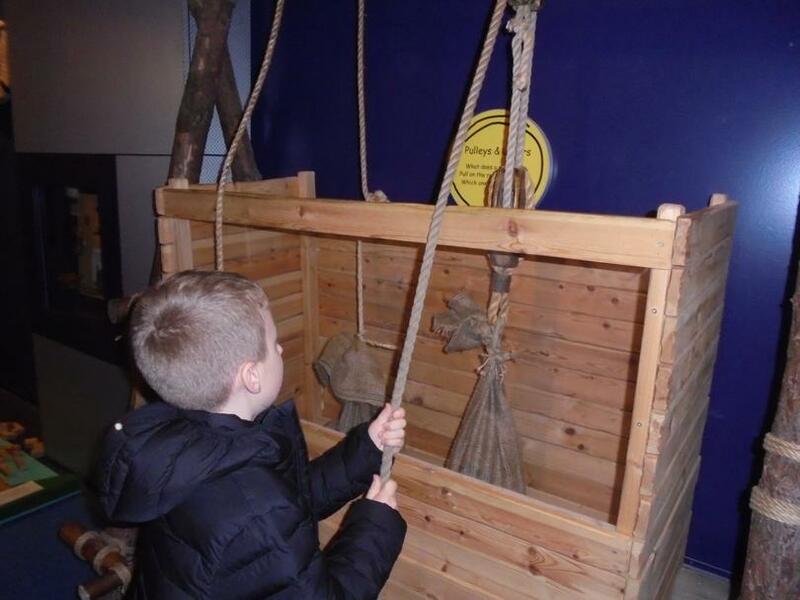 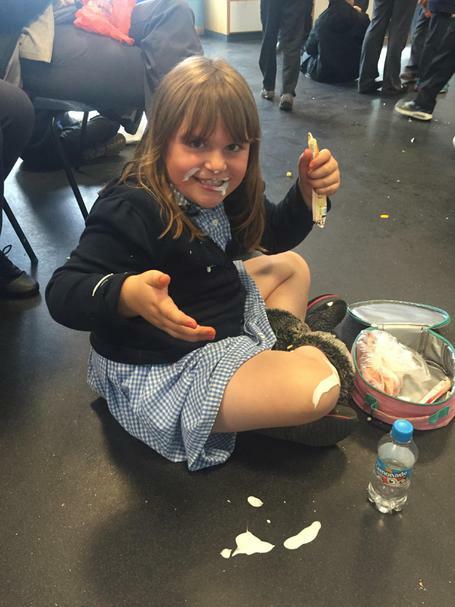 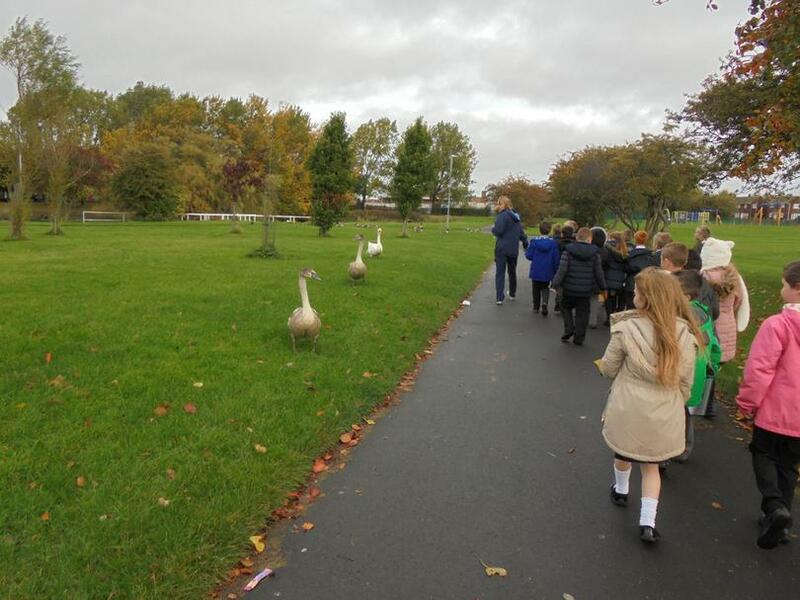 During Outdoor Learning Week, we went to Segedunum in Wallsend. 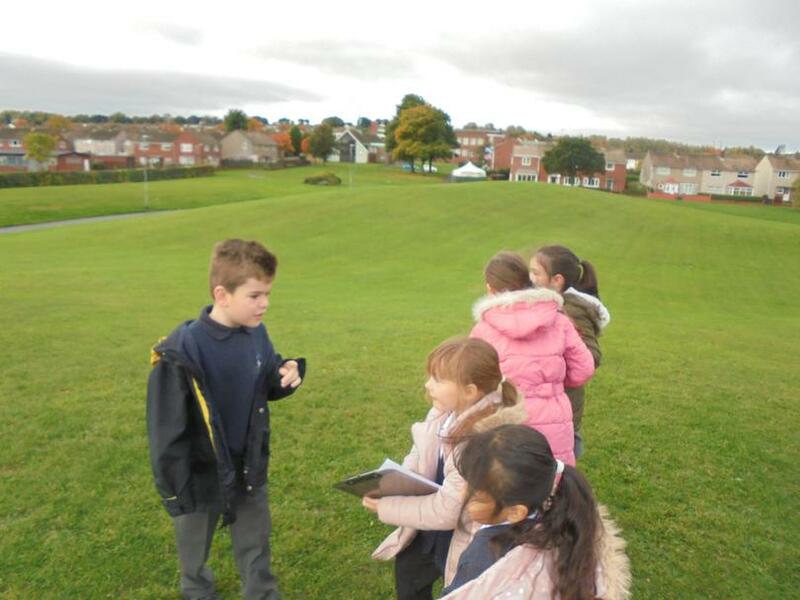 We learnt lots of interesting facts about the Roman fort and had the chance to explore the ruins. 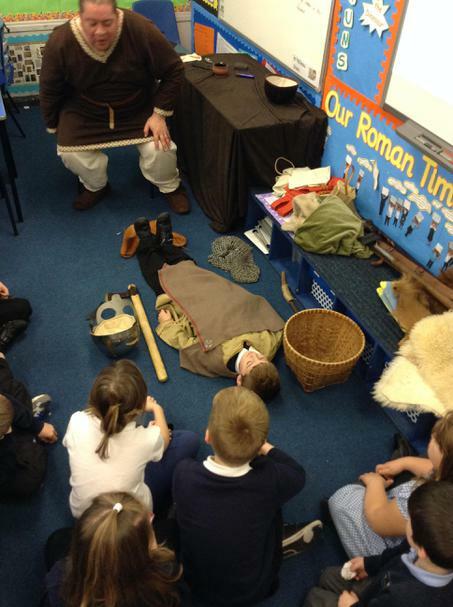 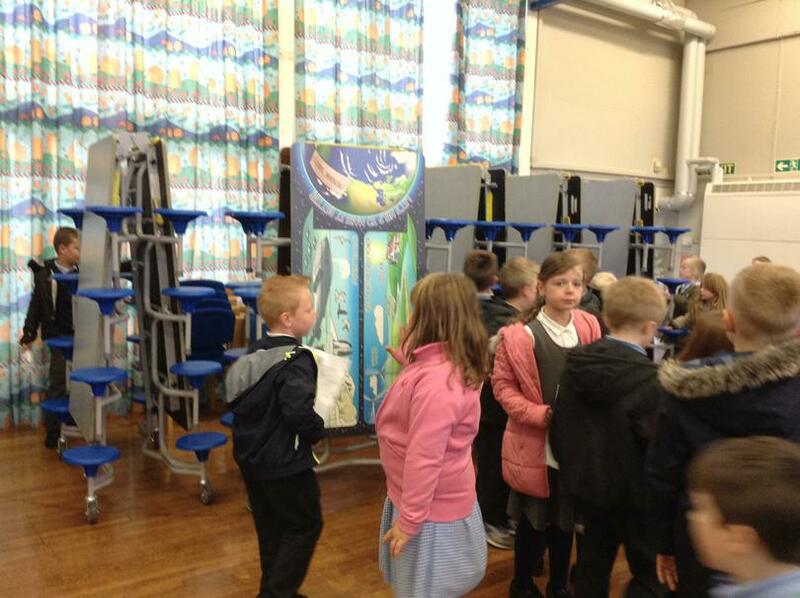 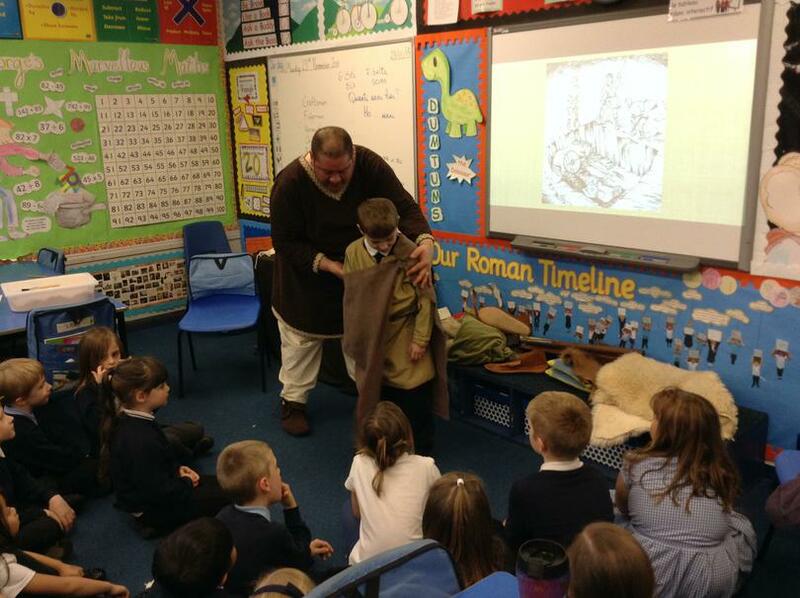 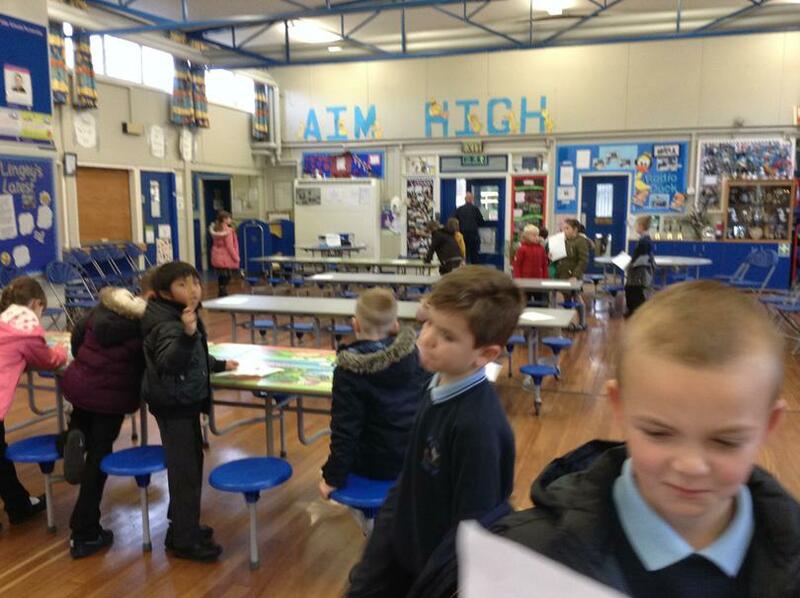 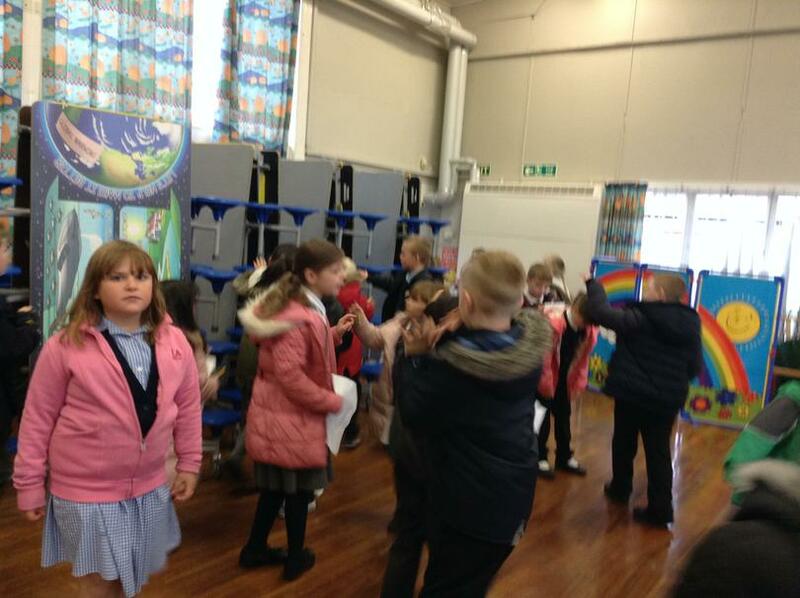 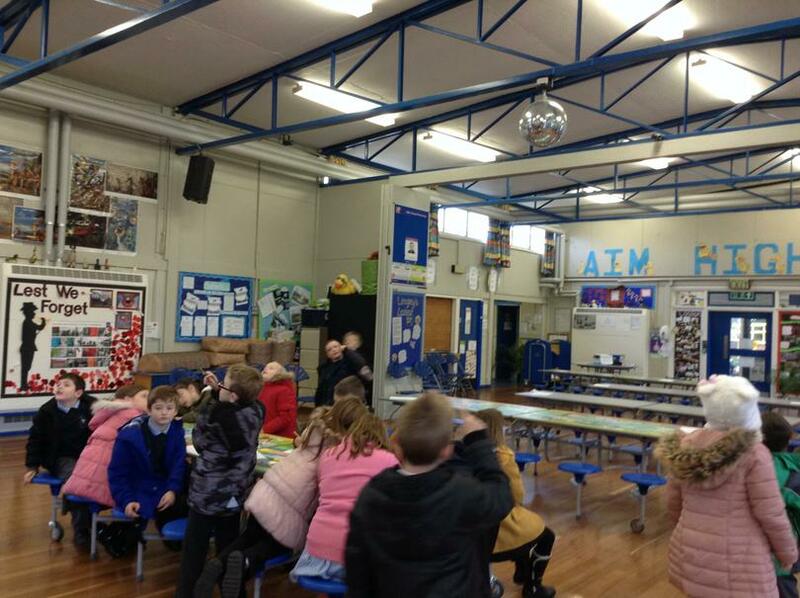 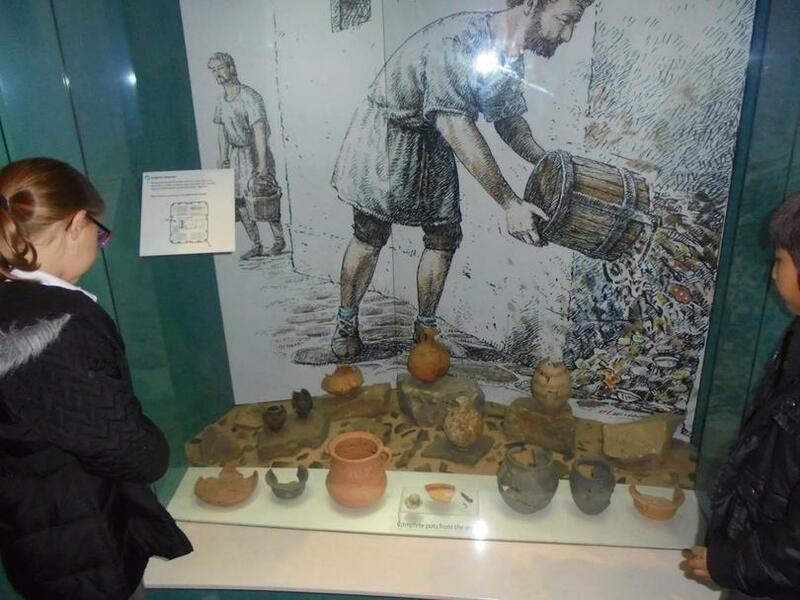 After that, we went into the Activity Room and looked at lots of different aspects of Roman life. 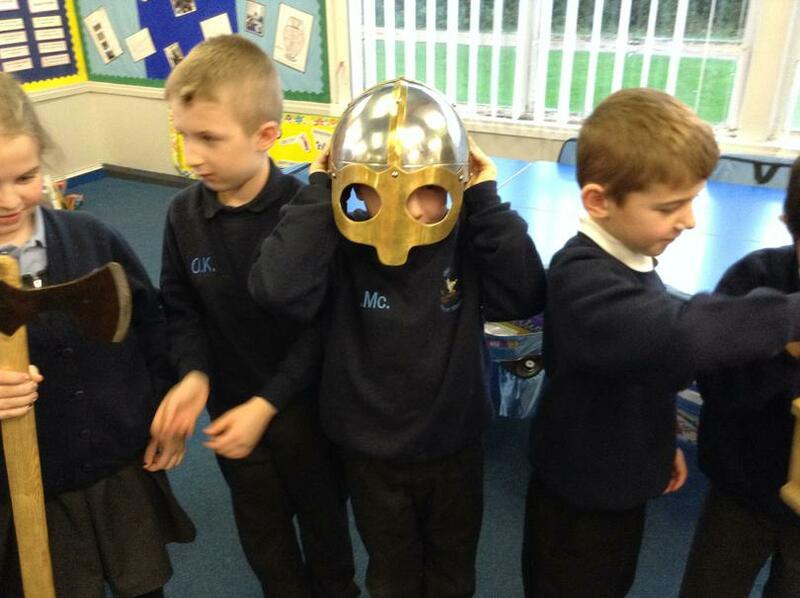 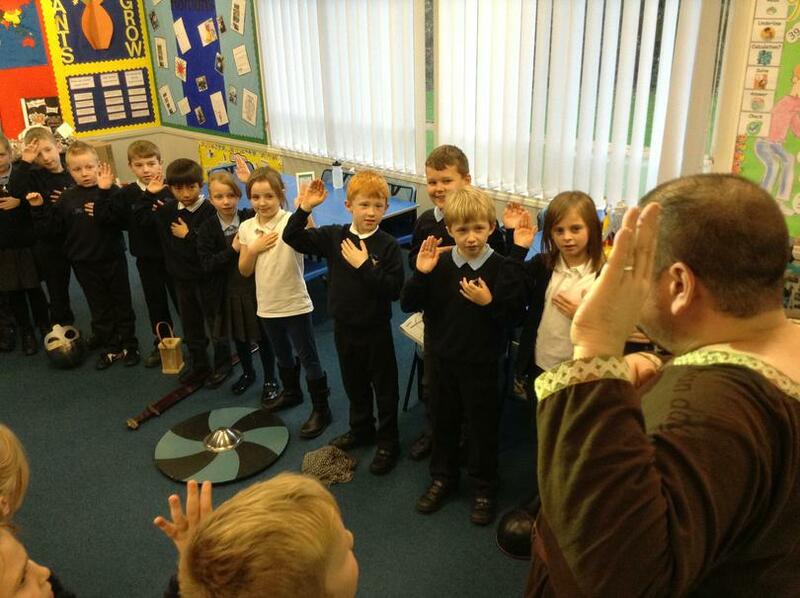 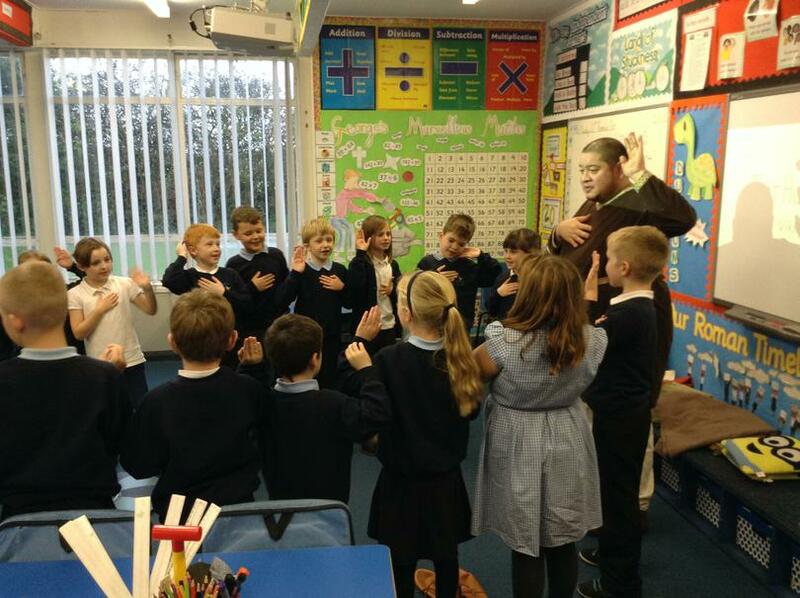 In the afternoon, we took a workshop where we pretended to be Roman soldiers. 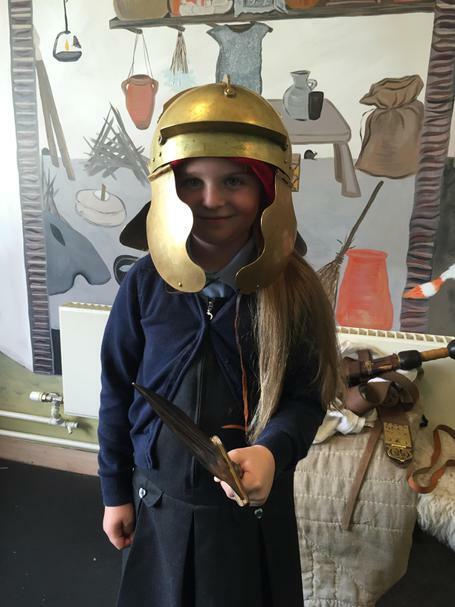 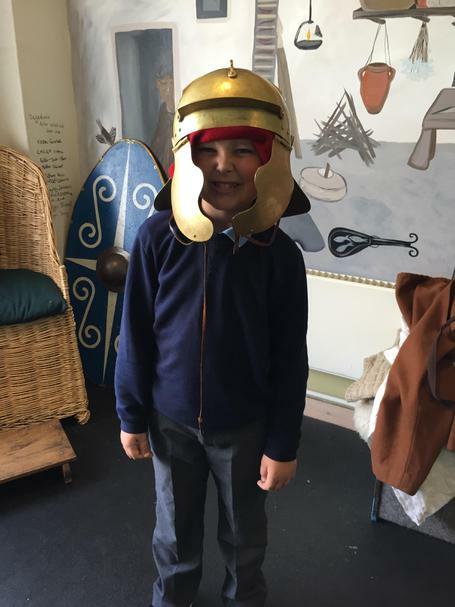 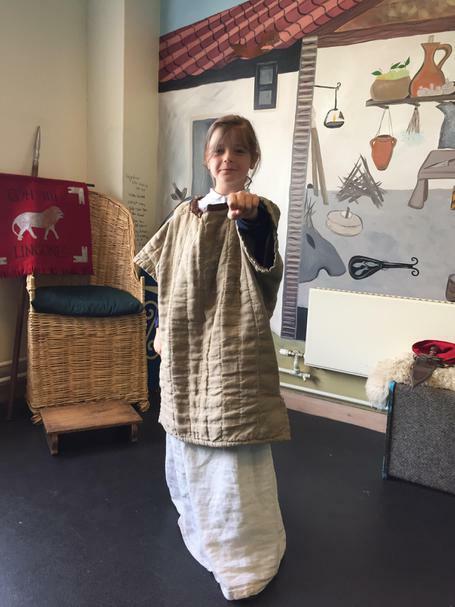 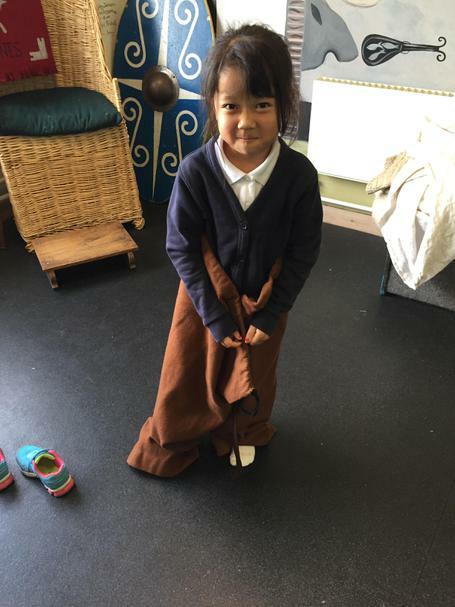 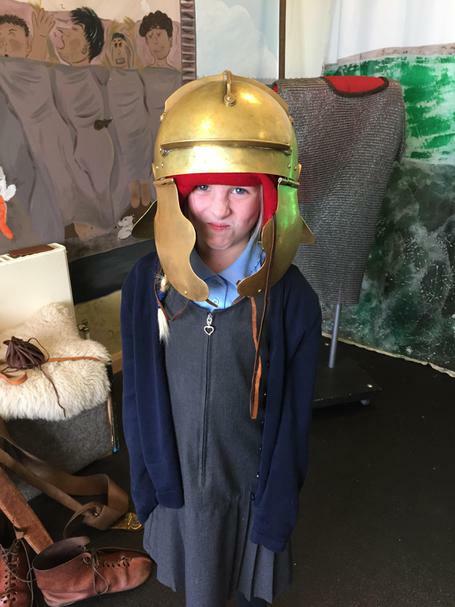 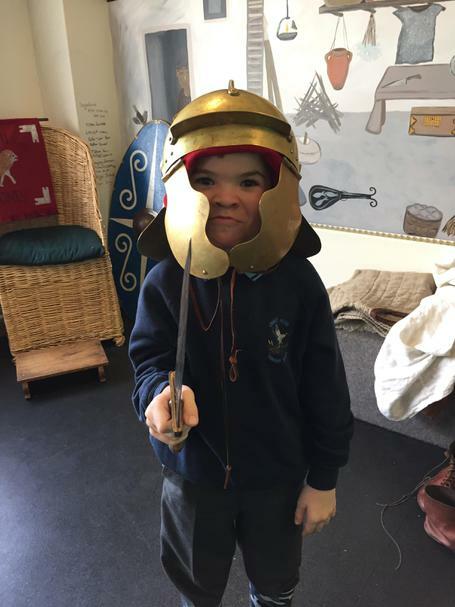 Miss Hewitt got dressed up as a Roman soldier and we had an opportunity to try on the different parts of the soldiers' uniform. 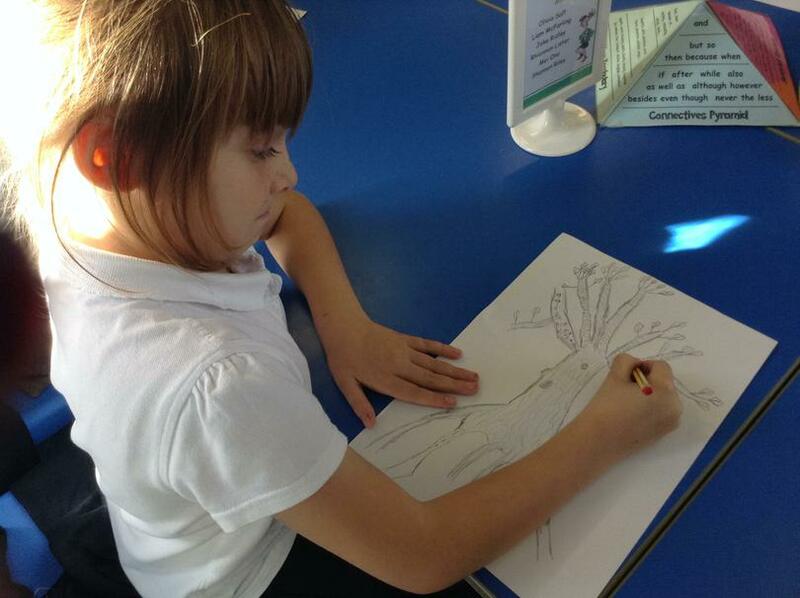 For our final piece from Arts Week, we chose to create a family tree. 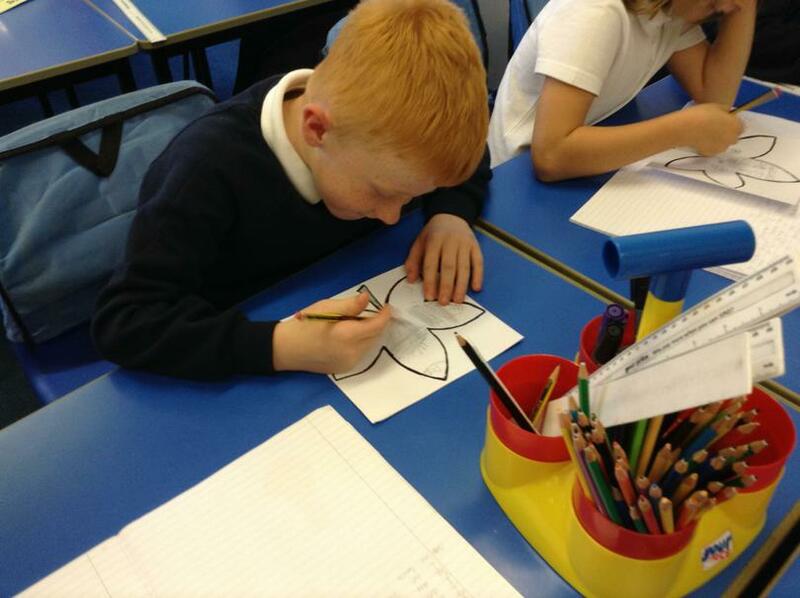 Each of us designed a family crest and drew them onto a leaf. 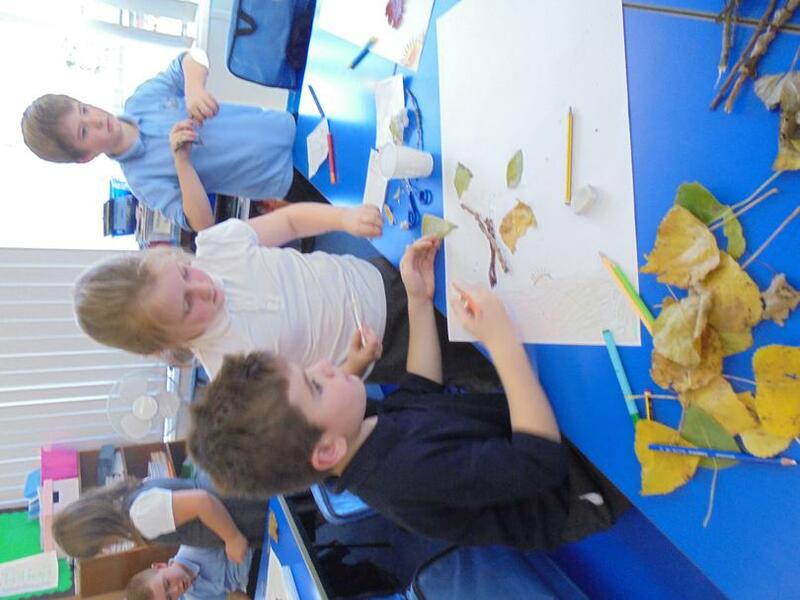 We are going to cut them out and hang them from our tree. 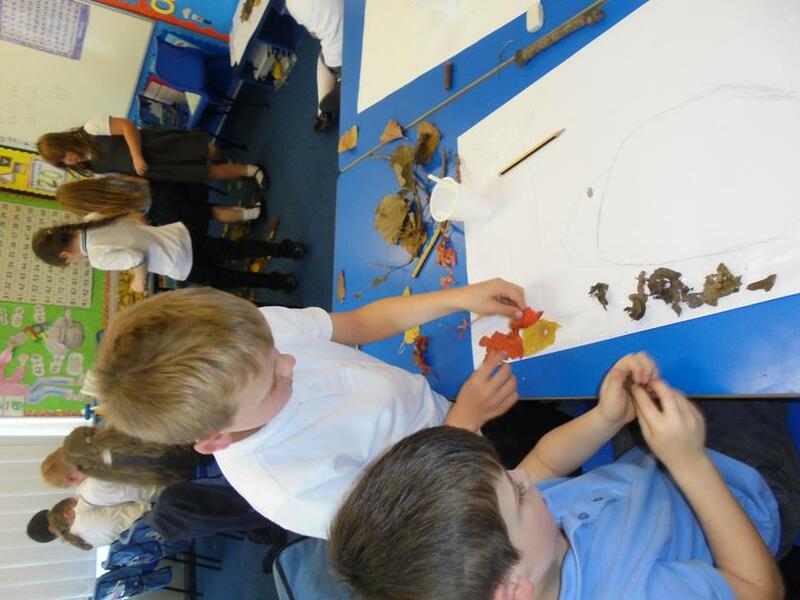 We have really enjoyed Arts Week in Year 3. 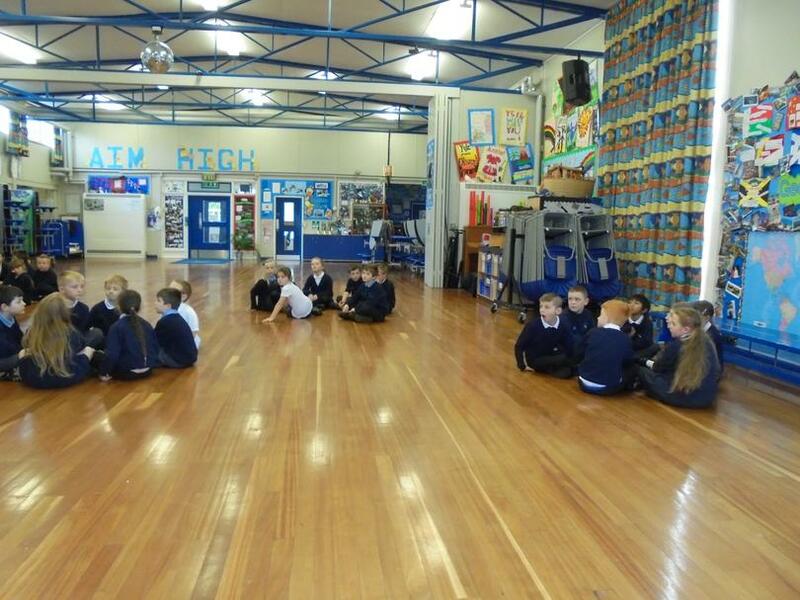 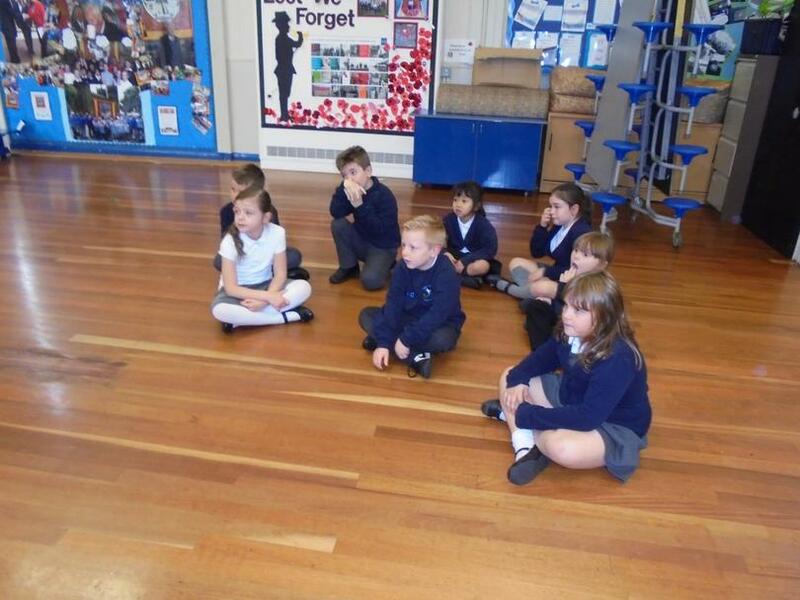 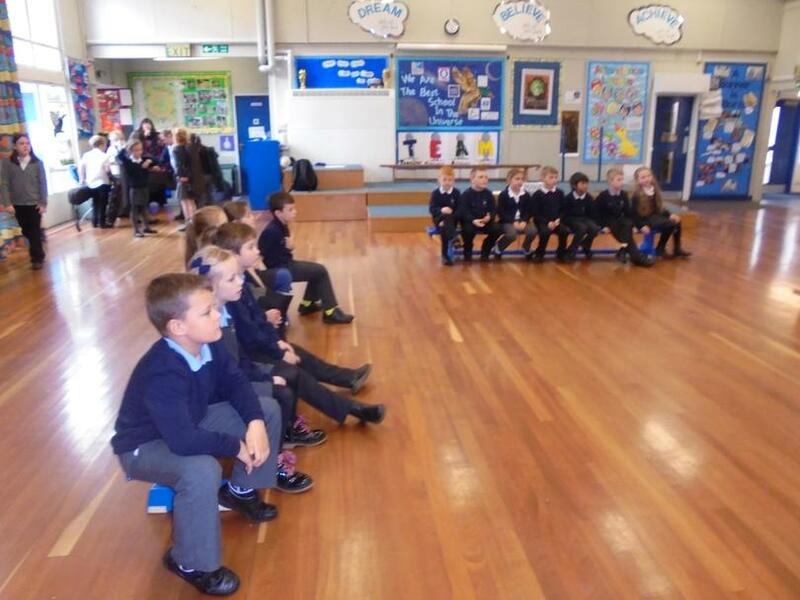 We looked at Drama during our English lesson and used a technique called 'hot-seating' to find out more information about characters. 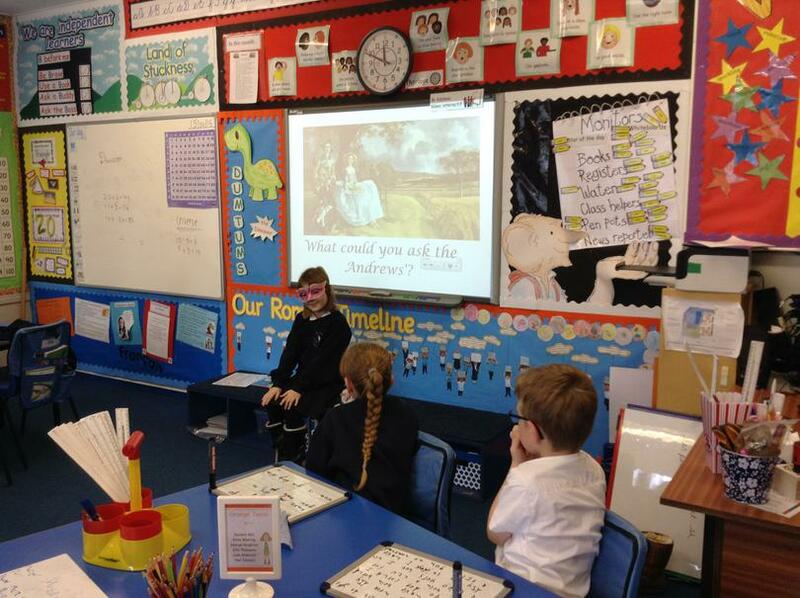 We drafted questions to ask Mr and Mrs Andrews on our whiteboards and then people were chosen at random to be the characters from the painting. 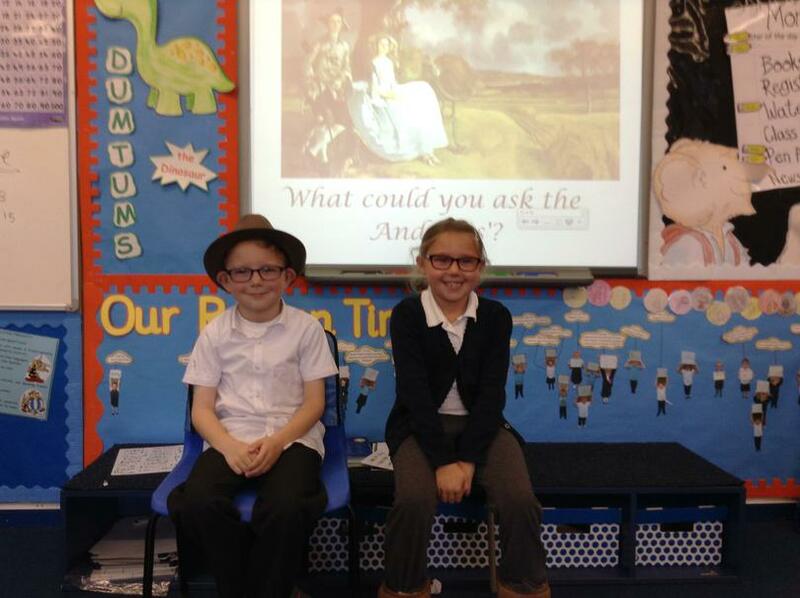 This week is Arts week and we have been looking at the painting 'Mr and Mrs Andrews' by Thomas Gainsborough. 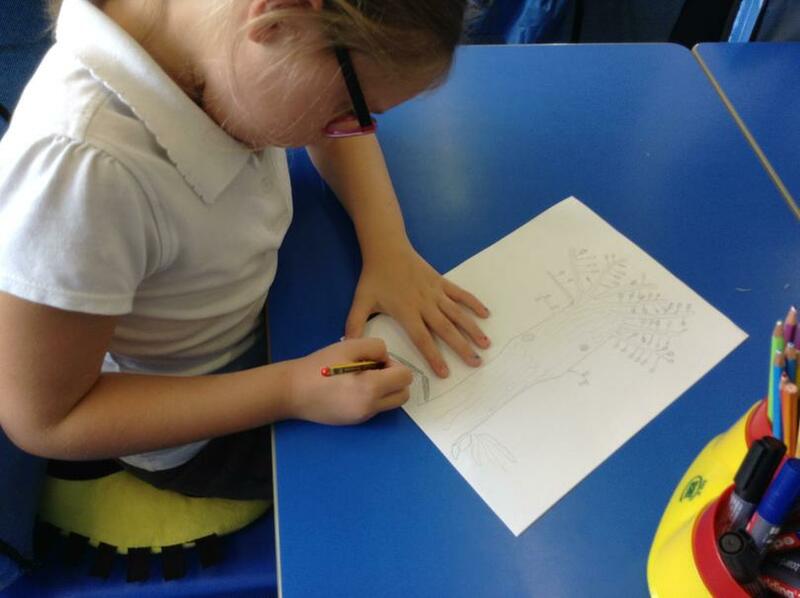 We have been exploring the link of families and family trees. 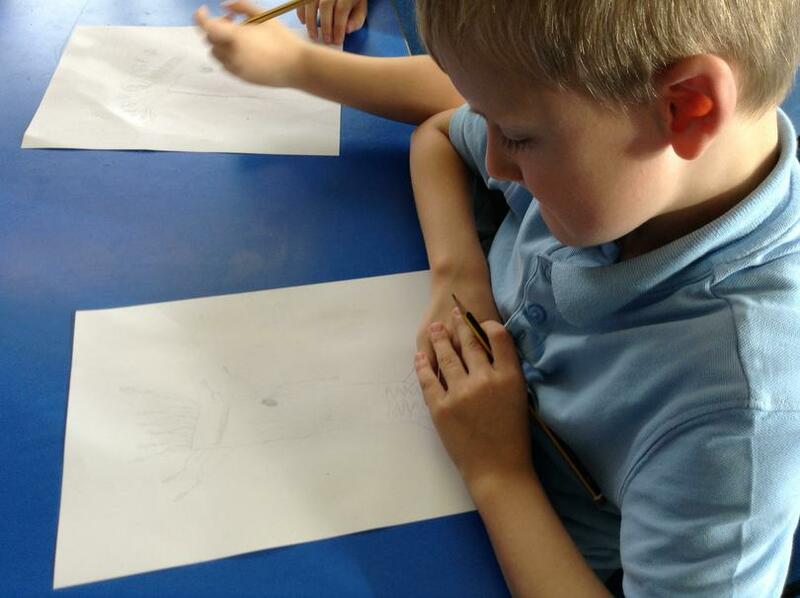 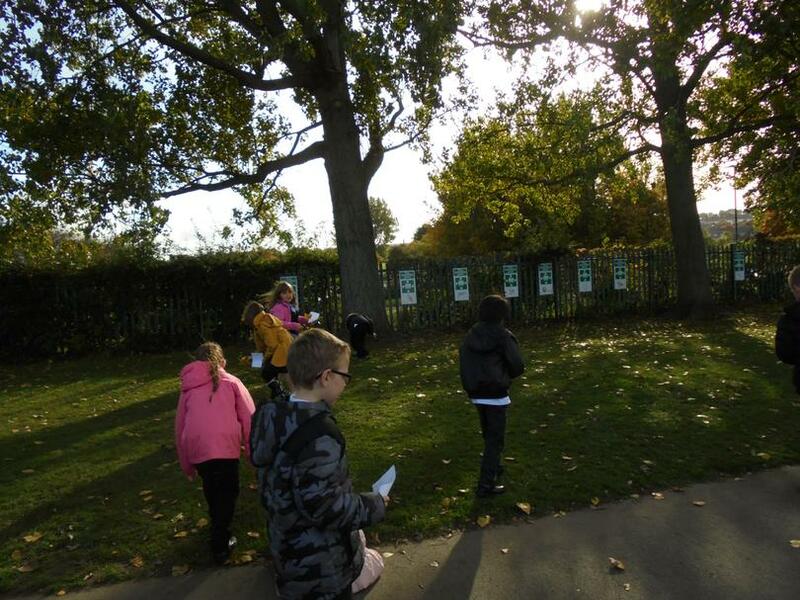 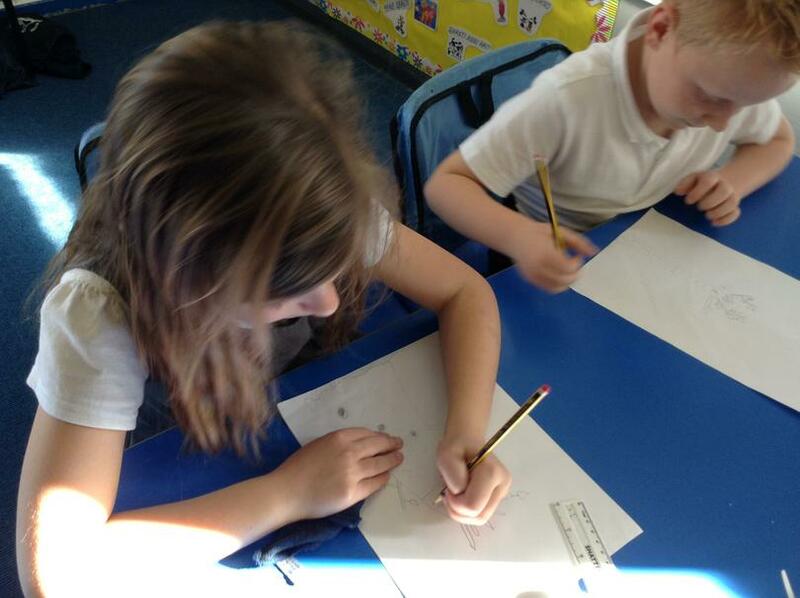 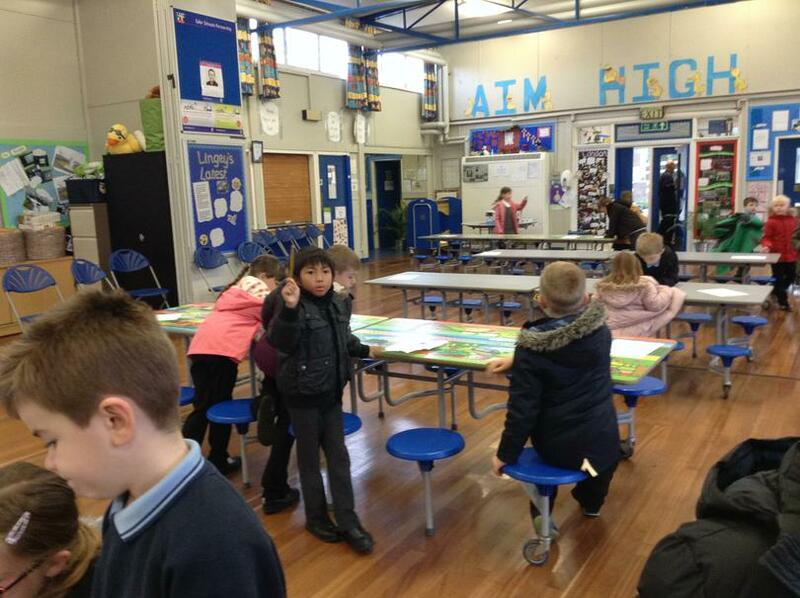 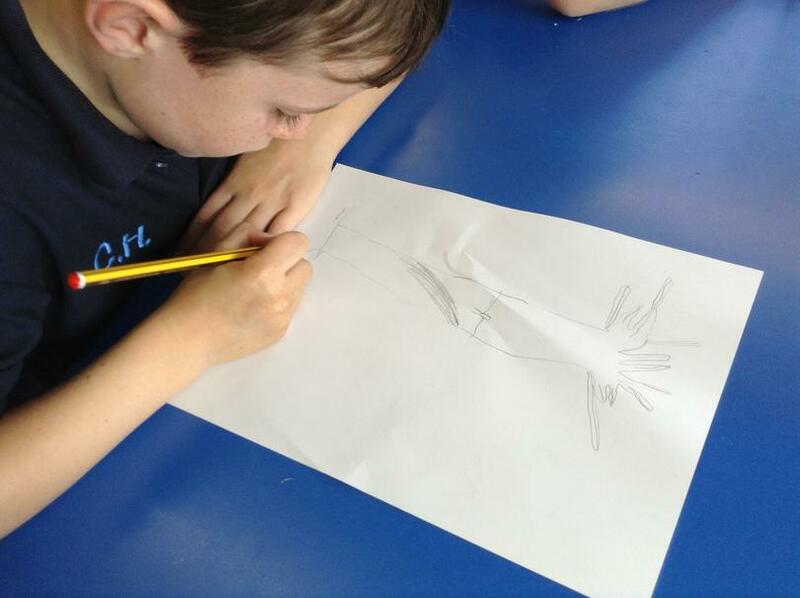 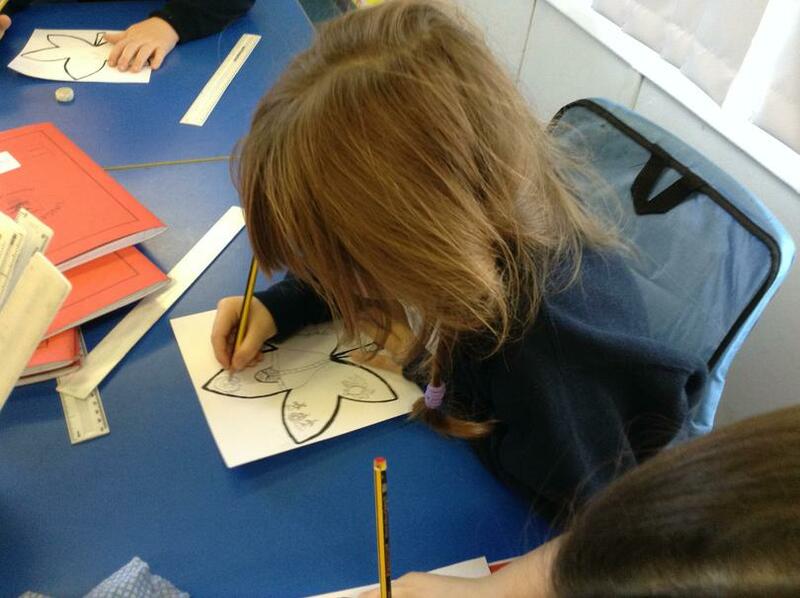 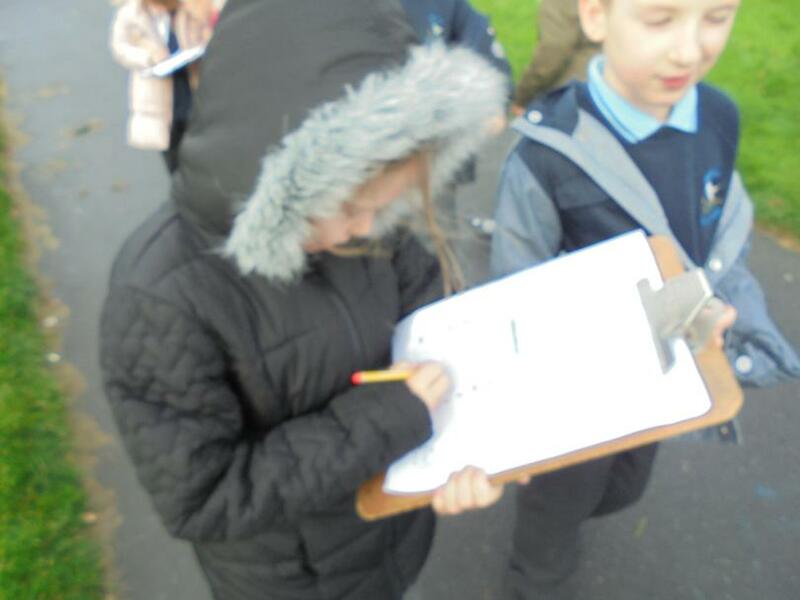 We went outside with Miss Hewitt and Miss Rickaby to look at trees and sketched our own. 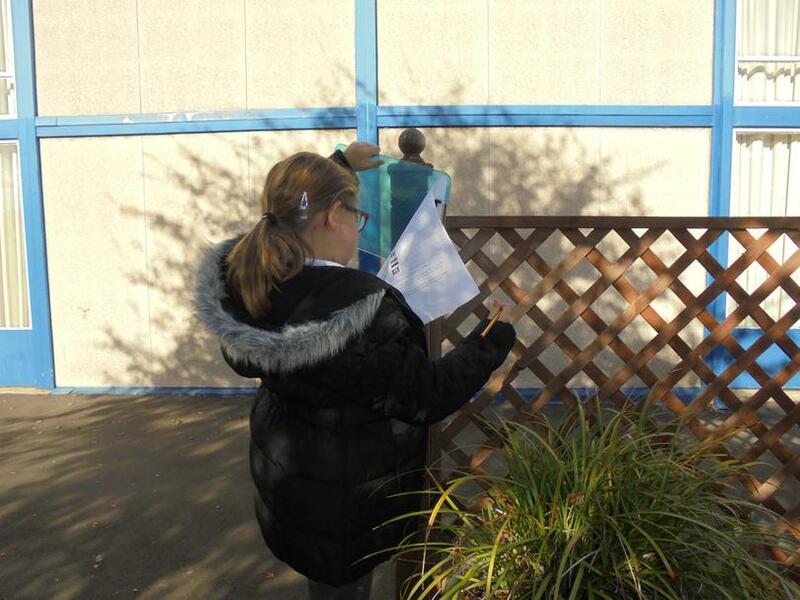 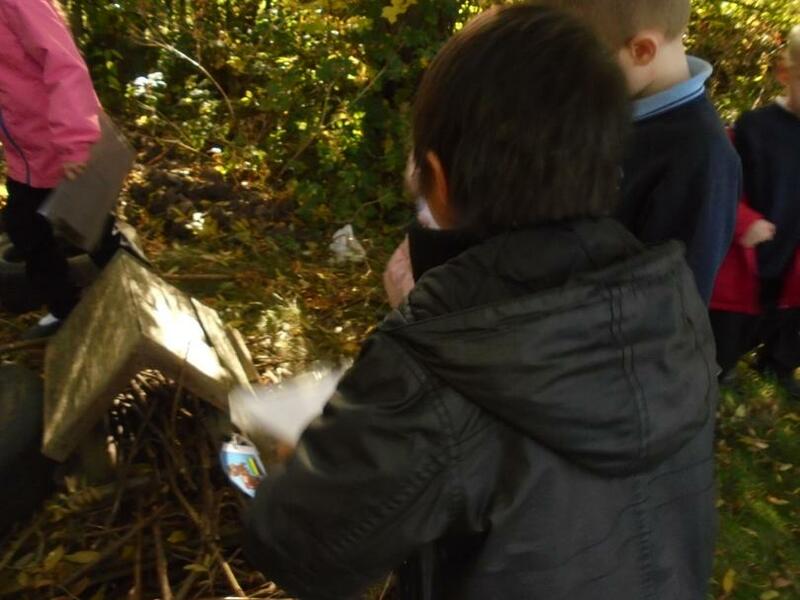 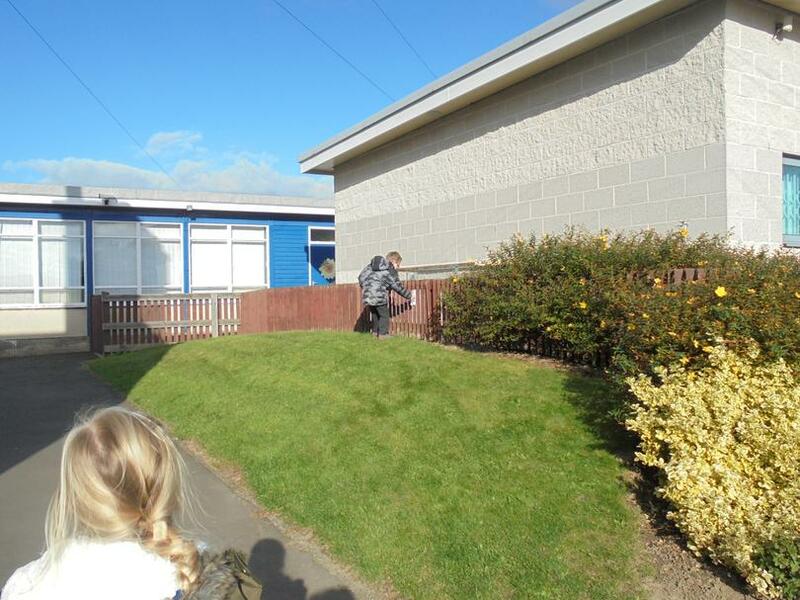 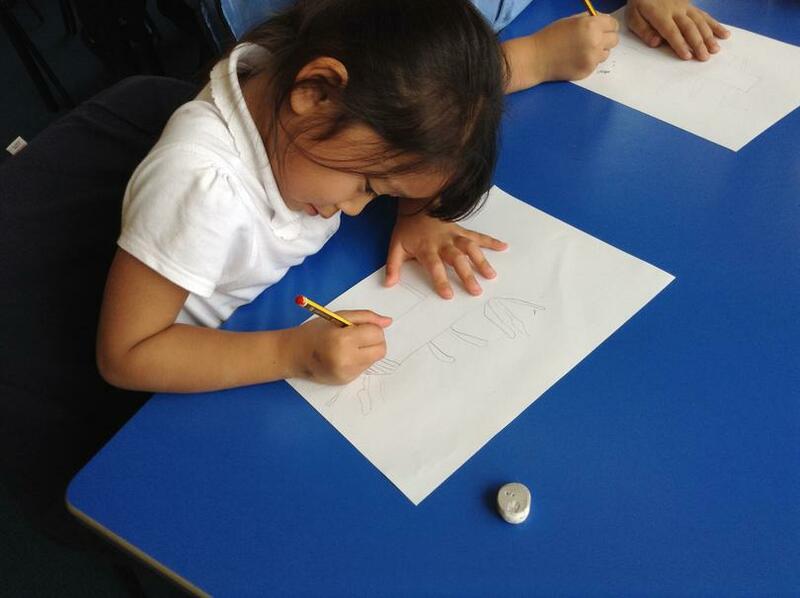 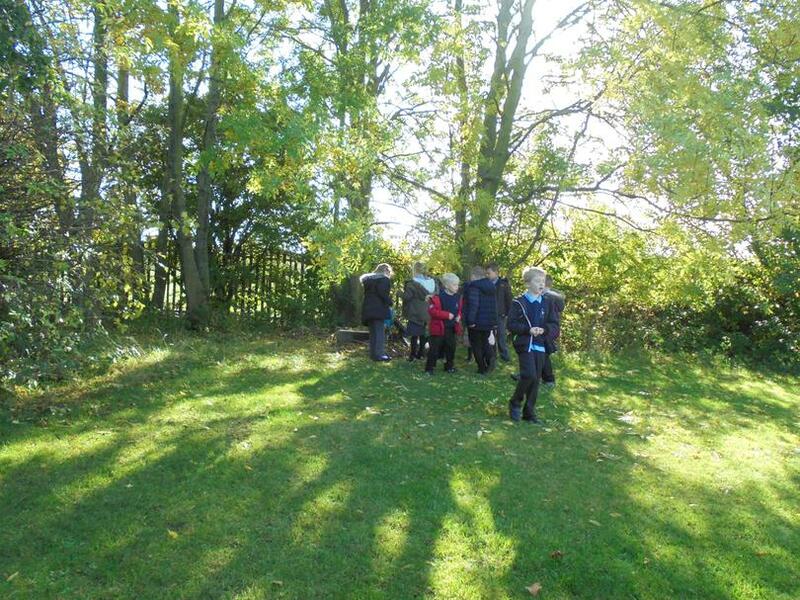 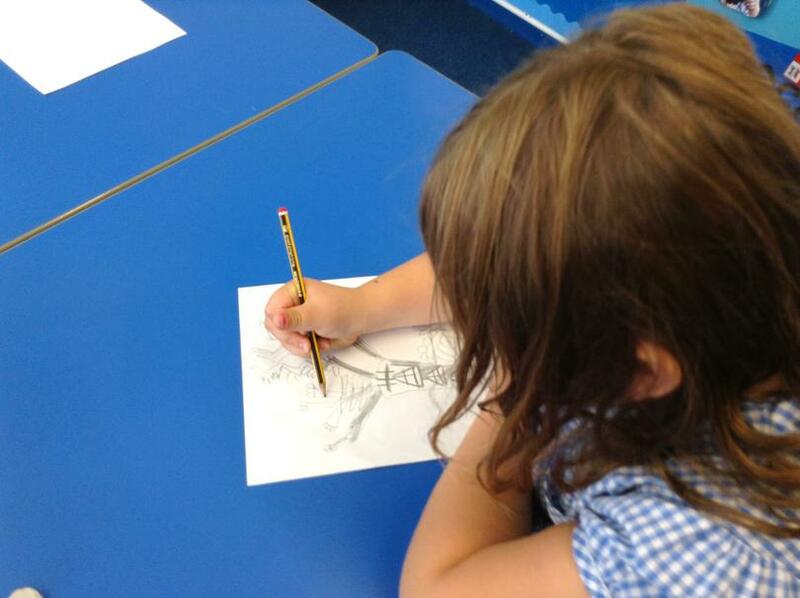 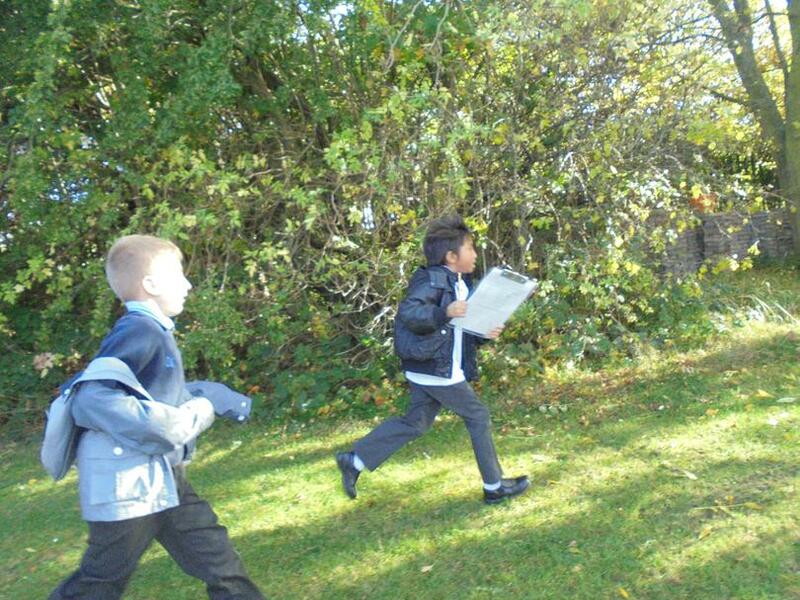 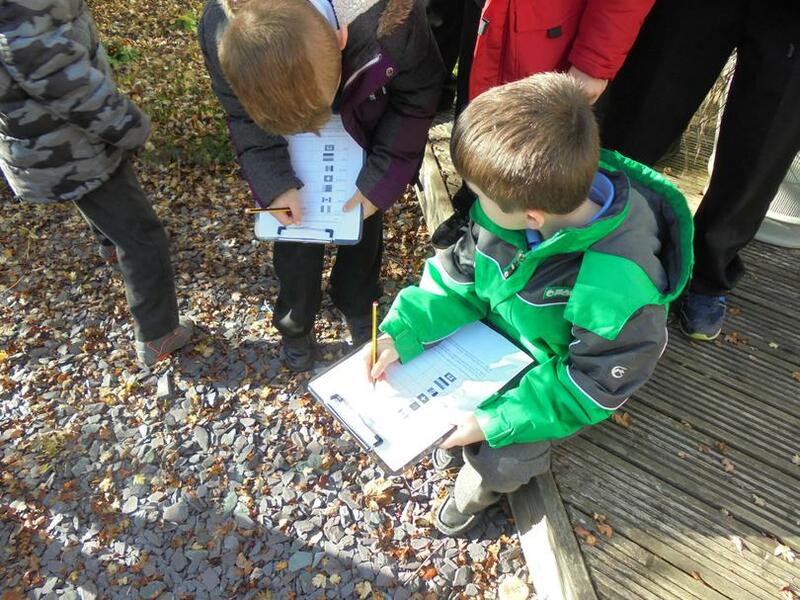 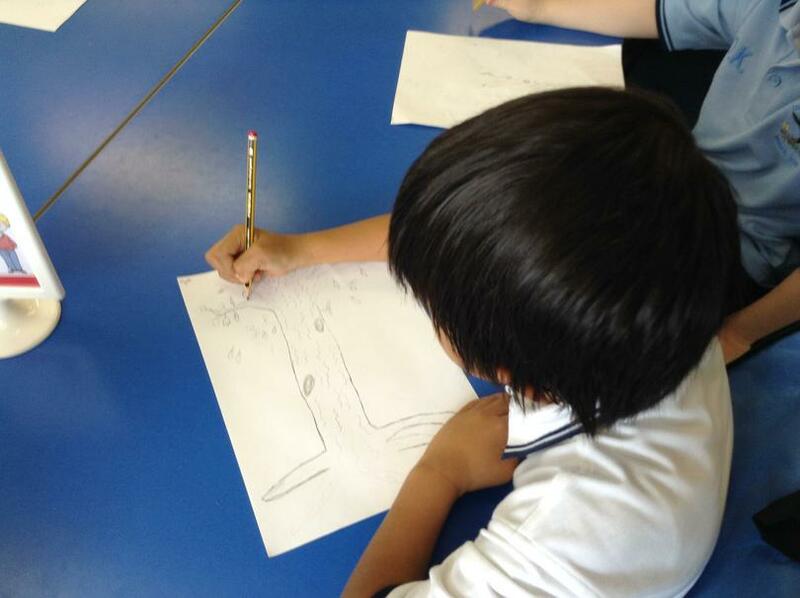 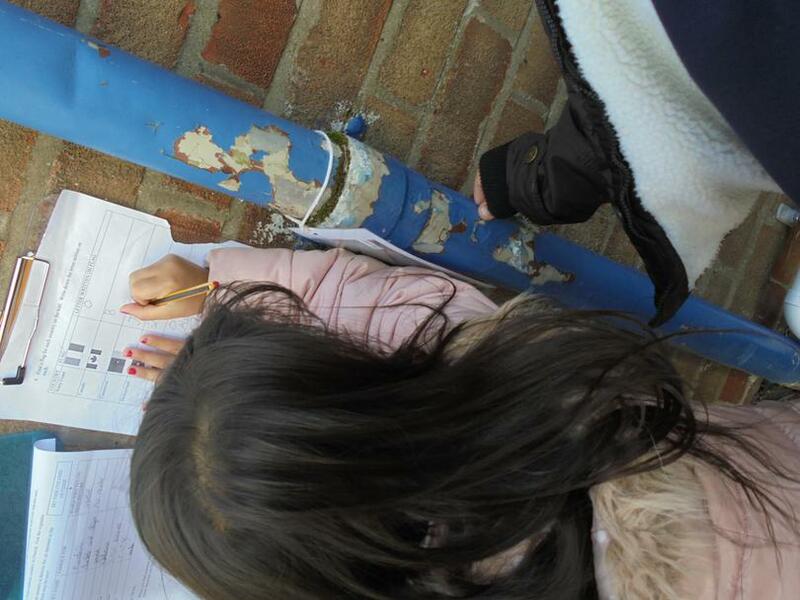 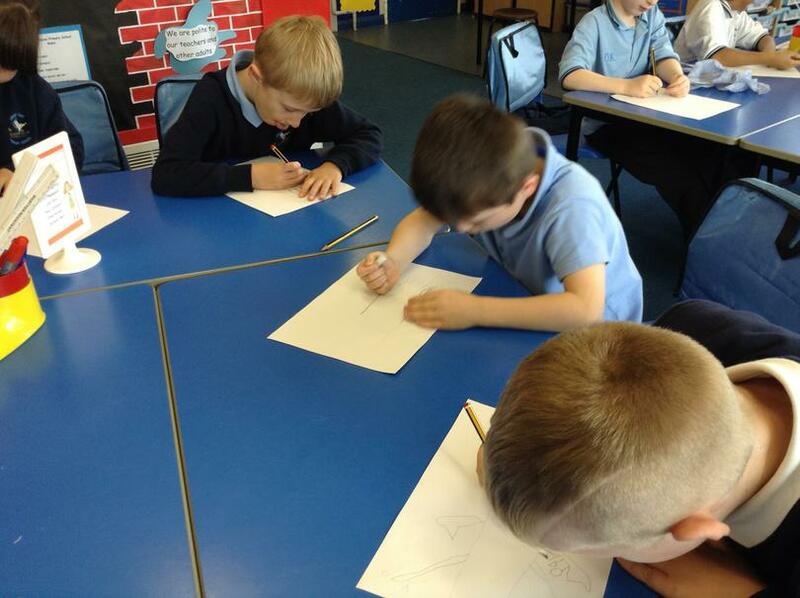 Here are some photographs of us sketching the trees we saw outside. 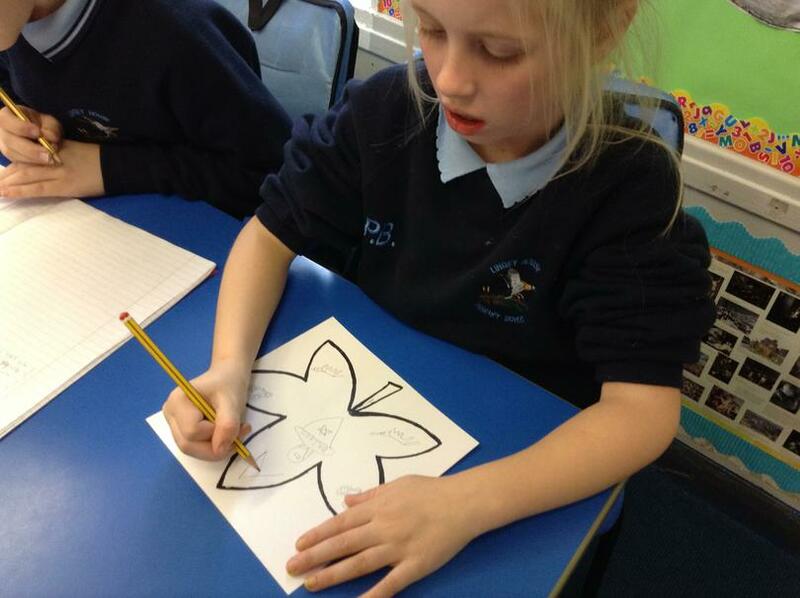 In Year 3 we always try our best. 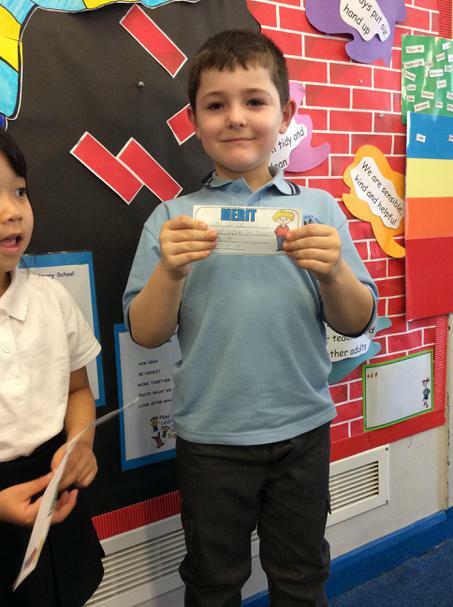 Mrs Ritchie came to hand out the merits which were on our merit board. 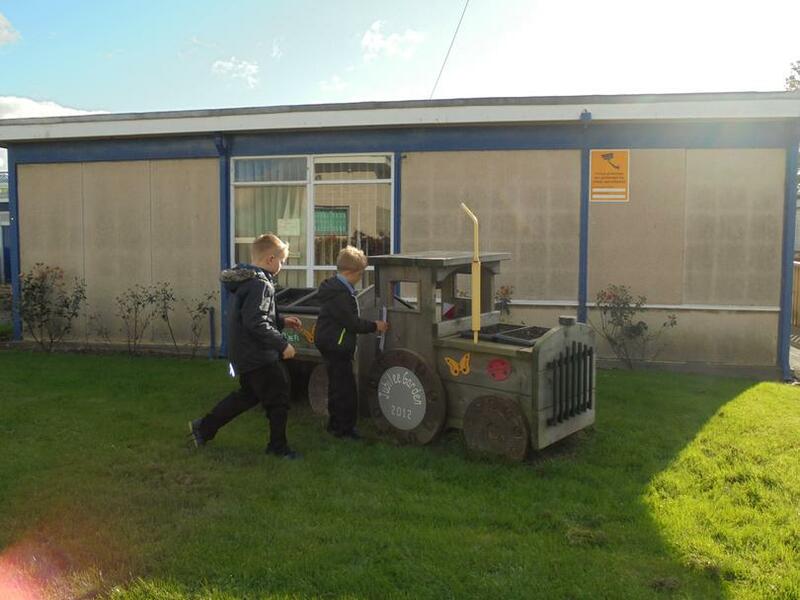 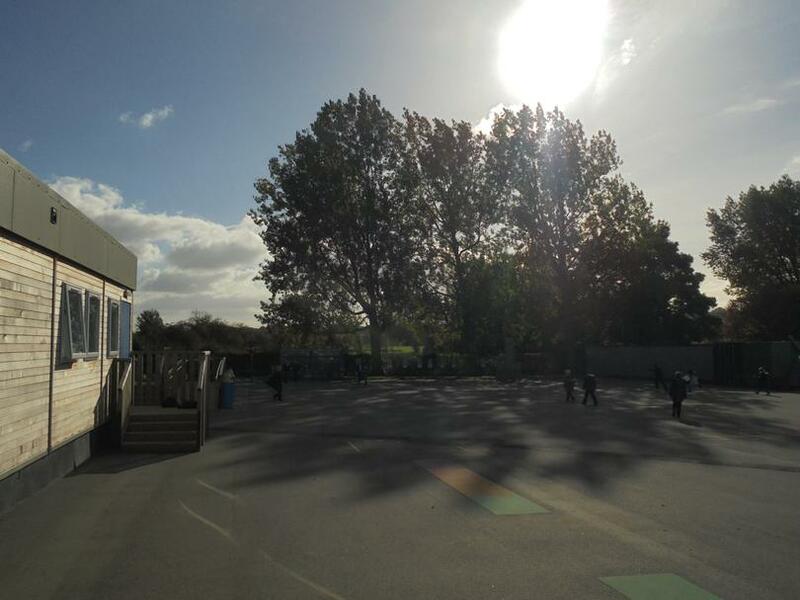 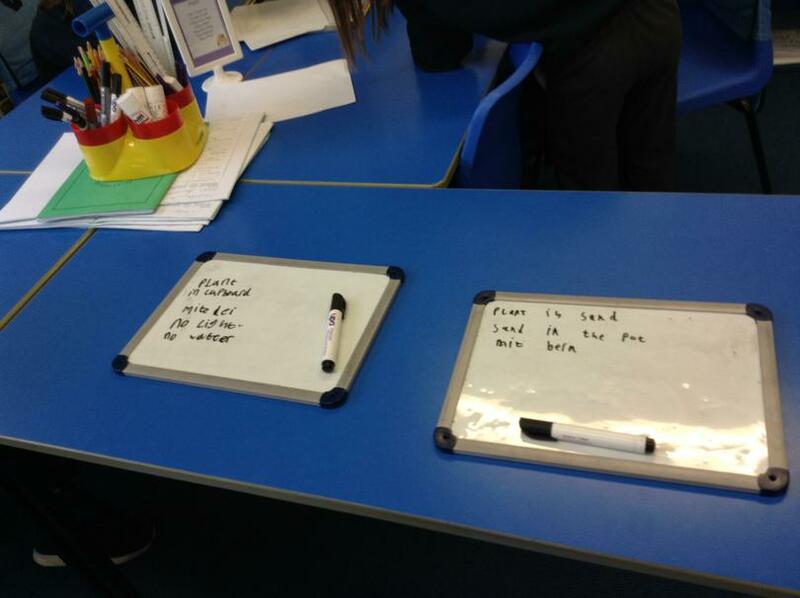 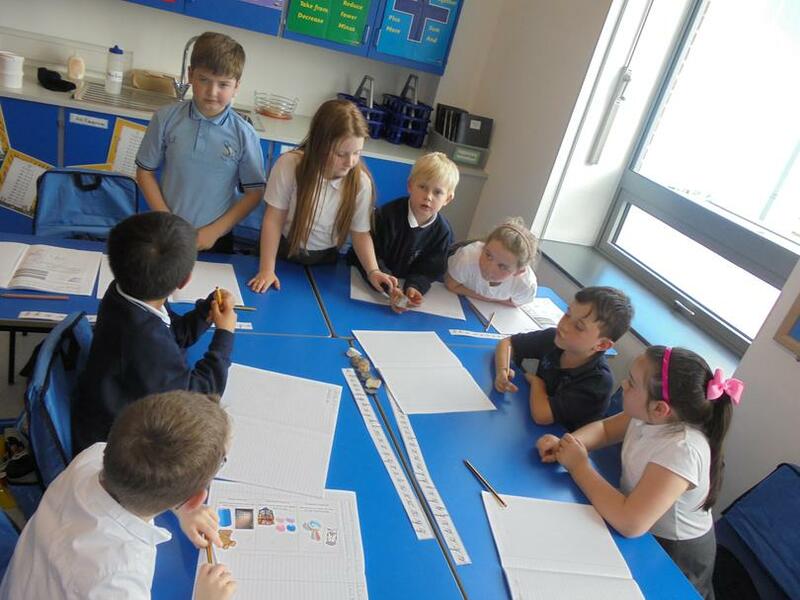 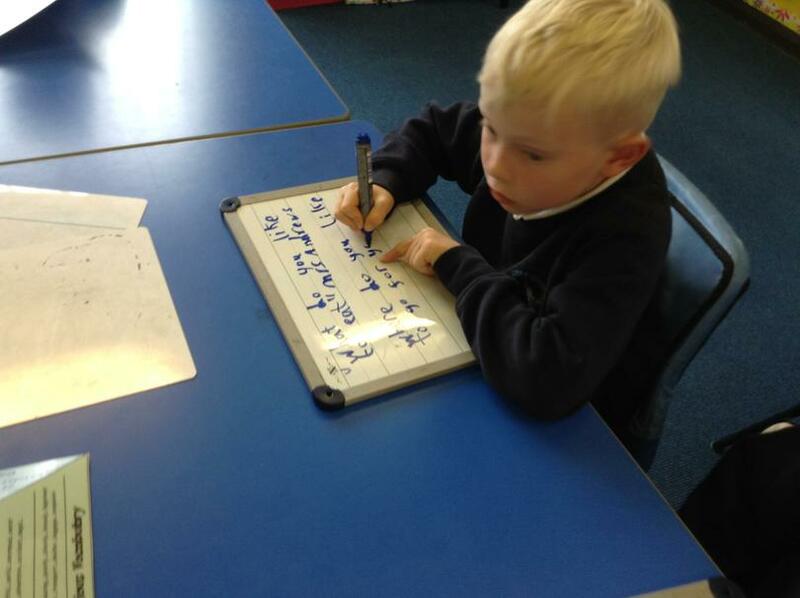 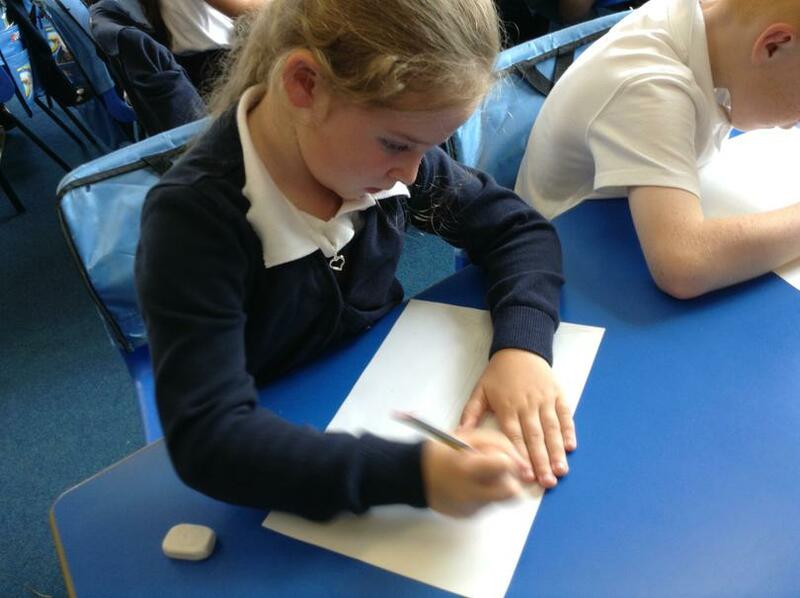 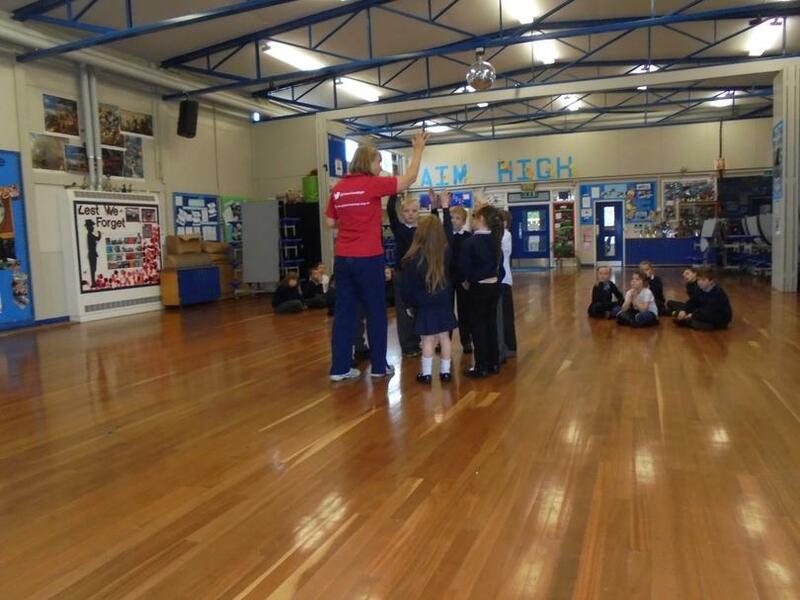 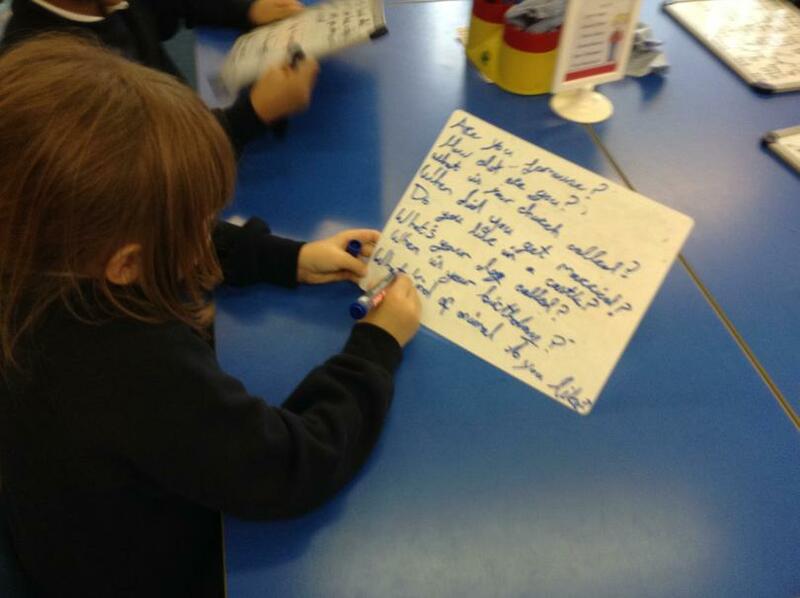 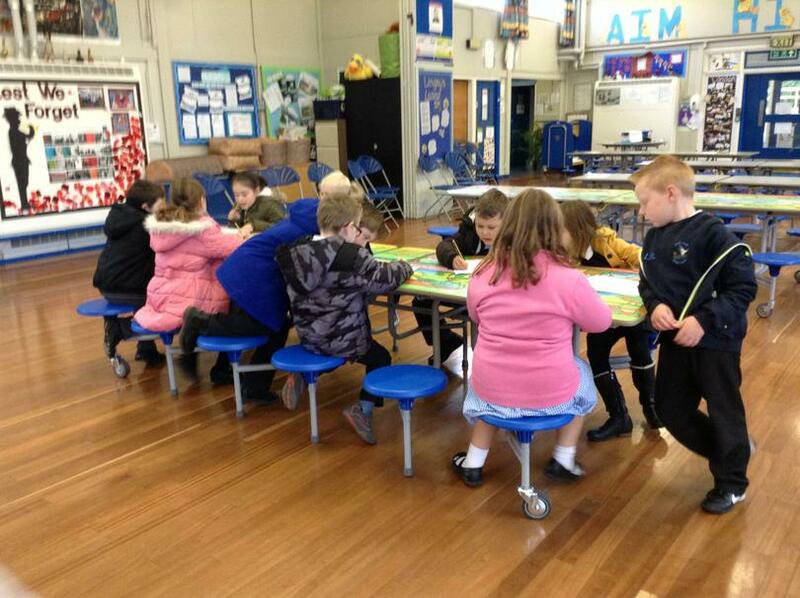 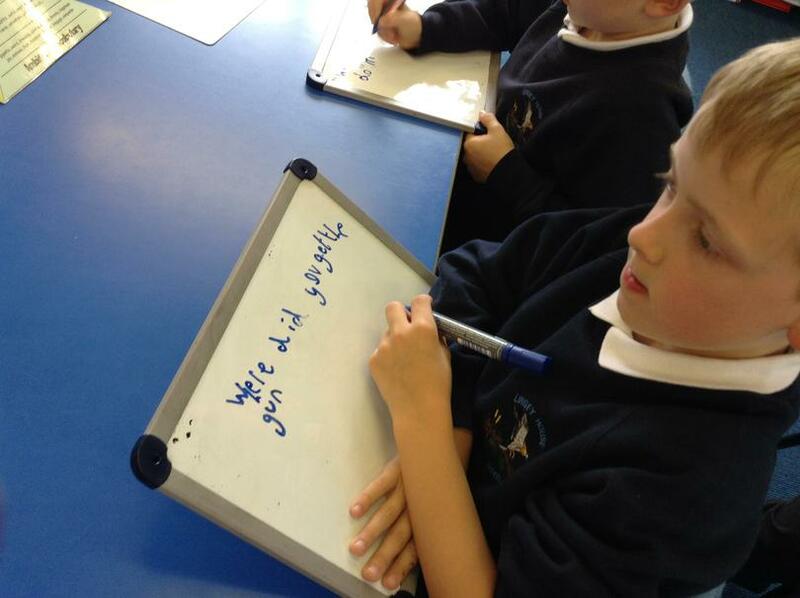 To see what we did last year in Y3 please click on the link below.